Bactericidal modules “Lazur” of large capacity have been delivered to water treatments works in Kemerov Region and in the Republic of Bashkorstan to provide disinfection of water using ultraviolet light and ultrasound. The camp site of the cattle breeding enterprise “Zavolzhski” in Tver Region is among some large projects in the agricultural sector who have implemented “Lazur” systems to provide disinfection of waste effluent of around 20,000 m3/day combined flow using ultraviolet light and ultrasound. Mutual collaboration and joint manufacture of “Lazur” systems for the disinfection of drinking water and waste effluent with ultraviolet light and ultrasound have been the subject of productive and extensive talks with a number of larger European companies. The parties have set plans for forthcoming co-operation, which will see a significant increase in the production and sales of “Lazur” systems in European, Latin American and Asian markets. On 14-15 July Svarog conducted intensive talks with the Dutch company “AWWS” on the subject of joint activities in the adaptation of “Lazur” technology for containerised modules in the disinfection of waste effluent with ultraviolet light and ultrasound. The talks resulted in the formulation of general directions for joint business development in the EC and other regions in 2016-2019. “Lazur” systems for disinfection of waste effluent have been commissioned at the large waste water treatment plant in Neman city of Kaliningrad Region. 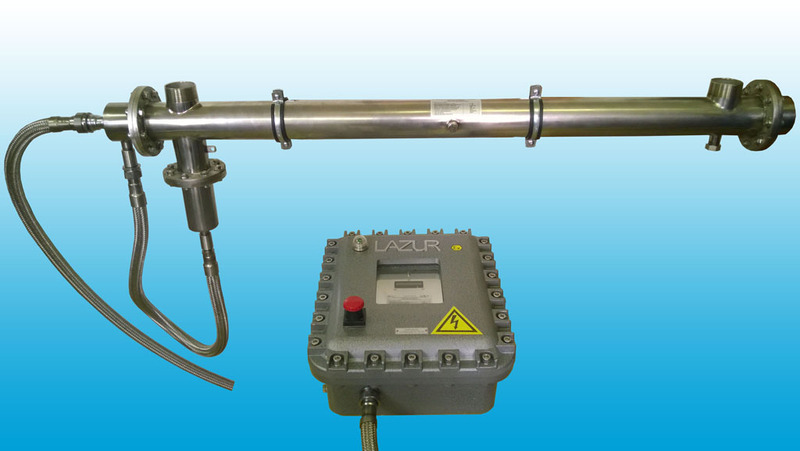 In response to the engineering requirements of oil and gas industry, the company developed a special series of “Lazur” systems for disinfection of water with ultraviolet light and ultrasound capable of operating in hazardous explosive atmospheres. Installation of “Lazur” systems for disinfection of treated waste effluent has been completed at the large water treatment site in Neman city of Kaliningrad Region. A large “Lazur” system for disinfection of surface water with ultraviolet light and ultrasound has been installed and commissioned in Wales, Great Britain. 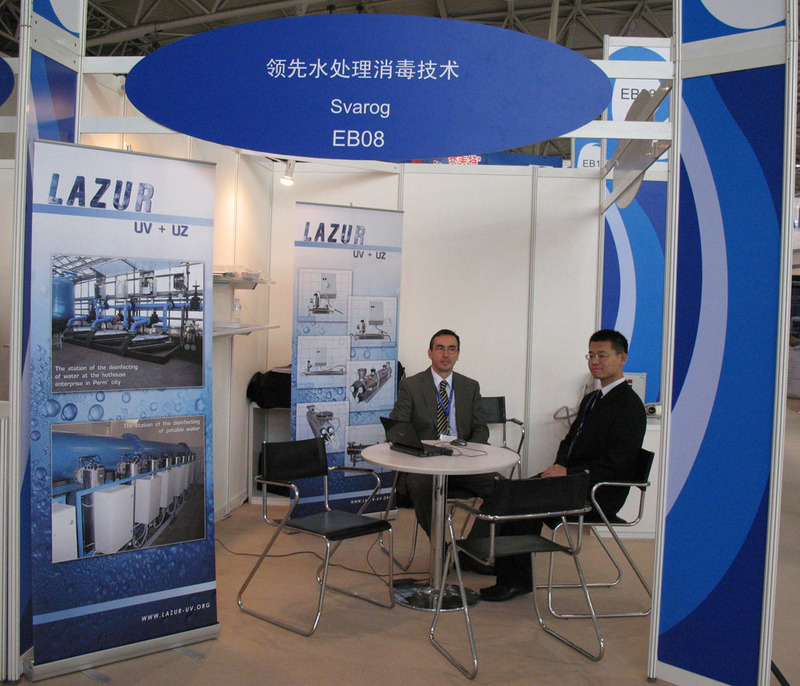 12th International Forum ECWATECH-2016 took place on 26-28 April at the VDNH Exhibition Centre, where “Svarog” company presented its latest developments of “Lazur” technology for disinfection of drinking water and waste effluent with the application of ultraviolet light and ultrasound in water treatment and water purification systems. Conference “Most Effective Technologies for Water Supply and Water Treatment” was held on 27th April at the Forum ECWATECH-2016. General Director of “Svarog” company A.N. 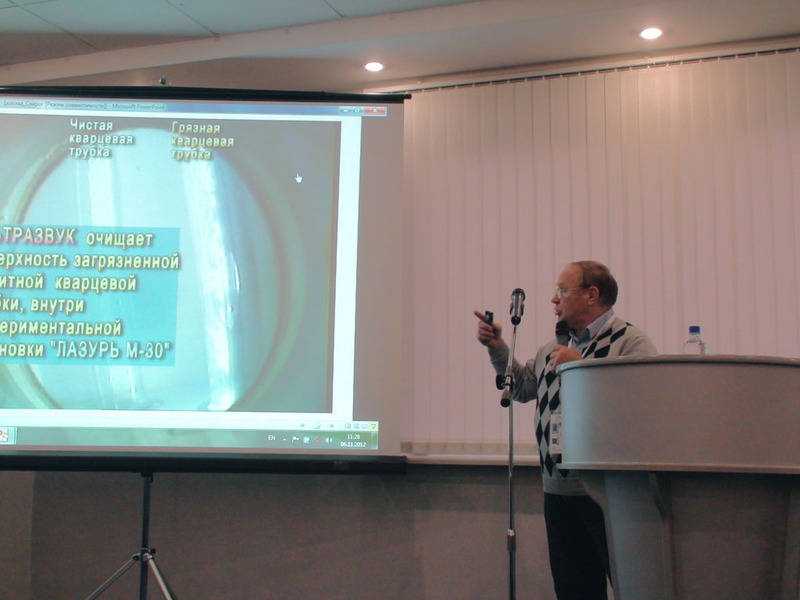 Ulyanov presented a report titled “Lazur Technology (Ultraviolet plus Ultrasound) – the most effective technology for disinfection of aqueous solutions”. Starting from 01 March 2016, “Svarog” company is making a SPECIAL OFFER for the replacement of old bactericidal systems with new “Lazur” modules. 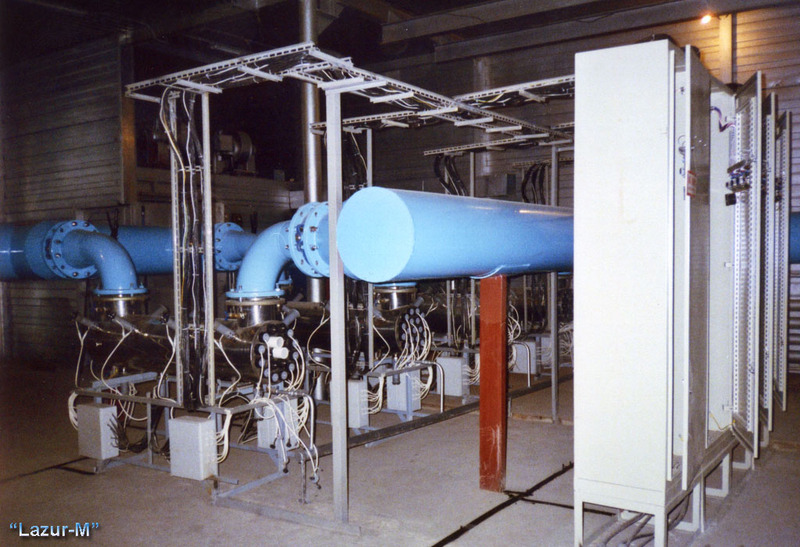 Equipment for disinfection of water and effluent with ultraviolet and ultrasound of “Lazur” series is technologically sophisticated and over the course of exploitation of 10 years or more becomes outdated. We offer new modern “Lazur” systems based on ultraviolet and ultrasound application as a direct replacement of older “Lazur” equipment at 25% discount prices. The cost of new replacement system on SPECIAL OFFER is comparable to the cost of the old equipment modernisation and refurbishment. Note: when you buy the new replacement equipment of “Lazur” series for the disinfection of drinking water and waste effluent, you will also receive 2 years of extended warranty at no extra cost! Replacement of the bactericidal equipment is technically simple and does not require additional expenses. We are celebrating 70th jubilee of A.V. Sokolov, Head of Physical Research Department, a long-serving member of our team. A wide range of bactericidal systems for disinfection of drinking water and waste effluent with ultraviolet and ultrasound have been selected for orders from British industrial, food and drink, and transport companies in the 1st and 2nd quarters of this year, setting a stable demand with good prospective for growth. The end of 2015 concluded with a sharp increase in the demand for LAZUR technology in water treatment and water conditioning systems. Total volume of orders for bactericidal systems used in the disinfection of water and waste effluent by combined UV light and Ultrasound of LAZUR series has increased by 15% in comparison with 2014. In Slovenia, in September - October 2016 LAZUR technology was tested for disinfection of drainage water to enable the agro-industrial customers to safely re-use water for irrigation of various crops sensitive to pathogenic microorganisms. In comparison with traditional UV system, LAZUR system, based on the simultaneous application of UV light and Ultrasound, demonstrated a considerably higher efficiency in the suppression of pathogenic microflora. 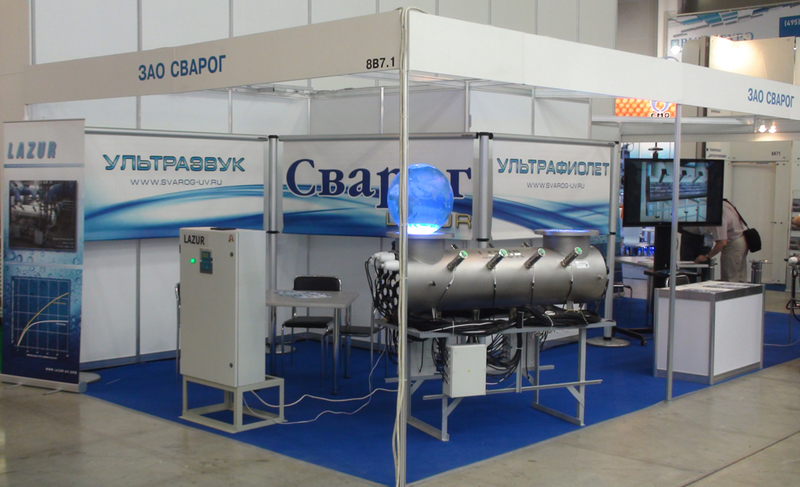 “SVAROG” company has become a permanent participant of the Exhibiting Complex in St Petersburg Water Cluster, where our unique technology LAZUR for disinfection of water with Ultraviolet Light and Ultrasound is presented at a designated stand. SVAROG line of products has passed all required tests under CE Directives. Now all bactericidal systems of LAZUR series for disinfection of drinking water and waste water with UV light and Ultrasound carry mark in accordance with SNAS Reg. No.009/P-018 Certificate. 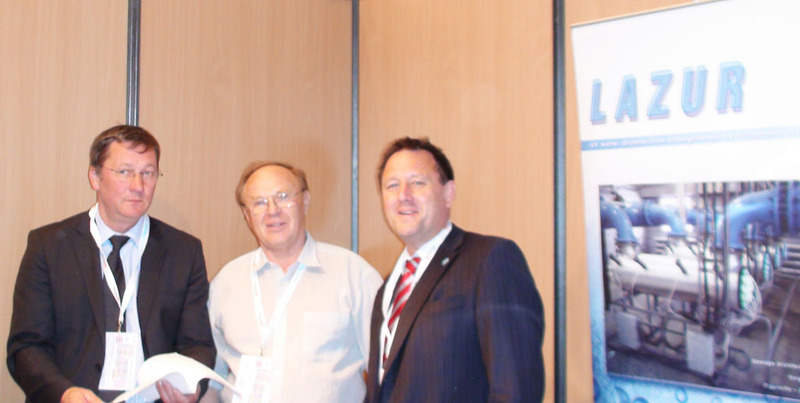 Institute of Water Annual Conference 2015 took place on 9th-10th July in Cambridge, England. The conference theme was “Business in the New World; Innovation – Collaboration – Transformation”. Bactericidal system “Lazur” was presented at the conference as a highly efficient technology for disinfection of water and effluent with UV light and Ultrasound in water treatment and water purification applications. The conference exhibition proved to be very successful – with over one hundred contacts with key personnel from various British water utilities, contractors and consultants at executive level. 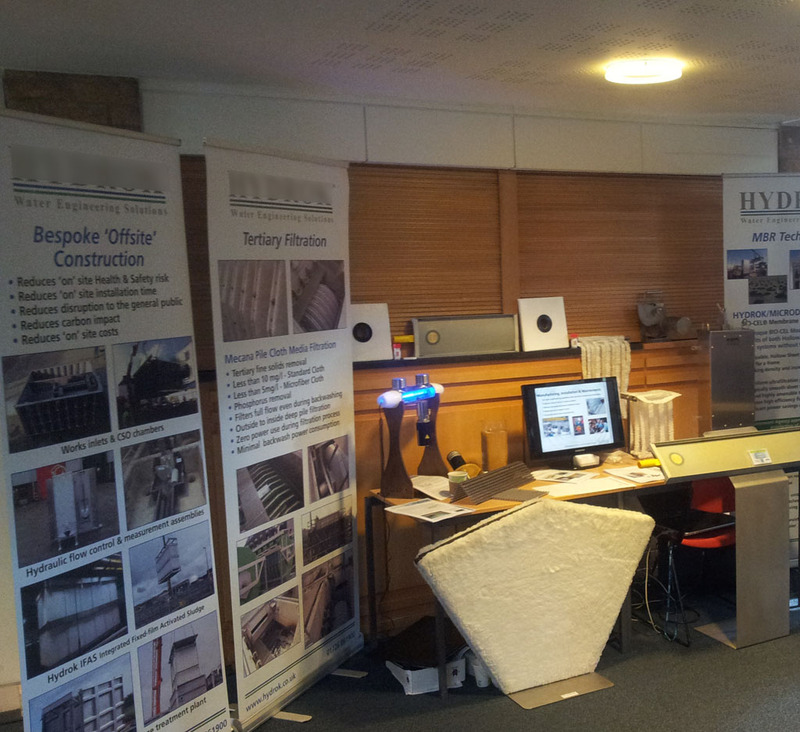 International exhibition "Water, Sewerage & Waste" took place in Polmont (Scotland) on 4th June and in Derby (England) on 11th June. “Lazur” technology was presented at both exhibitions and demonstrated the capability of environmentally-friendly operation, without any need for mechanical or chemical cleaning. “Lazur” systems are utilised in the disinfection of drinking water and waste effluent with UV light and Ultrasound in water treatment systems. 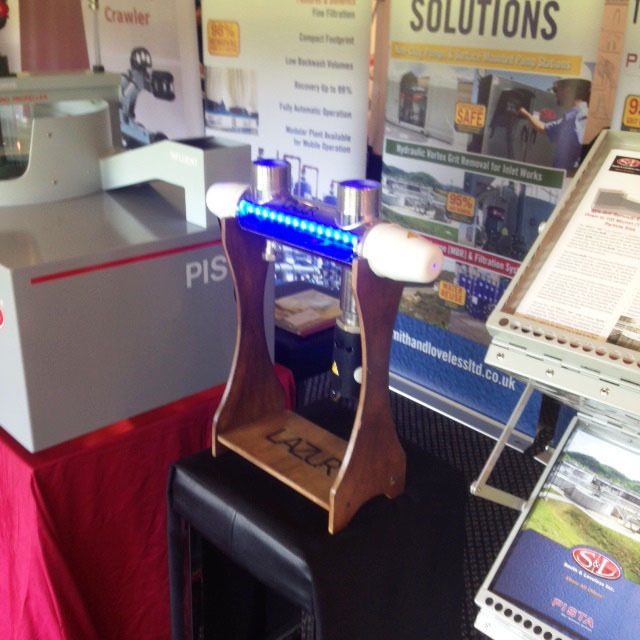 "Pump Centre Conference & Exhibition 2015" took place on 14th May at the International Centre in Telford (England). “SVAROG” company exhibited its latest bactericidal system “Lazur” for disinfection of water and waste effluent in water treatment and water purification installations. 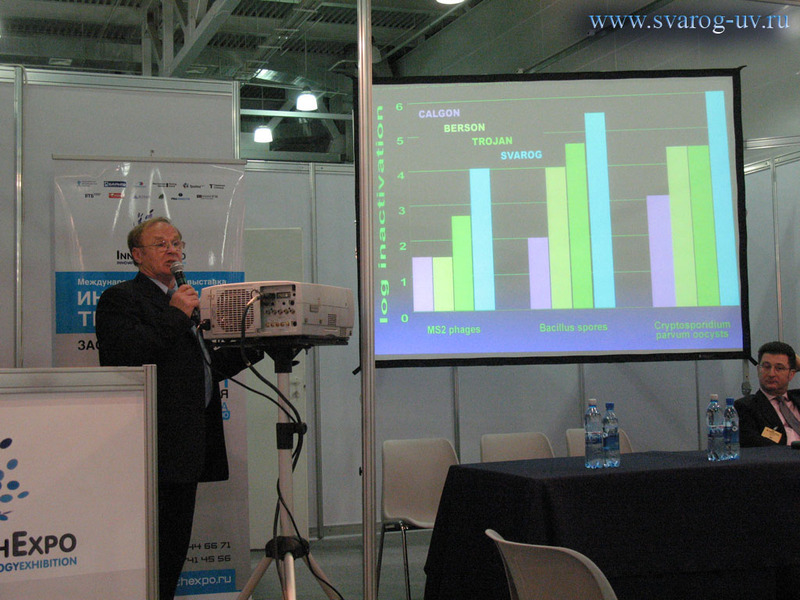 VII Neva International Environmental Congress was held on 28-29 May in St Petersburg. Within the Congress agenda, St Petersburg Water Utility organised a round table with the discussion theme “Systemic management of water resources: water quality and water usage”. At this table, “SVAROG” formulated a proposal for the formation of a Test Centre (in line with the principles of the European Council Directive 96/61/EC concerning Integrated Pollution Prevention and Control (IPPC) on the basis of St Petersburg Technological Park. “SVAROG” has joined the board of permanent partners at the Technological Park and set up a display of an operating bactericidal system “LAZUR” in the exposition hall of the Park to demonstrate the disinfection of drinking water and waste water with UV light and Ultrasound. IWEX - International Water and Effluent Exhibition 2015 was held on 21-23 April at the National Exhibition Centre in Birmingham (England). More than 150 exhibitors demonstrated their capabilities, and over 3,000 participants visited the exhibition. This exhibition is one of the most influential events in area of new technologies and equipment for water treatment and water purification. Water disinfection technology “Lazur” attracted strong interest from both, the participants and the exhibitors, and a whole range of potential applications was discussed with the interested parties. The First Technical Exposition / Seminar was held on the 8th April at the premises of the Information and Education Centre of St Petersburg Water Utility. “SVAROG” representative in the North-West Federal Region Mr S.V. Skopinsky delivered a report “Main advantages of LAZUR technology in the disinfection of water using UV light and Ultrasound”. 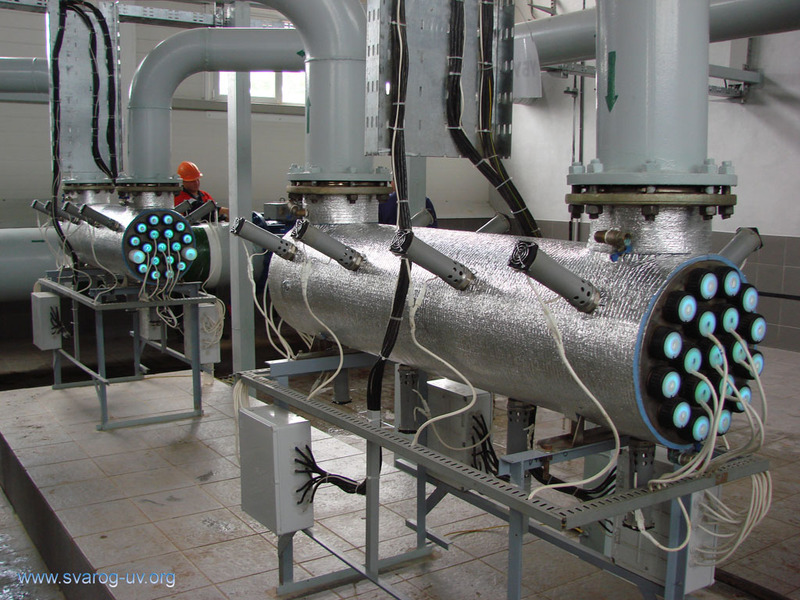 A project for the supply of “Lazur” water treatment and water disinfection systems based on the application of UV light and Ultrasound to the population of Crimea is successfully unfolding. A project for the supply of large bactericidal modules “Lazur” to the Netherlands has moved on to the final stages, These large flow-rate bactericidal units equipped with the UV lights and the Ultrasound were fabricated in accordance with strict requirements of American Standards. 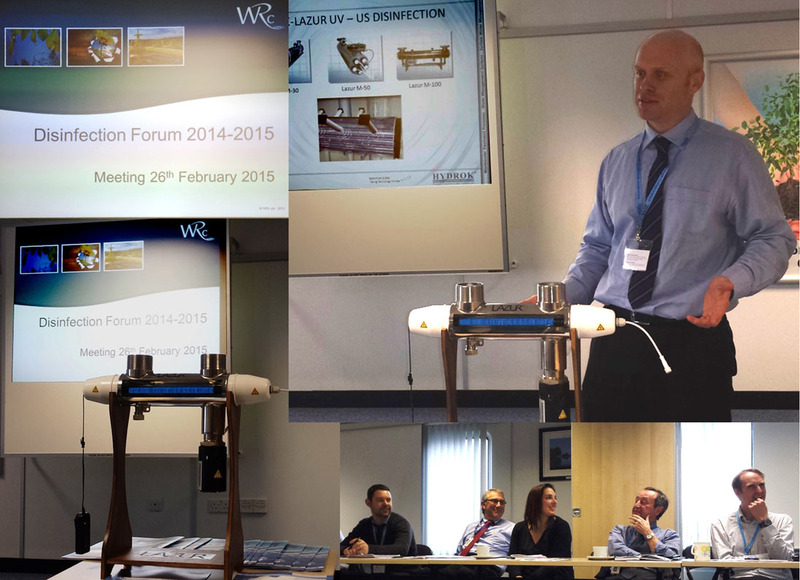 “Lazur” technology for disinfection of drinking water and waste effluent with UV and Ultrasound was presented at the Disinfection Forum 2014-2015 held at WRc (Water Research Center) in Swindon, Great Britain. Forum participants represented UK largest water utilities, regulatory bodies (such as Drinking Water Inspectorate) and research organisations. “Lazur” technology attracted great interest among the attending specialists and prompted discussions about possible collaborations. 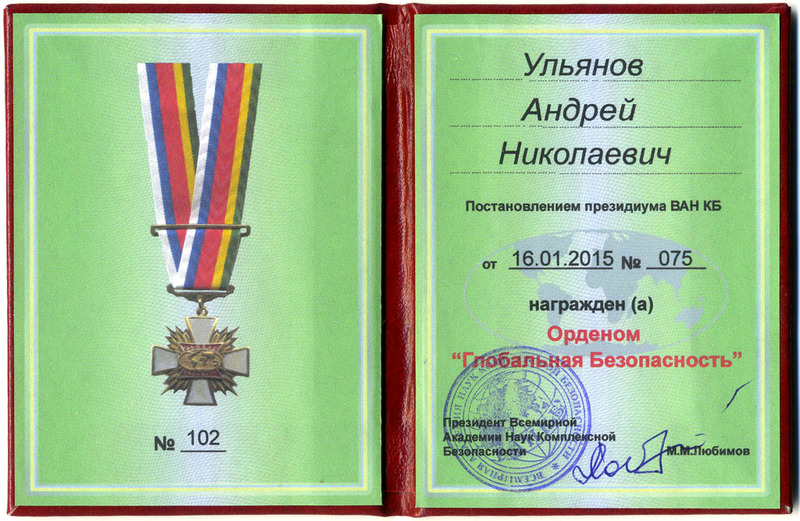 Presidium of "VANKB" in accordance with its resolution №75 of 16 January 2015 awarded Mr A.N. 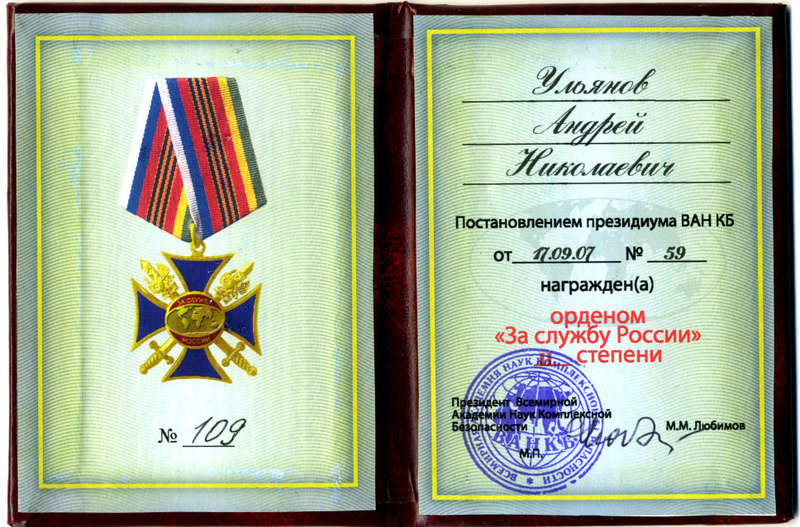 Ulyanov with the order “Global Security” to mark his great contribution to the cause of environmental security of the Russian Federation. 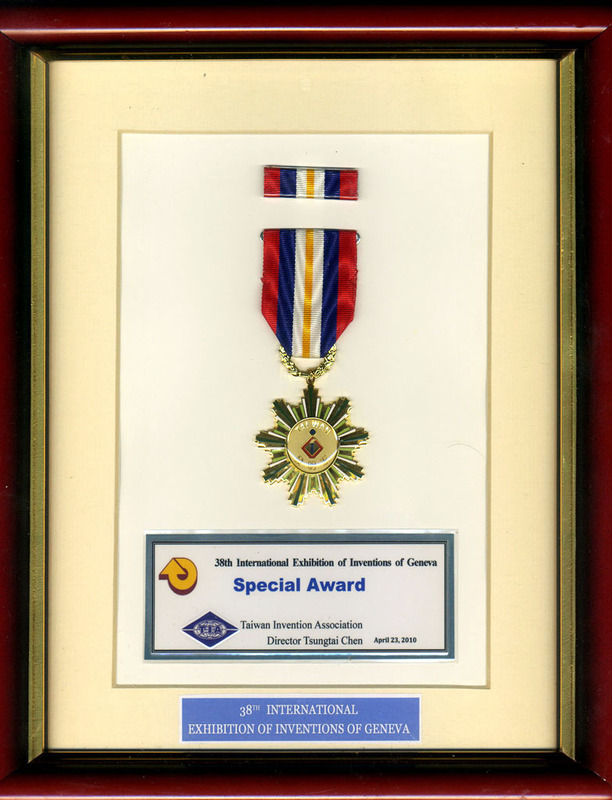 This award highlights Mr A.N. 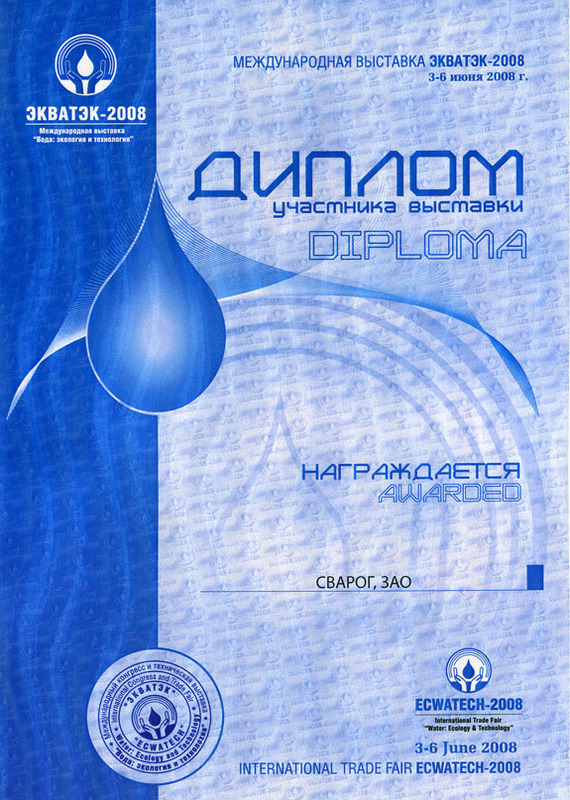 Ulyanov's achievements in the design and application of efficient technologies for drinking water and waste effluent disinfection with UV light and Ultrasound, which contribute into the provision of environmental security of the country. The award was presented to Mr A.N. 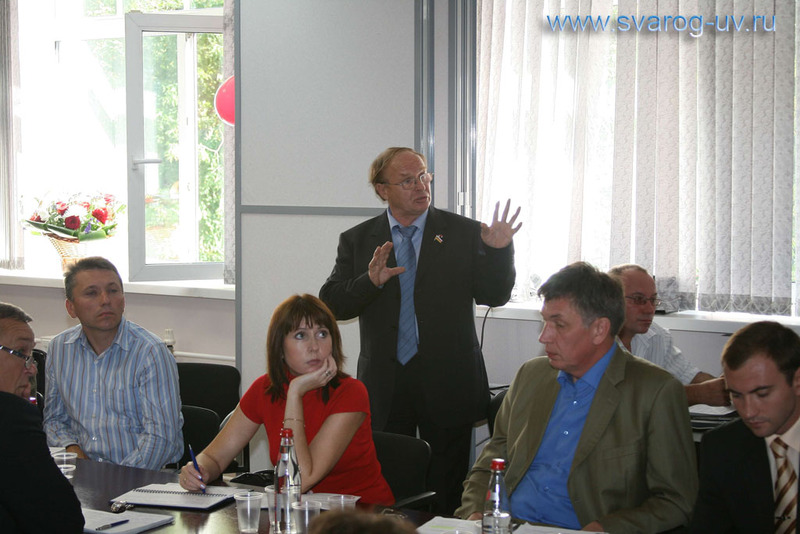 Ulyanov by the "VANKB" Presidium session held at the headquarters of "Svarog" company. Mr M.M. 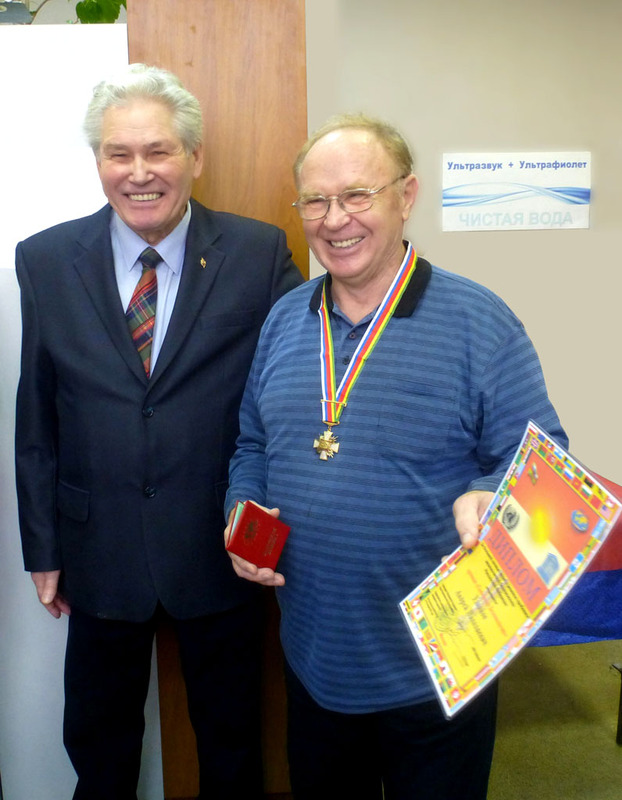 Lubimov – President of "VANKB", President of the International Association “Systemservis”, Doctor of Technical Sciences, Professor, Honoured Scientist of the Russian Federation. Mr K.M. Lubimov – Vice-President of VANKB, Executive Director of the International Association “Systemservis”, President of “Constanta Group” holding. Mr A.A. Filippov – Head of the Committee on Energy Efficiency at the Trade and Industry Chamber in Moscow Region. Mr S.V. Gridnev – member of the Board of Directors at “Hiromax-technology” Ltd.
Mr A.V. Aksenov – member of the Board of Directors at “Constanta Group” holding. Event participants discussed and agreed steps to introduce “Lazur” systems for disinfection of drinking water and waste effluent with UV light and Ultrasound in the framework of the programme “Energy Efficient and Secure district and town of Moscow Region”. Pilot projects were set for towns Vidnoe and Dmitrov in Moscow Region. December was marked with an exceptional peak of orders for “Lazur” systems for disinfection of drinking water and waste effluent with UV light and Ultrasound. “Svarog” company ended 2014 with large profits, ensuring stable operations in the coming year 2015. These large orders serve as a testimony to clear advantages of “Lazur” technology for disinfection of drinking water and waste effluent with UV light and Ultrasound over the traditional UV systems by other manufacturers in the aspects of technical characteristics and application properties. "Svarog" company has completed reorganisation by the transition from the Closed Shareholders Society to Limited Company to optimise company's management activities, improve efficiency of assets utilisation and enhance profitability. “Svarog” Ltd is the full successor to “Svarog” Shareholders Society in relation to any property, assets and liabilities, rights and obligations, in relation to all creditors and debtors. Representatives of “Svarog” company participated in November meeting of the Russian Public Chamber which was held in relation to ecology and environmental protection.” Prof. Fadeev presented considerations from “Svarog” in support of the “Environmental Protection” legislation related to the requirements in the selection process of UV equipment for disinfection of drinking water and waste effluent within the Best Available Technology practice and also suggested steps for thorough certification and verification of UV systems. Svarog's position received full support from the Russian Public Chamber leadership, and Svarog was requested to prepare detailed proposals. A new microprocessor-based system for monitoring and control of multi-lamp “Lazur” bactericidal units for disinfection of drinking water and waste effluent using ultrasound has successful completed a program of factory testing. Tight working contacts have been established with a Vietnamese company. The framework of co-operation envisages the supply of water treatment equipment, including disinfection of water with UV and ultrasound of large flow rates, for a number of municipalities in Vietnam. “Lazur” technology for disinfection of drinking water and waste effluent using ultrasound is broadening the areas of its applications. “Svarog” company has established firm links with the Scientific Research Centre “Kurchatov Institute” and joined collaborative projects based on the technological platform “Bioenergy”. 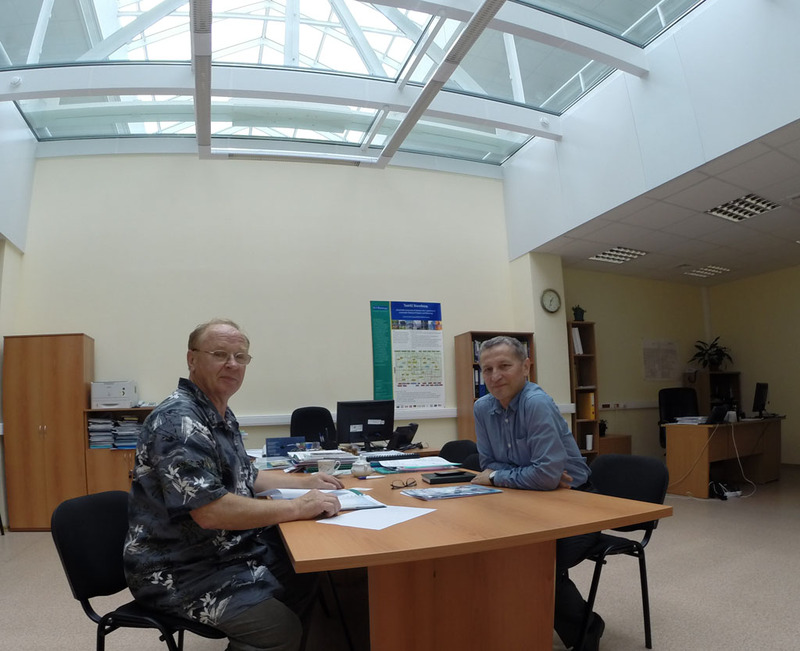 Close cooperation has also been established with the Moscow Institute of Thermal Technology for the application of ozone and UV with ultrasound in water treatment. Close working relationship has been developed with the “Morton” company. The companies will join forces in the application of “Lazur” bactericidal units for disinfection of drinking water and waste effluent using UV and ultrasound at sewage treatment works at a number of housing estates. Starting from July 2014, practically all “Lazur” bactericidal units for disinfection of drinking water and waste effluent using UV and ultrasound can be equipped with a microprocessor-based monitoring and control system. 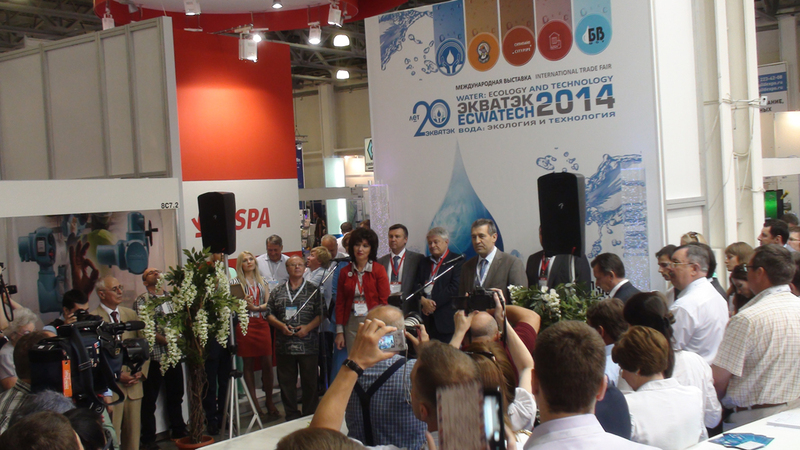 The International Exhibition ECWATECH 2014 was held in Moscow at the IEC “Crocus Expo” on 3-6 June 2014. Our company presented the latest developments in the area of water and wastewater disinfection by means of Ultraviolet light with applied Ultrasound. 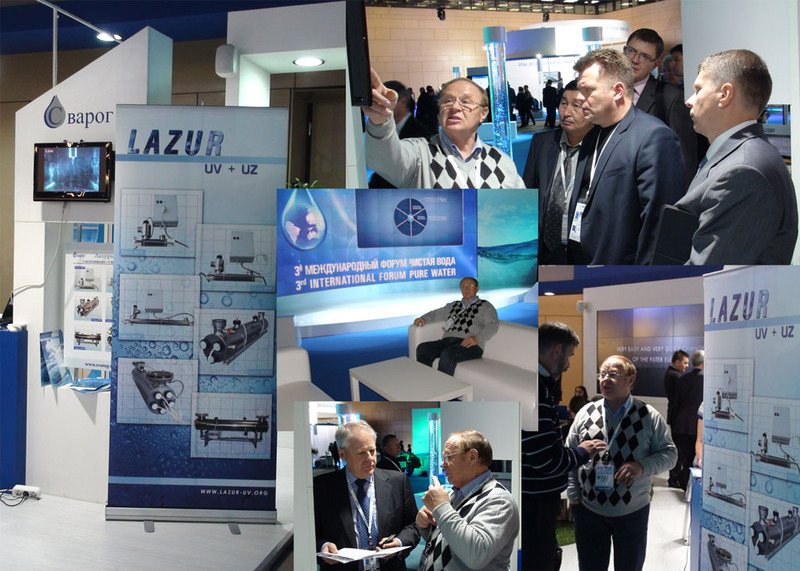 A large number of commercial enterprises and governmental agencies attended our stand and showed keen interest in Lazur technology and equipment for disinfection of drinking water and waste effluent. Our company celebrates 20th anniversary!!! For the past two decades, our company has been developing technologies for disinfection of drinking water and wastewater by means of Ultraviolet light with simultaneous application of Ultrasound, and manufacturing bactericidal systems of Lazur series of flow rates ranging from 0.5 to 1000 m3/hour. Currently, our products for disinfection of water and waste effluent are regarded as the most effective and economically efficient systems on the domestic and international market. Continually increasing our production volumes, we are now positioned as one of the world's largest companies in this segment of the market. All bactericidal equipment for water and wastewater disinfection of “Lazur” series is developed and produced at our own production facilities. 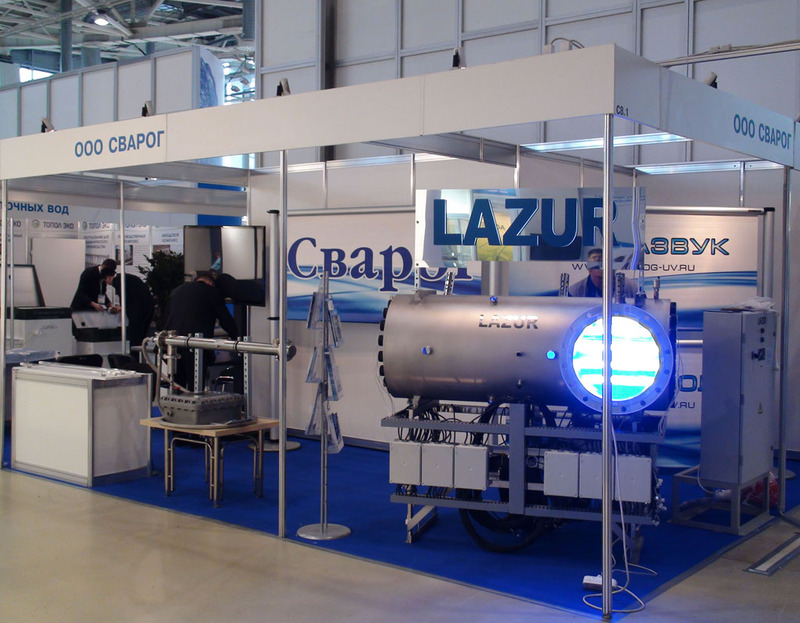 Products of “Lazur” series for disinfection of water and effluent by means of Ultraviolet light and Ultrasound have received numerous awards and prizes at international and domestic exhibitions. 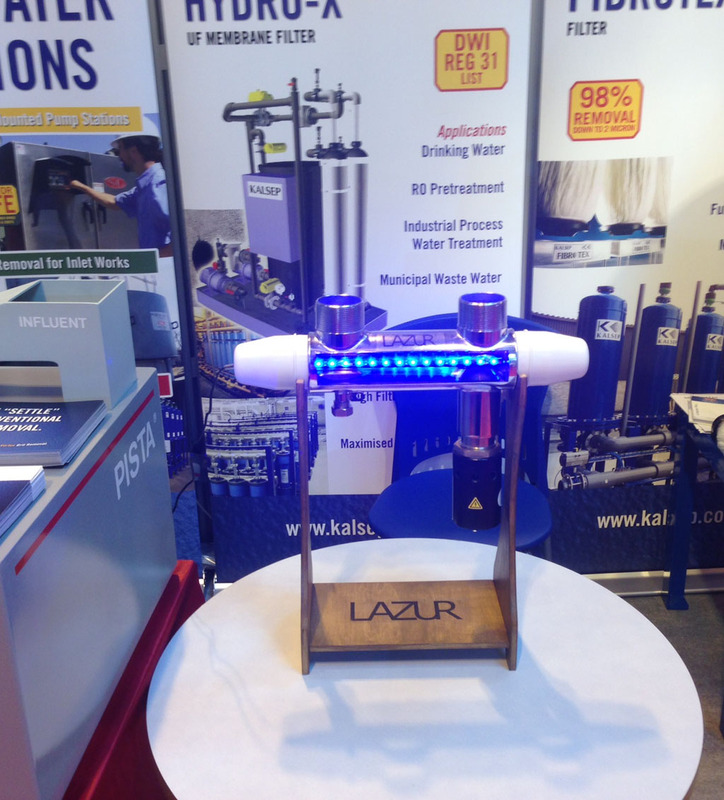 “Lazur” technology for disinfection of drinking water and waste effluent by means of Ultraviolet light in combination with Ultrasound was presented by Biovis Limited at the international exhibition of water technologies IWEX that was held at the National Exhibition Centre in Birmingham, United Kingdom on 1-3 April. 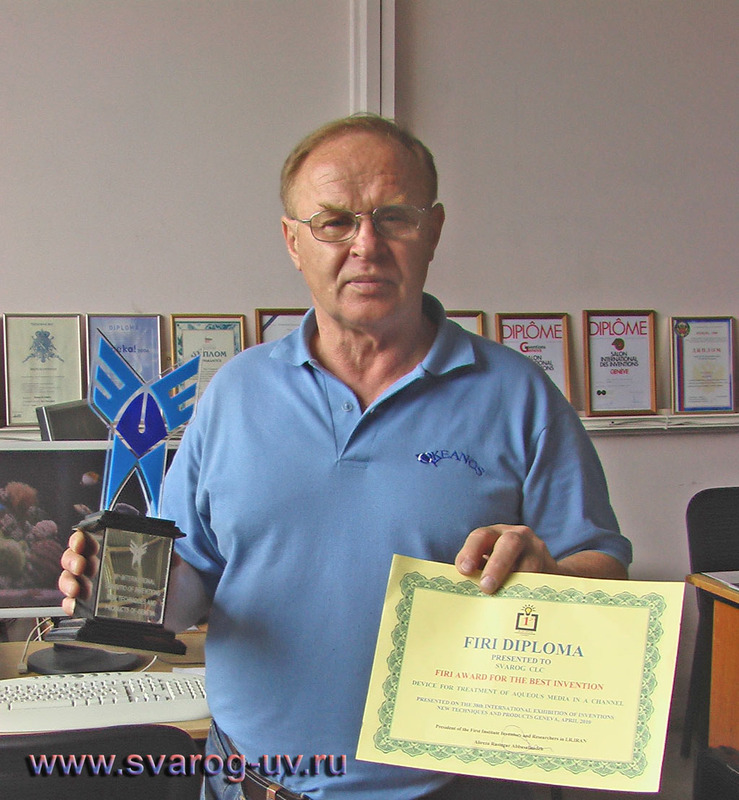 “Svarog” company has joined an international project for the supply of drinking water to various regions of the world. Total treatment capacity of supplied bactericidal systems of “Lazur” series for disinfection of drinking water by Ultraviolet light and Ultrasound may reach 600,000 m3/hour. Delivery of systems is scheduled for 2015 – 2020. All members of staff at JSC “Svarog” congratulate our Leading Specialist O.A.Loctev on his jubilee and wish him good health and success in creative endeavours. “Svarog” company had a visit from the management team of the Dutch company “Advanced Waste Water Solutions B.V.” to discuss mutual collaboration. Discussions were held on the subject of delivery schedule for the supply of bactericidal systems to disinfect water and effluent by means of Ultraviolet light and Ultrasound designed for large flow rates. The systems will be installed at various water treatment sites in the European Economic Community this current year. Report on the testing of “Lazur” system for disinfection of water and effluent by Ultraviolet light and Ultrasound conducted in Holland attracted keen interest from various countries in EEC. A range of companies from The Netherlands, Italy, France, Great Britain and Canada are looking to purchase systems for disinfection of water and effluent by Ultraviolet light and Ultrasound of large flow rates. “Svarog” company continues participation in the program “Clean Water”. The company signed a contract for the supply of a large water disinfection system based on the application of UV and ultrasound to a South Ural enterprise. The system will be delivered to the customer this year. A study on the bactericidal efficiency of Lazur technology in the disinfection of drinking and wastewater with UV and ultrasound has been conducted in Holland. The study also referred to the experience of using bactericidal systems from the world leading manufacturers. Preliminary results demonstrate a significant advantage of Lazur technology over the traditional UV technologies. Successful negotiations have taken place with a number of large construction companies in relation to regular supplies of water/wastewater disinfection systems based on UV and Ultrasound for installations in new buildings. The expected annual volume of such systems can exceed 1,000,000 m3/day of combined flow. “Svarog” company has been brought into the Moscow city programme for domestic infrastructure improvements. It is expected that the number of supplied bactericidal units for water and wastewater disinfection utilising UV and Ultrasound of “Lazur” series can reach 1000 systems this year. 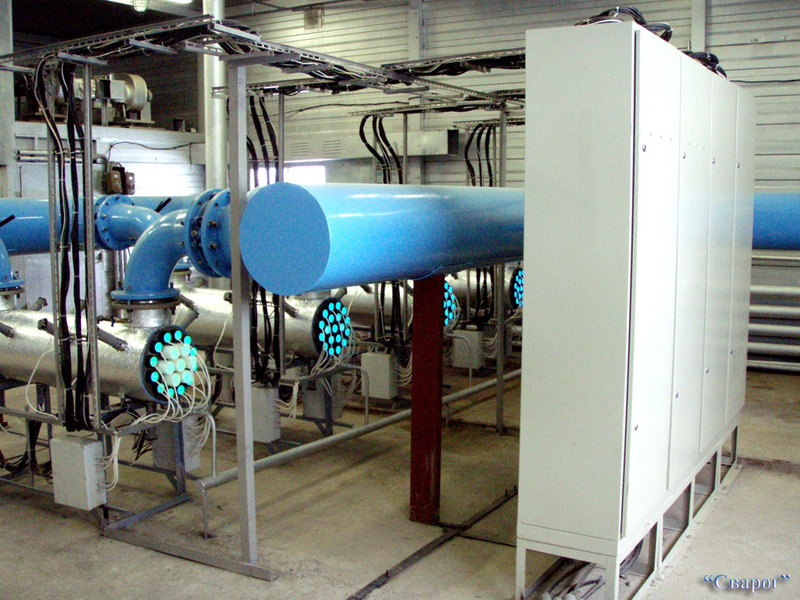 Large orders for "Lazur" modules of "Lazur" series of high flow rates have been received from mining companies in Kuzbass region and from water utilities in Kazakhstan. These orders testify that the technology for water and wastewater disinfection utilising UV and Ultrasound strengthens its positions in the Russian and international markets. 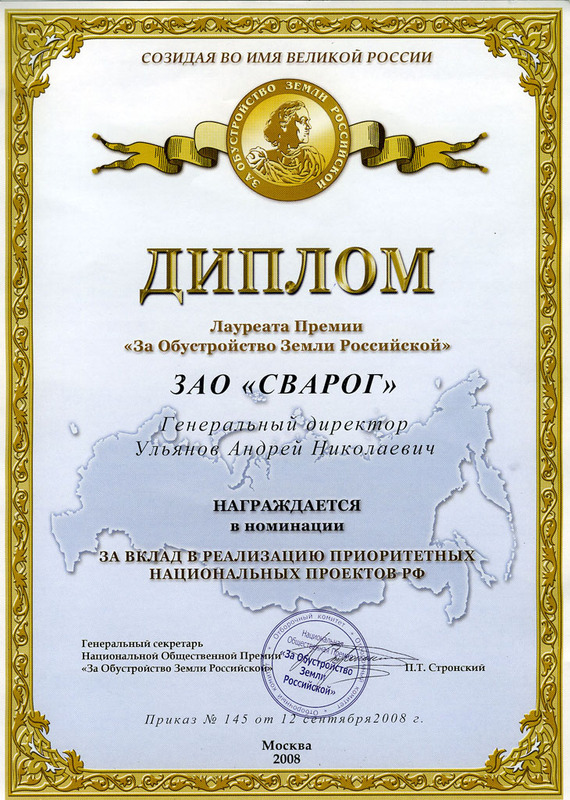 The Oceanariumon the Russky Island in Primoryehas been highly commended by Russian President V.V. Putin. This aquatic centre utilises bactericidal systems “Lazur” based on the application of UV and Ultrasound for the disinfection of sea water. “Svarog” company has made a contribution into the preparations for Sochi Olympics 2014. A large shipment of bactericidal units for water and wastewater disinfection utilising UV and Ultrasound of “Lazur” series has been dispatched to Sochi for water treatment installations throughout the Olympic complex. Commissioning works at the “LITC” have now been completed, and the Centre production facilities are operating to full capacity. 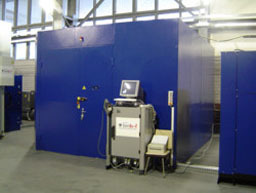 The Centre production floor covers over 1000 square meters, where a number of powerful laser units operate. “Svarog” company deploys laser cutting and laser welding technologies in the manufacture of reactor bodies for the “Lazur” bactericidal systems, which areused in water and wastewater disinfection and which are based on the application of UV and Ultrasound. “Svarog” company has founded the Laser Innovation Technological Centre ”LITC” – a large production facility specialising in laser cutting and laser welding of metals. Dutch company "Advanced Waste Water Solutions B.V." have completed testing of the bactericidal system “Lazur M-3K” in the disinfection of water and wastewater with the application of ultrasound. 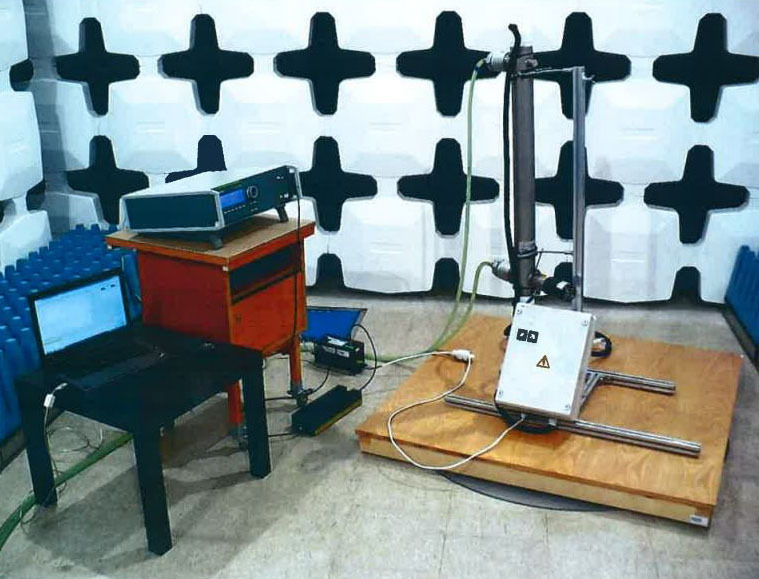 Based on test results for “Lazur M-3K”, a report was compiled to describe the role of ultrasound in maintaining cleanliness of quartz sleeves and reactor surfaces. Tests were conducted with rinsing water from apples and pears washing. In these conditions bacteria produce EPS – a sticky substance that leads to very slimy biofilm formation. In experimental conditions, with the ultrasound turned off, slimy biofilm formed on the UV quartz sleevewithin 2 weeks reducing the UV dose practically to zero level. The thick biofilm has also formed on the internal surfaces of the reactor. When the ultrasound was turned on, within the first 3 hours, 50% of quartz sleeve surface was cleaned, and after 24 hours quartz sleeve surface and the internal surfaces of the reactor were totally cleaned. If the ultrasonic system is turned on, no biofilm fouling on the quartz sleeve or on the reactor occurs whatsoever. British company “Isle Utilities” has completed a project to identify technologies for the removal of pharmaceutical compounds from waste waters, and included “Lazur” technology into the top 3 most promising technologies and recommended testing of “Lazur” systems within the framework of UKWIR project with the support from all major British water utilities. Trials of the “Lazur” technology in the disinfection of water in the agricultural sector of the Netherlands are successfully underway. Trials results generate large interest from Dutch companies in products manufactured by “Svarog” company (bactericidal system for disinfection of water and wastewater by UV light and ultrasound). Trials of “Lazur M-250” system for the disinfection of treated waste effluent at the South-West site of St. Petersburg Water Treatment Works have been completed. Report on the performance of “Lazur M-250” system, based on the disinfection of water with UV light and ultrasound, provides a favourable assessment of “Lazur” technology efficiency in water disinfection. 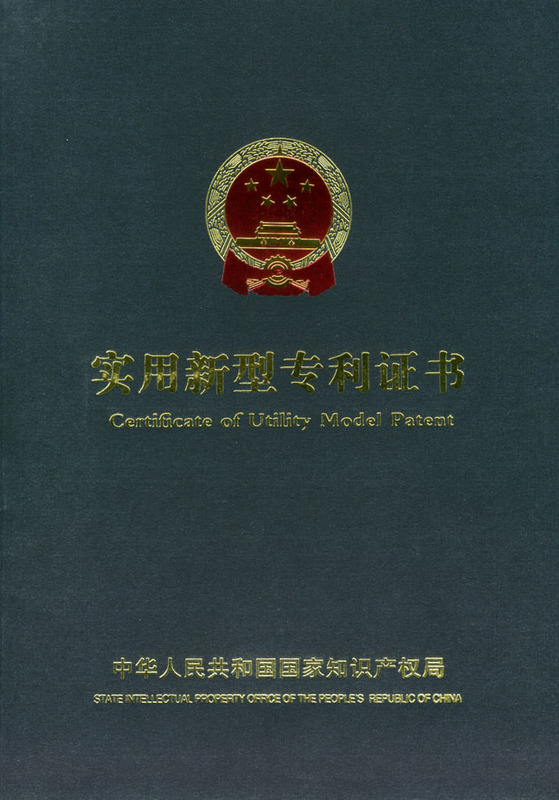 “Lazur” technology based on the application of UV light and ultrasound in disinfection of drinking water and waste effluent, has been patented in the People's Republic of China. 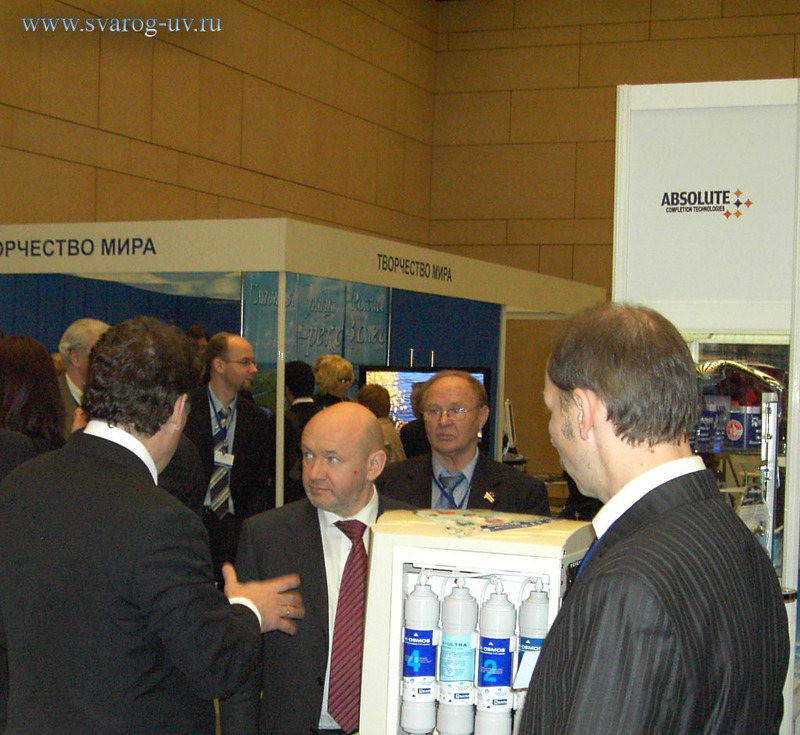 3rd International Forum “Pure Water -2012” was held in Moscow on 6-7th November in the World Trade Centre. “Svarog” company participated in the forum and exhibited the innovative technology for drinking water and wastewater disinfection based on the application of UV and ultrasound. Systems for water and effluent disinfection based on the application of UV and ultrasound exhibited by “Svarog” company attracted interest from Mrs S.Orlova, the Deputy Chairman of the Federation Council of the Federal Assembly of the Russian Federation, and Mr P. Birukov, the Deputy Mayor of Moscow. Senior managers of the St. Petersburg Water Treatment Works M. Probirski and O. Rublevskaya took part in the round table activities, where Dr. A. Ulyanov, President of “Svarog” company, delivered the presentation “Lazur technology – a new step in the disinfection of water and effluent”. The presentation was well received by the audience. Trials of the bactericidal system “Lazur M-250” for effluent disinfection continue at the St. Petersburg Water Treatment Works. Regular microbiological tests demonstrate practically total suppression of pathogenic microflora after the Lazur system, which deploys UV and ultrasound in the treatment of effluent. 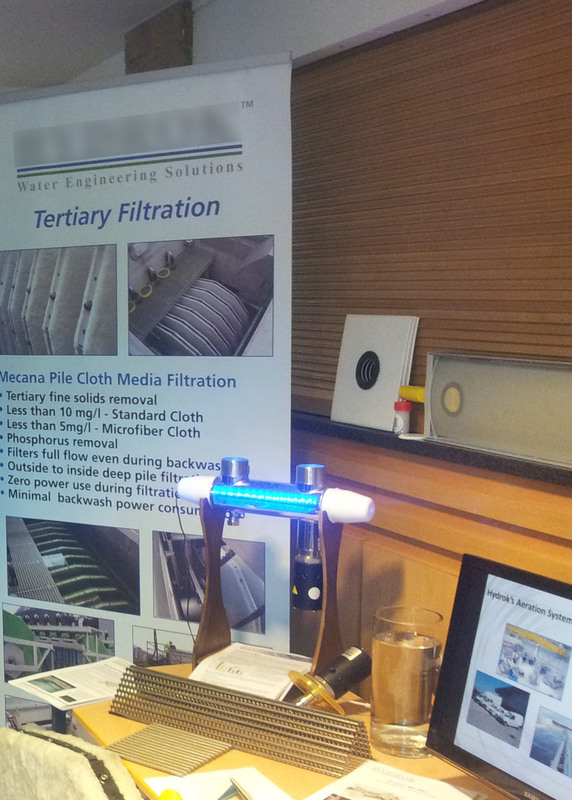 The achieved results of effluent disinfectionare far superior in comparison to the existing channel-based UV system “NPO LIT”. “Svarog” team celebrates Birthday Jubilee of V. Romadin, Chief Specialist of the company, and wishes him every success in his creative work. 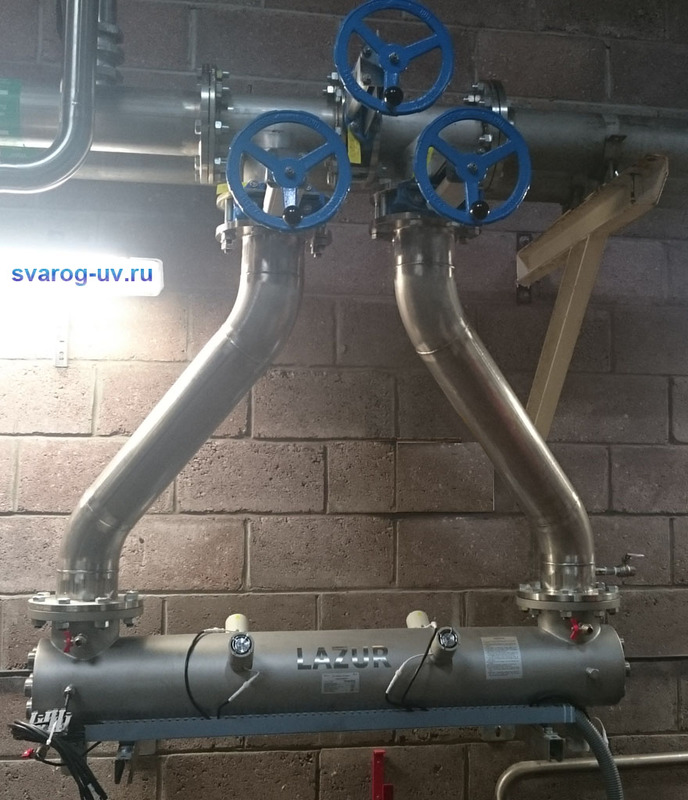 “Svarog” company received sizeable orders for drinking water and effluent disinfection systems based on the application of UV and Ultrasound for large flow rates. The total flow rate of requested systems is over 300,000 m3/day. An important factor is the educated choice of the systems from the customers, as the advantage of “Lazur” technology over other systems (such as LIT, ENT, EGA-XXI Century and UV-TECH) is well recognised. Joint projects with the largest UK water companies "Thames Water" and "Scottish Water" in the treatment of groundwater are unfolding successfully. “Svarog” company initiated design work on large systems for industrial wastewater treatment in the oil and gas sector. 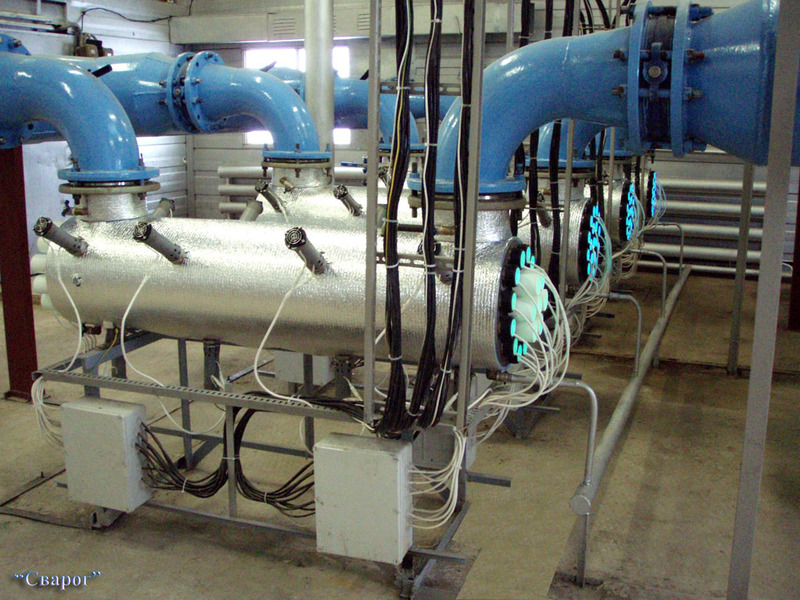 These systems, based on the application of UV and Ultrasound, will have the total flow rate of 2,000,000 m3/day. 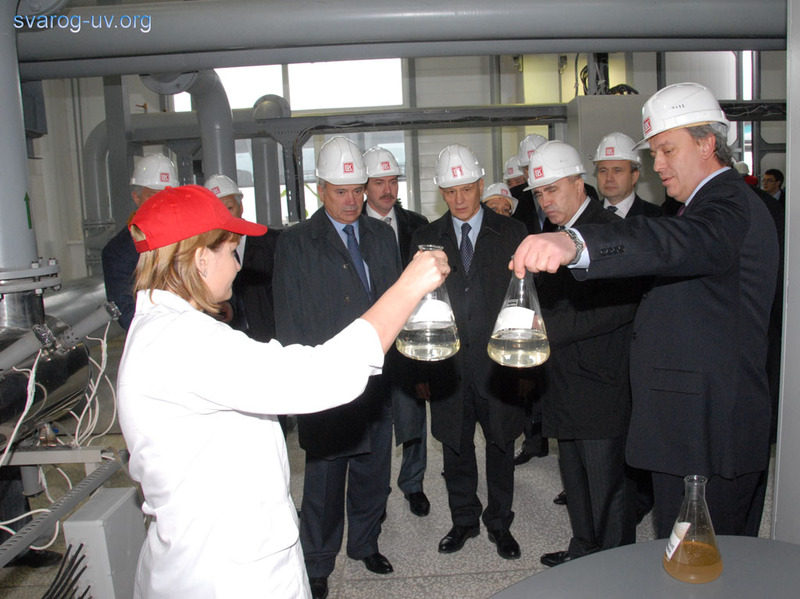 Vaghit Alekperov, President of “LukOil” and Victor Basargin, the Region Governor, visited the wastewater treatment works at the “LukOil-Permnefteorgsintez” plant and examined the operation of waste effluent disinfection system. 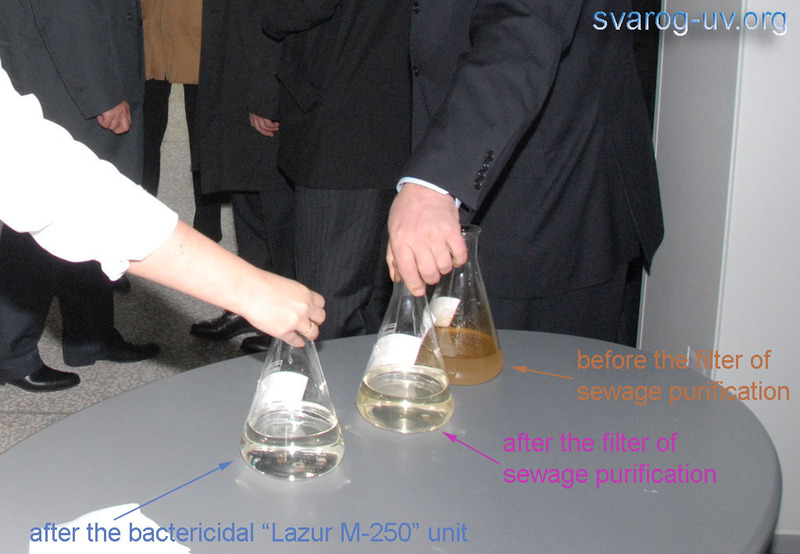 Remarkable results of water treatment, including effluent clarification by the UV/Ultrasound systems “Lazur M-250” were demonstrated to the visitors (see video). 10th International Water Forum “ECWATECH – 2012” will take place on June 5-8, 2012 at the Moscow IEC “Crocus Expo”, pavilion №3. “Svarog” company invites everyone to visit our stand E11.3 in Hall 14, where the company will demonstrate the latest technology for disinfection of drinking water and waste effluent by application of ultraviolet radiation and ultrasound. Successful talks were conducted with St. Petersburg water utility about the application of “Lazur” systems for the disinfection of drinking water and city sewage effluent. A comprehensive test programme has been set to evaluate the characteristics of the bactericidal system “Lazur” in real working conditions at an operational site. On 29-31 March, “Svarog” company participated in the International Exhibition, which was held within the framework of the 3rd International Forum “Ecology” in St. Petersburg. 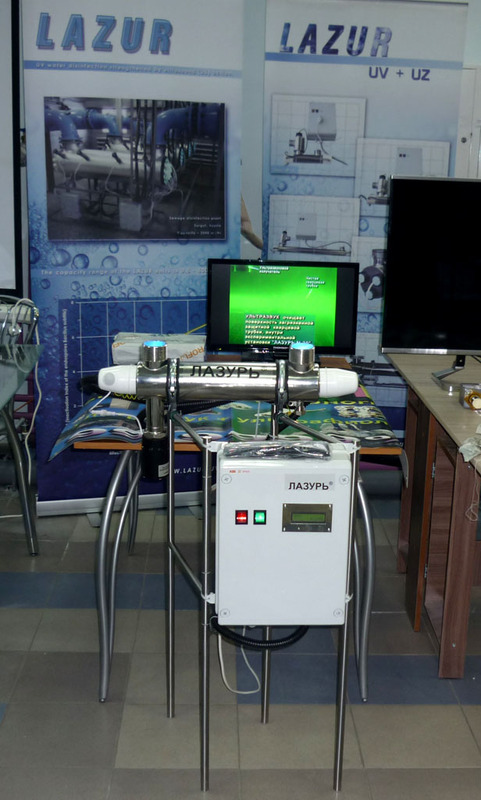 “Svarog” company demonstrated the latest technology for water treatment, water purification and water disinfection with ultraviolet radiation and ultrasound. Successful talks were held with Dr Vladimir Danilychev, President of “Quantum Technologies” company, USA. Discussions were focused on the introduction of “Svarog” company products for disinfection of water using ultraviolet radiation and ultrasound to water purification and water treatment national markets. Commissioning of “Svarog” company products for disinfection of water using ultraviolet radiation and ultrasound was launched at the Olympic Village, London. Dr A.N. 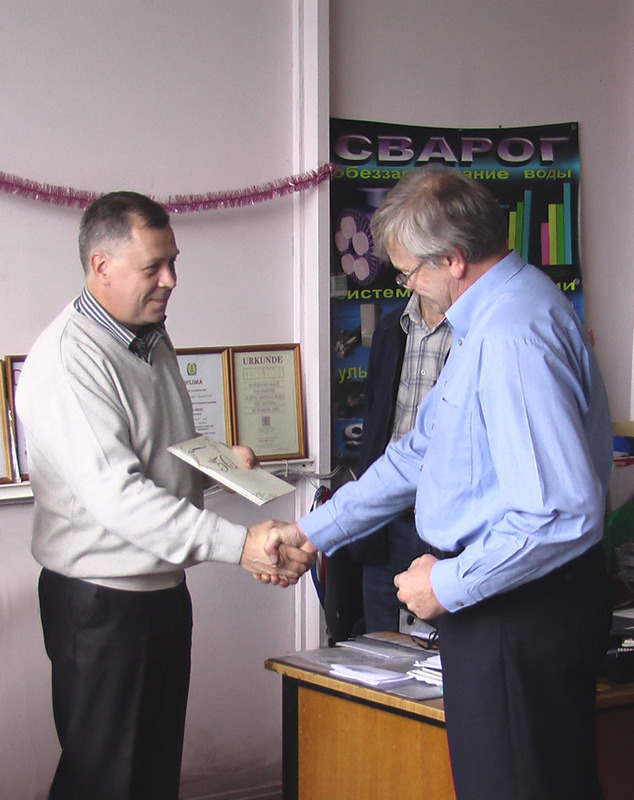 Ulyanov, President of “Svarog” company, was awarded an order “Loyalty and Service” of the 1st Grade and a diploma for his personal contribution into the provision of environmental safety aspects for human activities on Earth. This award highlighted outstanding achievements of Dr A.N. 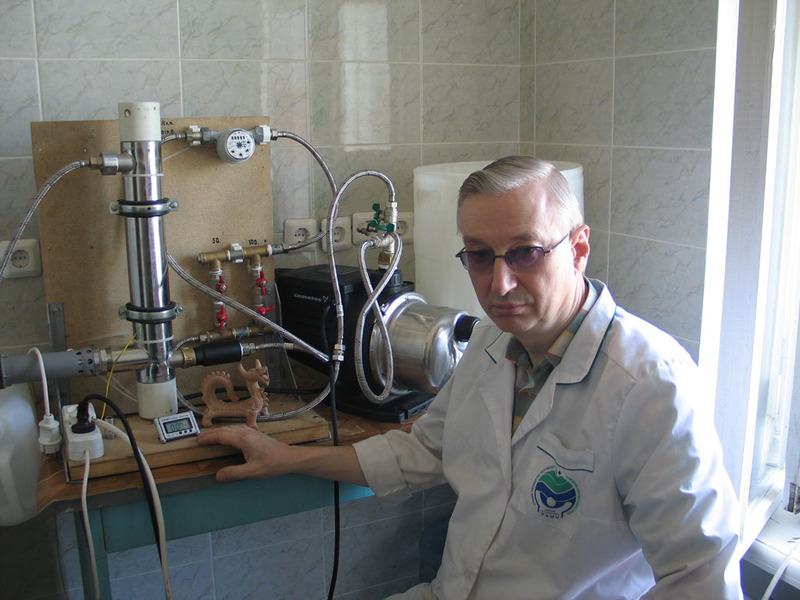 Ulyanov and Svarog employees in the development and application of highly efficient technologies for the disinfection of drinking water and waste effluent using ultraviolet radiation and ultrasound, which contribute into the provision of ecological security of many countries. Arkady Arianoff, General Consultant of the 2-nd Belgian-Luxemburg Forum “Russia – European Union. High Technology and Innovation in Energy, Nano-, Bio-, Aero- and Space Technologies”, presented “Svarog” company with a diploma for active involvement over many years in the development of drinking water and waste effluent disinfection technologies based on the application of ultraviolet radiation and ultrasound, magnetic treatment of water, which improve the quality of water and preserve natural water resources. “Lazur” systems for the disinfection of drinking water and treated effluent with the use of ultraviolet radiation and ultrasound, as most efficient, have been included in the official list of equipment supplied to London Olympics 2012 sites. 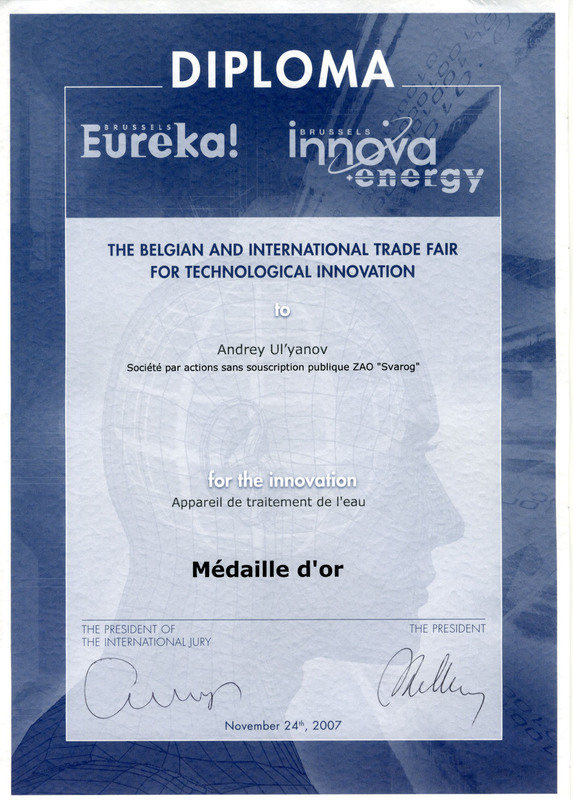 The 2-nd Belgian-Luxemburg Forum on the development and application of innovative technologies took place within the framework of the Brussels INNOVA 2011 event. 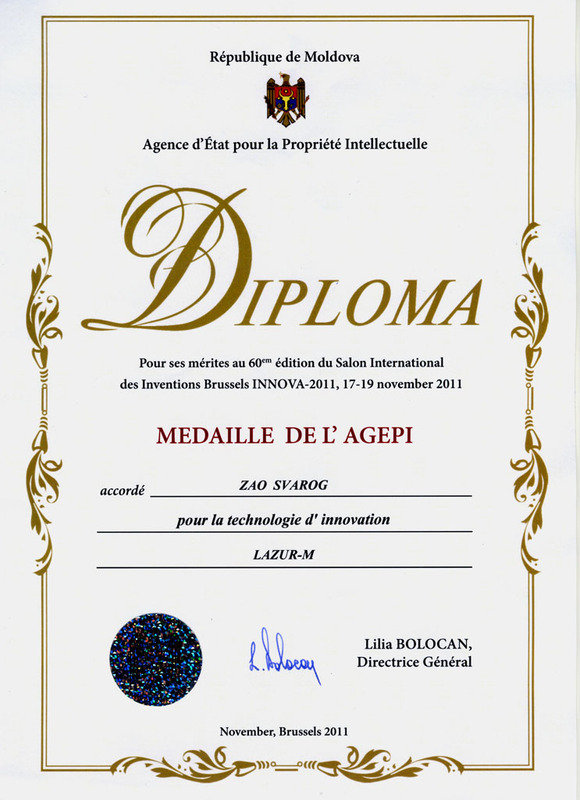 “Lazur” technology for water treatment and drinking water / waste effluent disinfection using ultraviolet radiation and ultrasound was presented at the Forum and was awarded a prestigious international award “MEDAILLE DE L'AGEPI”. The Embassy of the Republic of Ecuador and the Trust Fund “Yasuni ITT” expressed sincere gratitude to Dr A.N. 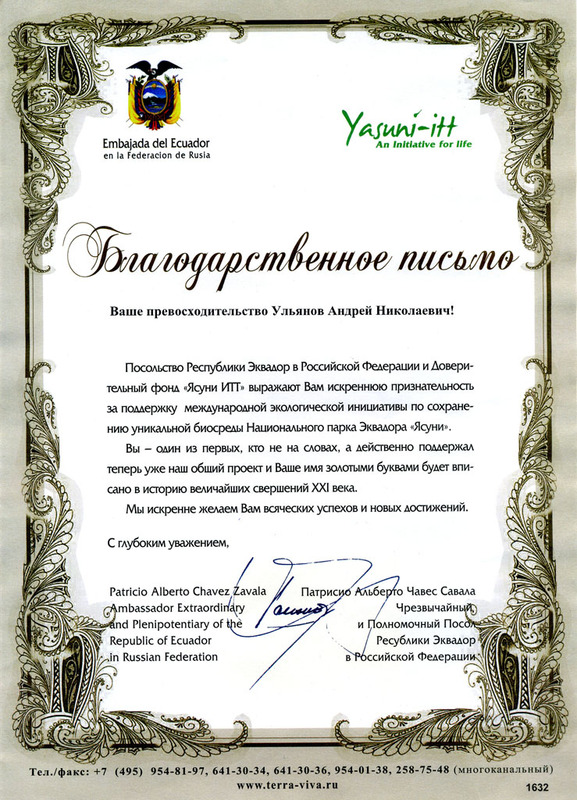 Ulyanov for his support of the international environmental initiative to protect the unique biosphere of the Ecuadorian Yasuni National Park. Delivery and installation of a number of “Lazur” systems in Kenya have been completed. These systems for disinfection of drinking water and waste effluent, based on the application of ultraviolet radiation and ultrasound, have been successfully commissioned. 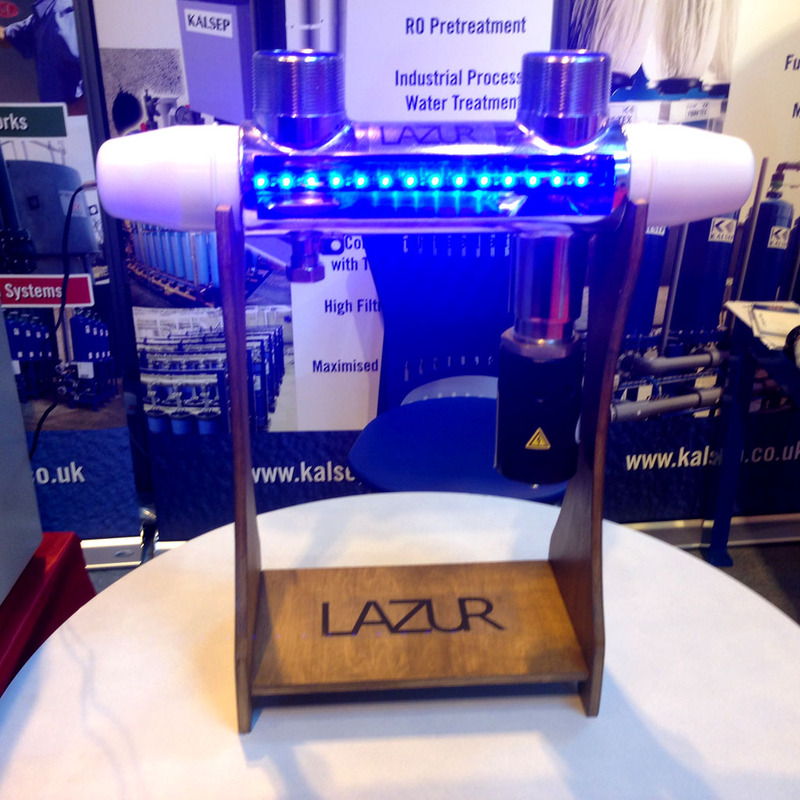 Representatives of “Svarog” in Great Britain conducted talks with “Scottish Water” on the subject of trialling bactericidal systems “Lazur” for disinfection of water utilising both ultraviolet and ultrasound. Positive results of trials envisage introduction of “Lazur” systems into large waterworks. Discussions with St. Petersburg water utility in regard with Lazur systems for disinfection of water and treated effluent are in progress. Water utility specialists visited our company to learn more about “Lazur” technology. The visiting delegation was greatly impressed with the manufacturing capabilities and with the depth of scientific research programmes carried out by our company, which result in supreme technical characteristics of our water disinfection equipment. The visit concluded in the agreement between the St. Petersburg water utility and “Svarog” company to commence preparations for the trial of Lazur M-250 system at one of the site in St. Petersburg. The trial will focus on the evaluation of the “Lazur” technology for future applications in the disinfection of drinking water and treated effluent in water networks of St. Petersburg. 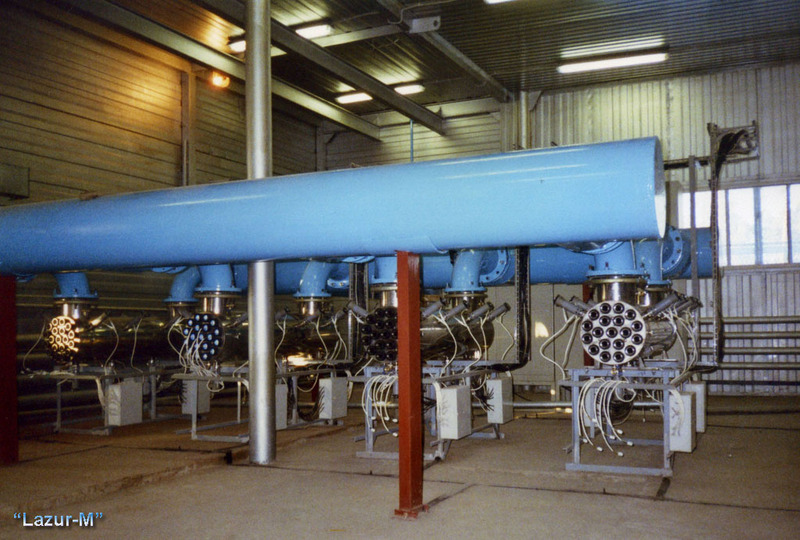 In September, a larger number of “Lazur” systems were supplied to customers for the disinfection of storm waters. This market segment is expanding fast. A large amount of orders were received for “Lazur” systems for disinfection of storm and drainage waters. Negotiations and discussions about joint scientific research programmes (including subjects of mathematical modelling methods for the disinfection of water with Ultraviolet and Ultrasound) were held at the University of Wollongong, New South Wales, Australia. The agreement envisages cooperation in 2012 – 2015 under joint financing by “Svarog” corporation and the Government of Australia. Despatch of water/wastewater disinfection equipment for several large enterprises in Ural Federal Region (of total flow rate up to 500 000 m3/day) is underway. Following a series of test in Austria and Slovak Republic, the water disinfection systems “Lazur” (based on UV and Ultrasound application) have been declared to conform to CE marking requirements and therefore can be sold throughout the European Economic Area. There is an encouraging trend in a steady growth of orders from Kazakhstan, where a significant number of water/wastewater disinfection systems (based on UV and Ultrasound application) are in successful operation. A set of tests is nearing the completion at the enterprise “New City Infrastructure Prikamye”, which targets the use of “Lazur” technology (based on UV and Ultrasound) in Perm City. June has witnessed the most significant increase in orders for our company's products in the last few years. The company shipped out large flow-rate “Lazur” systems (based on UV and Ultrasound) to clients in Russia and abroad to the total volume of over 40,000 cubic meters per hour. All clients have chosen our systems (water/wastewater disinfection systems based on UV and Ultrasound) because of their efficiency (over 65 mJ/cm2), long warranty period of 2 years and relatively low cost. The fulfilled orders demonstrate that our company is capable to manufacture water/wastewater disinfections systems (based on UV and Ultrasound application) in the annual volume of up to 500,000 cubic meters per hour. 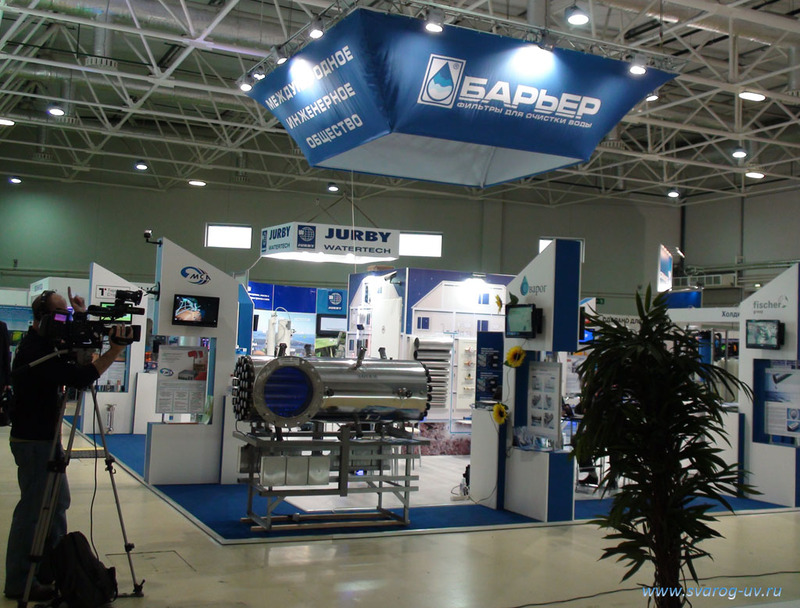 The IV International Exhibition “Complex Security – 2011” took place at the All-Russian Exhibition Centre on 17-20th of May. “Svarog” company participated in the event and demonstrated the newest technology for water treatment, purification and disinfection based on the application of UV and Ultrasound. The 6th IUVA World Congress was held in Paris on 23-27th of May. 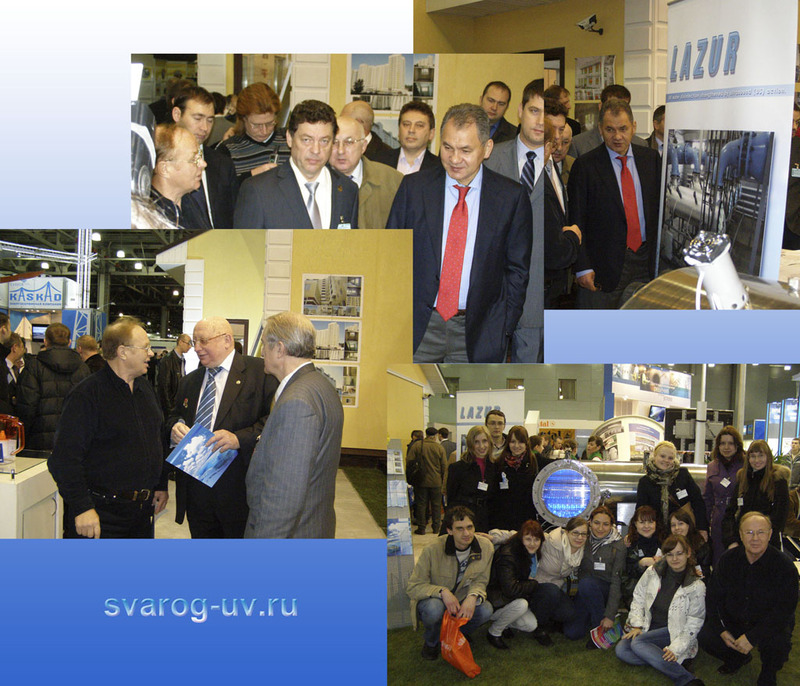 “Svarog” company exhibited the “Lazur” technology for water/wastewater disinfection (using UV and Ultrasound), which attracted considerable interest from scientists and businessmen from various countries. Talks on co-operation were conducted with a range of companies from Germany, Italy, Great Britain and China. Consultations were held with specialists and managers from the German firm Heraeus about the development of lamps with service life of over 20,000 hours. Plans for joint co-operation in 2011-2013 were made during the consultations. 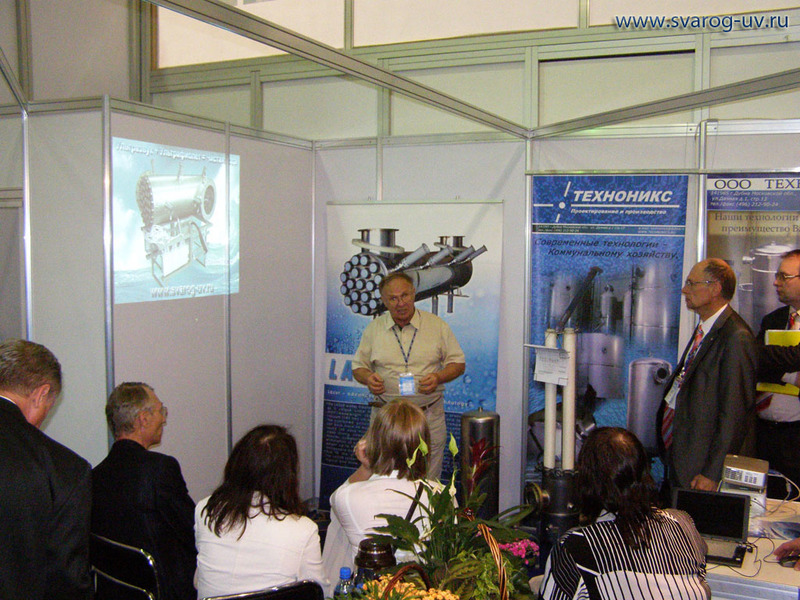 The 2nd International Exhibition-Forum “Innovation and Technology – 2011” took place at “Crocus Expo”, Moscow on 12-14th of April. “Svarog” company participated in the event and demonstrated the newest technology for water and wastewater treatment, purification and disinfection based on the application of UV and Ultrasound. “Svarog” exposition on water and wastewater disinfection based on the application of UV and Ultrasound attracted a lot of interest. Svarog booth was visited by numerous representatives from various enterprises, regional governments and by top managers from the Moscow City Administration. 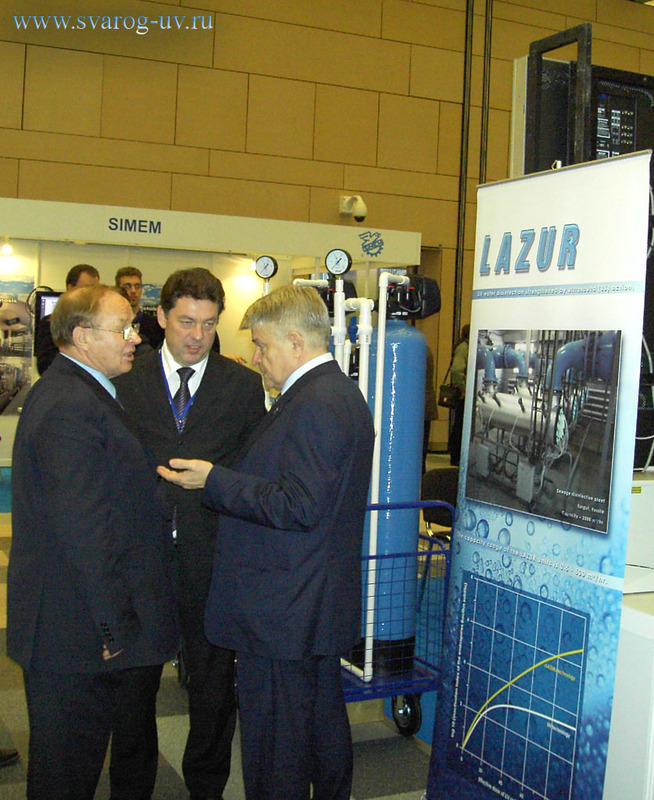 The Russian Minister for Emergency Situations (EMERCOM) Mr Sergei Shoigu had a detailed conversation about the advantages offered by the “Lazur” technology (drinking water and wastewater treatment, purification and disinfection based on the application of UV and Ultrasound) and expressed genuine interest. Graduates from the Moscow State University of Civil Engineering eagerly attended lectures on the innovative technology “Lazur” (drinking water and wastewater treatment, purification and disinfection based on the application of UV and Ultrasound) and expressed desire to gain employment at “Svarog” corporation. Mr A.N. Ulyanov, President of “Svarog” corporation, gave an extended interview to Channel 2 of Central Television. Overall, the outcome of the exhibition was very successful. The cooperation of JSC SVAROG with the companies and institutions of Greece, Kenya, Saudi Arabia, Slovakia, India, Congo, and Nigeria has entered into the practical stage. The large lot of germicide “Lazur" setups has been delivered to these countries. These setups of various capacities are designed for the disinfection of potable water and sewage by ultraviolet radiation with the use of ultrasound. The government organizations of these countries have confirmed the intentions to continue further acquisition of the germicide “Lazur” setups for the period of the next few years. The recent visit of delegation of the JSC Svarog-EcoTech a.s. to Kenya has resulted in the elaboration of the heavy order for the systems of water purification, water preparation, and disinfection of potable water and sewage by the ultraviolet irradiation with the use of ultrasound. The contractual agreements between the group of companies participating in the “Pure Water” program and the governing bodies of Krasnoyarsk Region and Khakassia have been signed on the execution of large-scale modernization of a number of enterprises of the housing and communal services of these regions. The organization and legal implementation of the International Engineering Association is close to completion. Our company is one of the constitutors of this organization. The work plans of the association directed to the execution of the “Clean Water” government program for 2011 have been discussed. During January 25 – 26, 2011, the negotiations with the Rotostal S.A, Company (Greece) took place. As a result, the contract on supplies of Lazur-type units for the disinfection of potable water and sewage by means of ultraviolet irradiation and ultrasound to Greece has been prepared for signing. Over January 2011, our company with participation of the Capital Bank Corp. (USA) conducted negotiations with the Indian government on major projects for water purification and water treatment (including sea water), treatment and disinfection of wastewater from large enterprises based on the use of ultraviolet radiation and ultrasound. The project program covers the period from 2011 to 2015. The total volume of contracts is expected to be within 2 – 3 billion US dollars. Our company has taken part in the “Industry of Housing and Communal Services, 2010” exhibition. 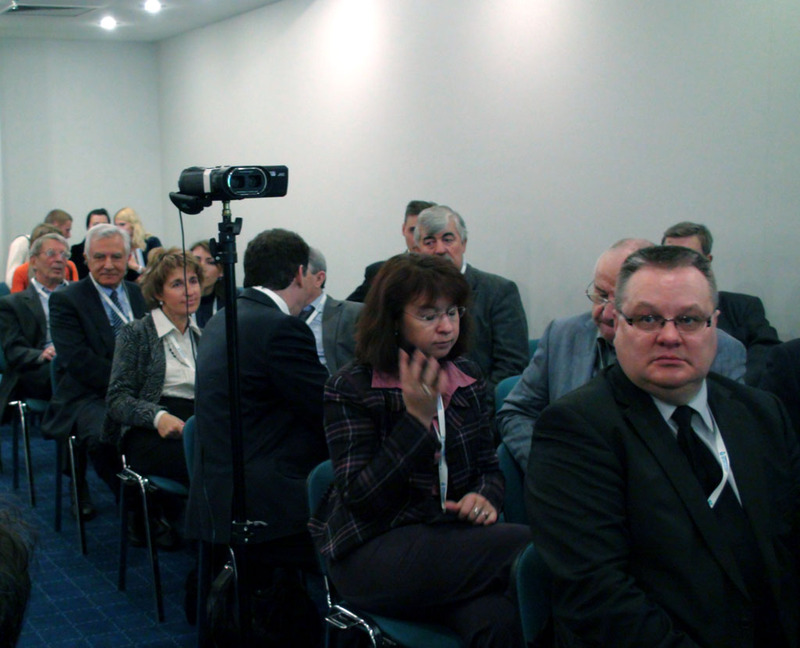 This forum was organized in frameworks of the VI-th All-Russian Forum of the guidance for these services and held in the Hotel Radisson Slavyanskaya and Business Center (Moscow, December 7 – 8, 2010). 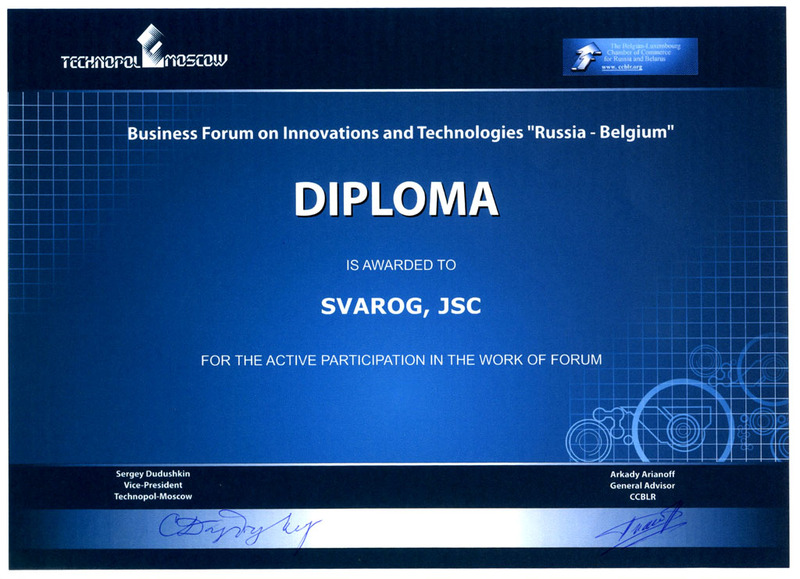 The SVAROG Company has taken part in the International Business Forum of Innovations in Brussels. The report of Dr. V.V. Fadeev, the National Delegate of Russia, on the ecological problems in Europe attracted great interest of the Forum participants. Special attention was called to the part of the report describing the “Lazur” technology of water disinfection based on the cooperative action of ultraviolet radiation and ultrasound as well as the magnetic treatment in the processes of water preparation and purification. These technologies make it possible to significantly improve water quality resulting in the course of potable water and sewage disinfection. The also provide the beneficial impact on the state of natural water resources. A number of international projects on the sewage disinfection by means of ultraviolet radiation and ultrasound in the interests of the Saudi Arabia and Northern Africa companies are now in the final stage. A series of large-scale contracts on supply of “Lazur”-type units for combined water and sewage disinfection by ultraviolet and ultrasound have been prepared for signing. 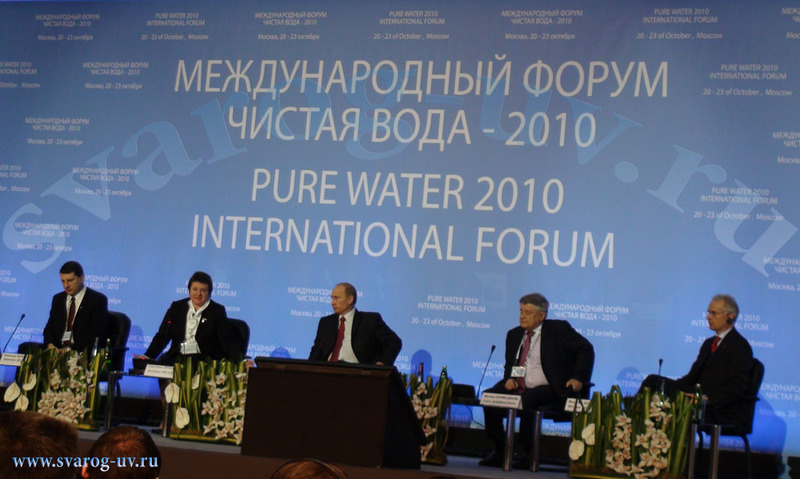 During October 20 – 23, 2010 on the territory of the Central Exhibition Complex “Expocenter”, the Second International Forum “Pure Water – 2010” took place. The SVAROG Company actively participated in this event by the demonstration of its up-to-date technology designed for water treatment and water and sewage purification and disinfection based on the use of ultraviolet radiation in combination with ultrasound. At the day of the official opening, the Forum was visited by Vladimir Vladimirovich Putin, the Chairman of Government of the Russian Federation. 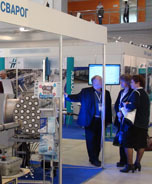 The keen interest of the State Leadership and Forum delegates was shown in the exposition of the International Engineering Association where the SVAROG Company demonstrated the bactericidal module (the capacity of up to 1000 m3/h) for the disinfection of potable water and sewage by ultraviolet irradiation combined with ultrasound. 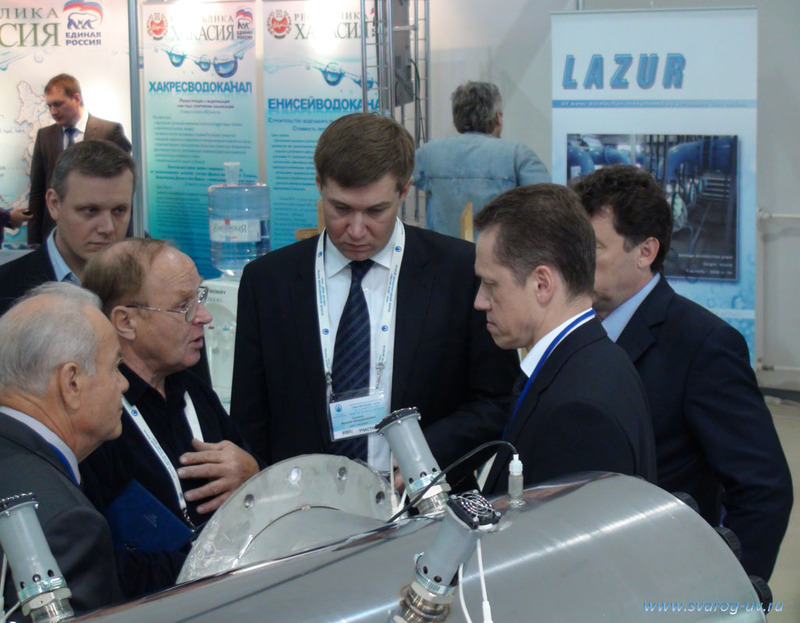 On the photo: top managers of the Saint Petersburg Vodokanal (Water Utilities) Company visit the booth of JSC SVAROG. 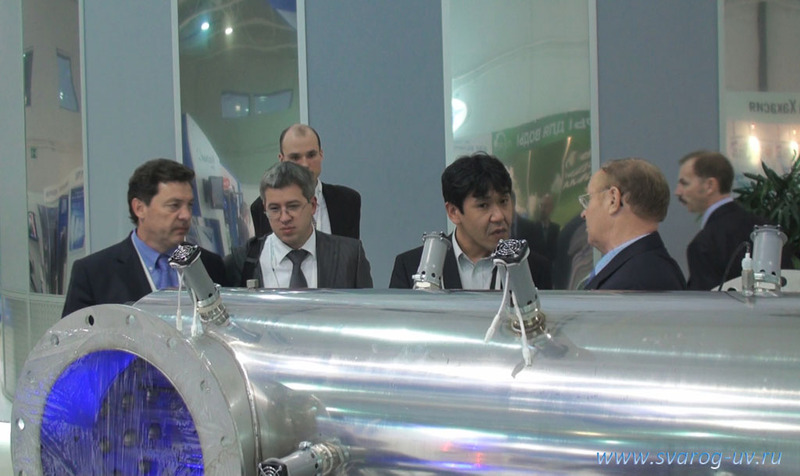 On the photo: top manager of the AVTOVAZ Company (Tol'yatti) gets acquainted with the exposition at the booth of JSC SVAROG. On the photo: top managers of the Mitsubishi Company, Japan, Mr. V.V. Saprykin and V.A. 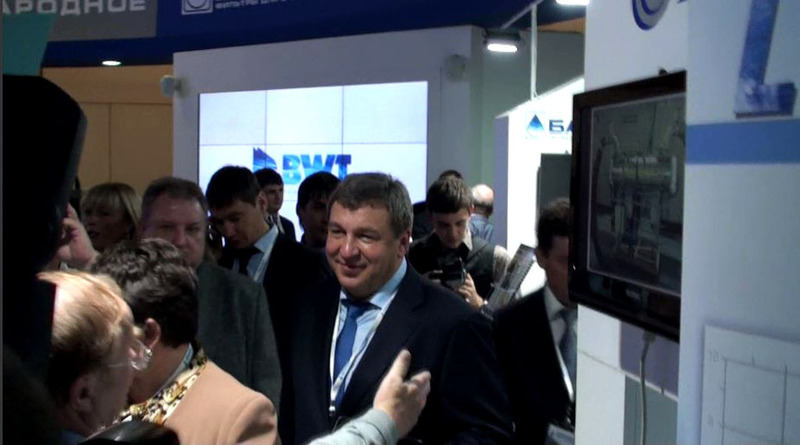 Maslyukov visit the booth of JSC SVAROG. Further expanding the international contacts, JSC SVAROG and its partners have prepared for signing the contracts with the companies of Saudi Arabia, Angola, and Kenya for the supplies of large lots of equipment for water and sewage treatment based on the use of ultraviolet and ultrasound. The negotiations with a number of European water network companies on supplies of our bactericidal equipment are in progress. The works on creation of production of the “Lazur”- type bactericidal units for potable water and sewage disinfection have been started in the Republic of Slovakia. 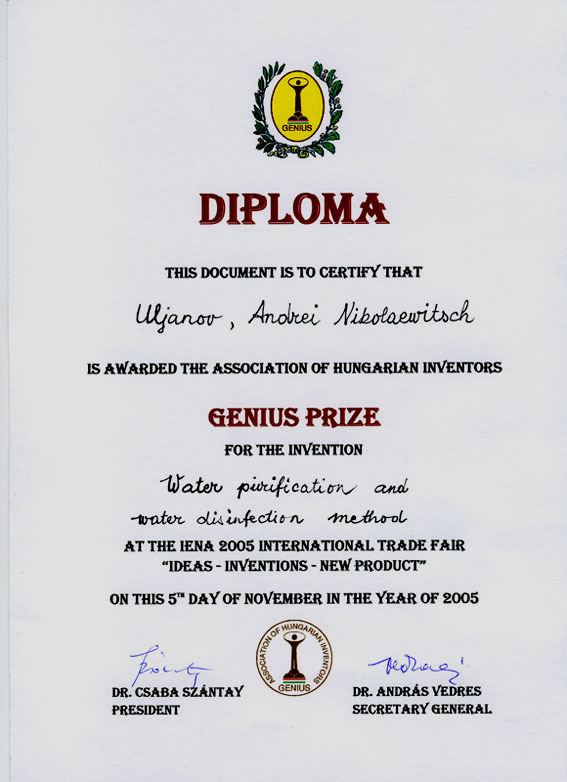 The Organizational Committee of the 2010 Geneva International Invention Exposition has marked the participation of JSC SVAROG by the special diploma and certificate for the development of up-to-date innovative technologies of water treatment and water purification and disinfection based on the use of ultraviolet radiation and ultrasound. On the photo: Dr. V.V. 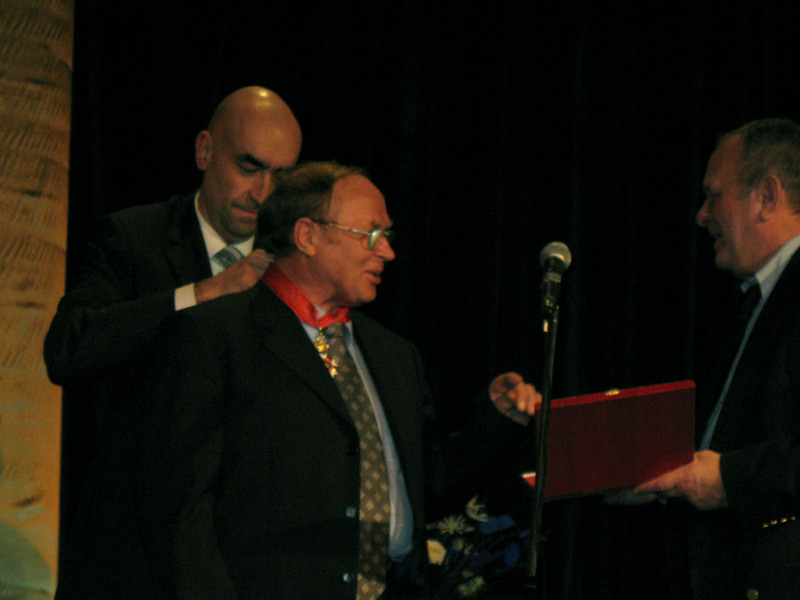 Fadeev, the authorized national delegate of the Russian Federation at the Geneva International Innovative Exhibition, presents the awards to Dr. A.N. Ul'yanov, the Preisident of JSC SVAROG. With the purpose of further development of trade activity, in August JSC SVAROG has established the “SVAROG Firm, Ltd.” Company. This firm will specialize in the placement of contracts on supplies of the bactericidal equipment and on the provision with necessary components and spare parts of already operating stations of water and sewage treatment based on the use of ultraviolet and ultrasound. In July, active works on the development of a number of large international projects for water and sewage treatment by means of ultraviolet irradiation and ultrasound for Kenya, Romania, and Slovakia were continued. The corresponding decisions on the use of “Lazur” technology in water purification, water treatment, and drainage facilities have been adopted on the government level. The developmental works on the projects of potable water and sewage disinfecting stations to be built on the territories of Russia, the Republic of Belarus, Kazakhstan, and Ukraine with the capacities of up to 3000000 m3/day are in progress. The long period of extremely hot weather in many regions of Russia this summer has caused the significant growth (on average, by 60%) of demand for the whole range of “Lazur” units designed for water treatment by means of ultraviolet and ultrasound. 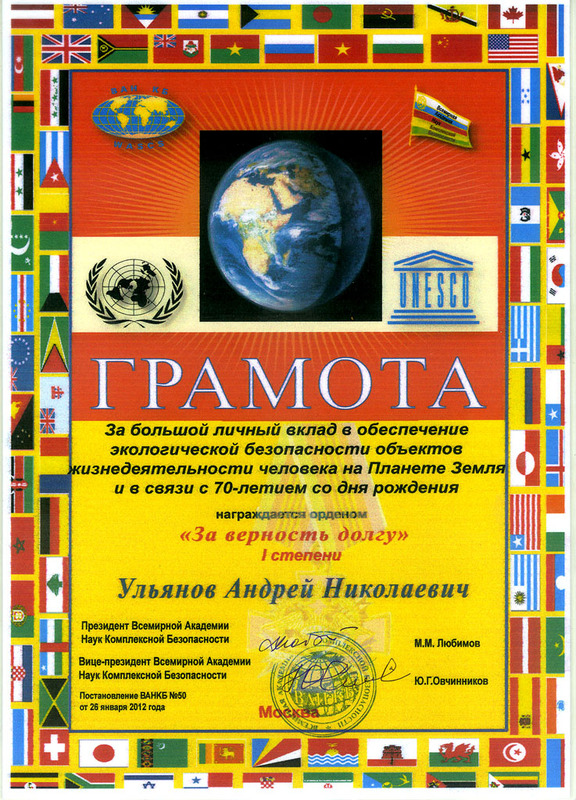 In frameworks of the International Water Association (IWA) activity, the international Exhibition/Conference “Water Purification and Sewage Treatment in Settlements in XXI Century: Technologies, Project Decisions, and Exploitation of Stations”. At the Conference, the President of JSC SVAROG Dr. A.N. 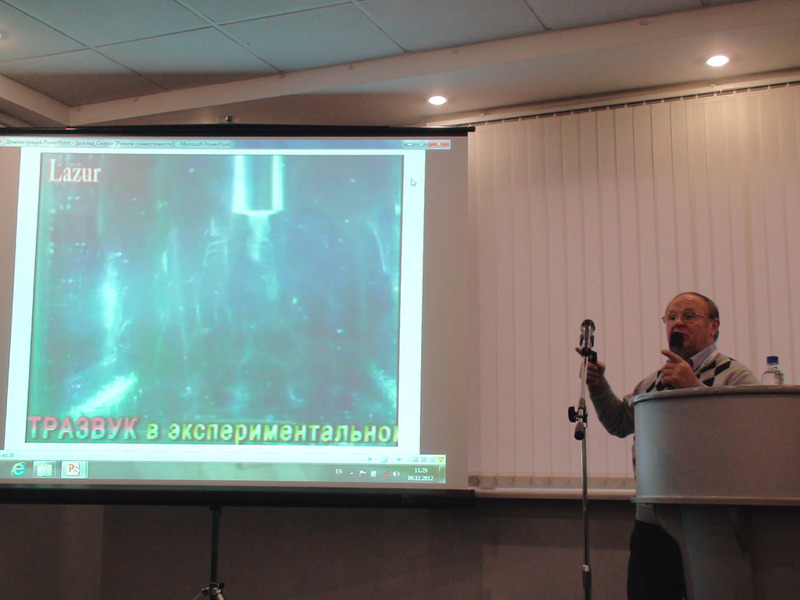 Ul'yanov gave the report “Comprehensive use of ultraviolet and ultrasound for the potable water disinfection”. The report presented the convincing proofs of obvious advantages of the proposed technology which provides significantly greater effectiveness (by a factor of up to 1000) of water disinfection compared with the conventional technologies of water treatment. 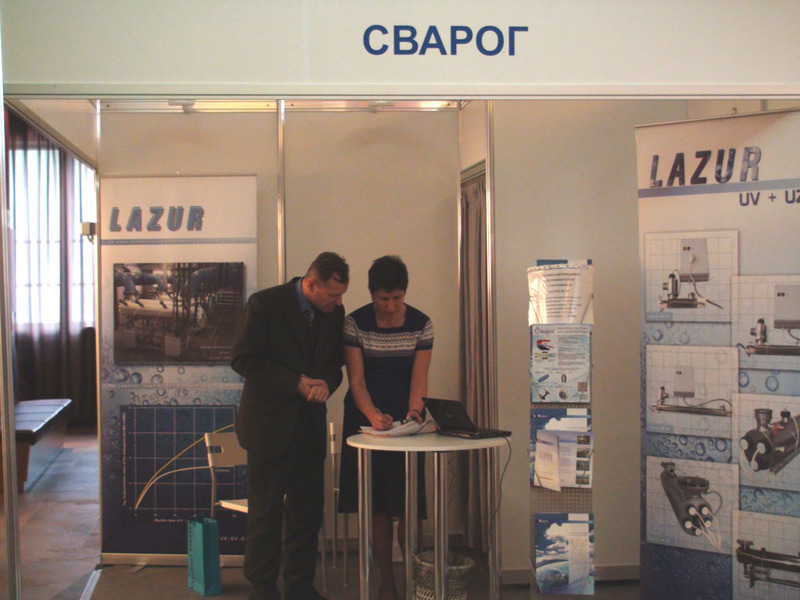 At the exhibition organized in frameworks of the Conference, JSC SVAROG made several presentations of the “Lazur” technology addressed to different industrial companies and water utilities of the Russian Federation. On the photo: Dr. A.N. Ul'yanov gives the report to leading specialists of the Saint Petersburg Vodokanal (Water Utility) Company. The volume of orders for supply of the whole spectrum of “Lazur” units for ultraviolet and ultrasonic disinfection has grown by more than 60%. The contracts on supply of equipment for water and sewage treatment to large industrial objects of Urals and Siberia with the capacities of 230 thousand m3/day, 42 thousand m3/day, and 27 thousand m3/day have been signed. The active realization of the “Pure Water” program, which engages the application of ultraviolet&ultrasonic water treatment technologies, has started in Tyumen' city (West Siberian region). With that, tens of objects for water and sewage treatment were put into operation. 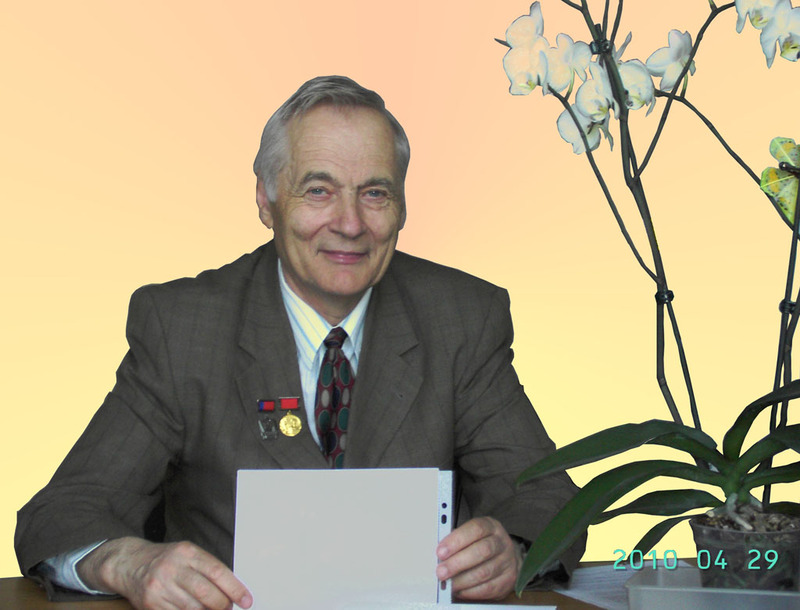 JSC "SVAROG" heartily congratulates Dr. Valeriy A. Alexeev, the Principle Technologist of the Russian Federation, with the seventieth birthday and wishes him good health and creative longevity. In April, JSC "SVAROG" has received the order from China for the supply of the large lot of bactericidal equipment for ultraviolet&ultrasonic water and sewage treatment. JSC "SVAROG" took part in the annual 38-th International Exhibition of Inventions, New Techniques, and Products in Geneva, Switzerland. The presented technical know-how on water and sewage purification, treatment, and disinfection by ultraviolet irradiation with the use of ultrasound were marked by the large golden medal, diploma, and special prize. The international contacts of JSC SVAROG are actively developing. The company has received the specific proposals on supply of the large lots of "Lazur" bactericidal units for water and sewage disinfection from Bulgaria, Romania, and Slovakia. 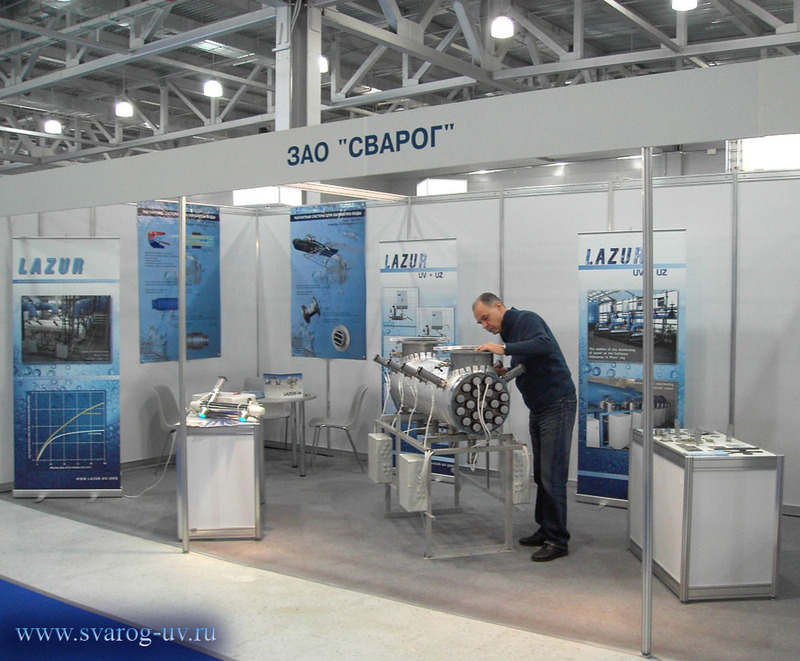 The permanently growing demand for the units of "Lazur" series on the territory of Europe caused the necessity of creation of the branch SVAROG Company in one of the EC countries. As a result, the European Joint Stock Company "Svarog-EcoTech a.s." has been established and registered in Bratislava, the Republic of Slovakia. The goal of this company is the promotion of "Lazur" water and sewage treatment technologies to the European market. The other important task of the company is the application of new technologies of the recycling of solid domestic wastes with the subsequent energy production. February was marked by the mass orders for bactericidal "Lazur" units for the equipping of swimming pools and water and sewage treatment systems. It is noteworthy that this time the significant volume of equipment with the capacity of up to 1000 m3/h was delivered to Tol'yatti city, which is known as the citadel of the LIT Company. The active developmental work on the projects for a number of large Siberian settlements for water and sewage treatment based on the use of ultraviolet disinfection technologies in combination with ultrasound is close to completion. In contrast to the most of other companies, the volume of orders received by JSC "SVAROG" in January for bactericidal equipment for water and sewage disinfection has grown more than twice compared with the corresponding period of 2009. 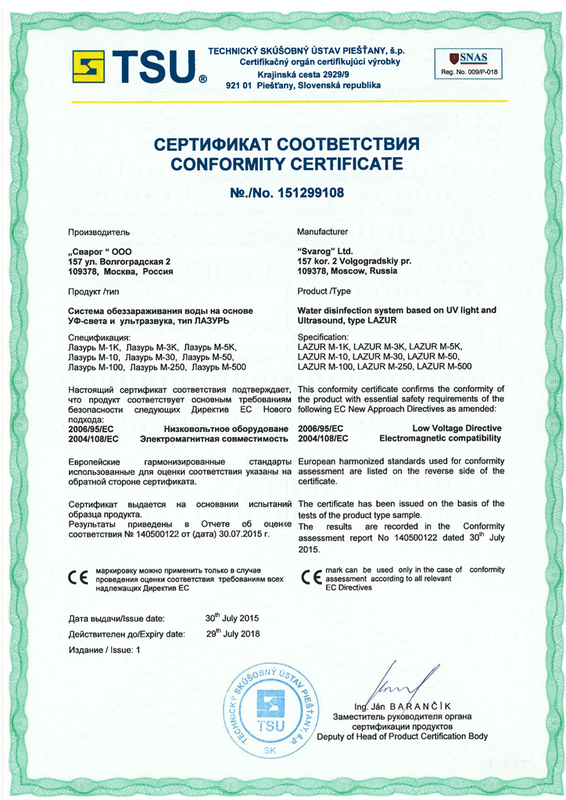 The whole spectrum of "Lazur" bactericidal units produced by our company is claimed. The significantly increased interest of Vodokanal (Water Utility) companies in combined use of ultraviolet irradiation with ultrasound for water treatment technologies is marked. The last year was rather productive for our company. The sale volume of units and stations for disinfection of water and sewage by the UV radiation in combination with ultrasound of the high productivity for the enterprises of housing and communal services and the industrial enterprises has significantly grown up. The order package for manufacturing of the LAZUR units with overall productivity more than 2 000 000 cubic metres a day is collected. Orders for disinfection units “LAZUR” have arrived from more than 20 countries of the world. The technology of disinfecting of water and sewage was successfully presented on more than 10 international exhibitions of all continents. The president of the company Uljanov A.N. 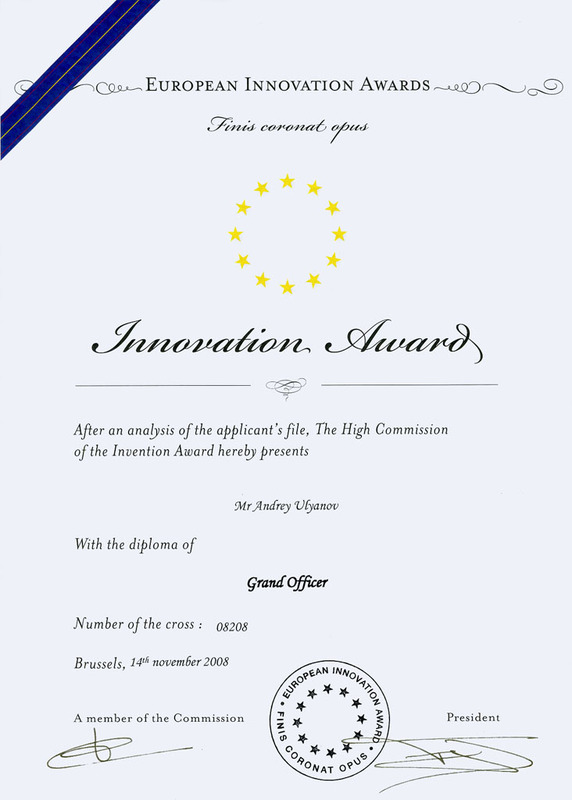 has been awarded by the highest award of the European Union “Ruban d Ordre Grand Officer” for development and implementation of the new innovative technologies in the field of water preparation, water purification and water disinfection by means of ultraviolet and ultrasound. 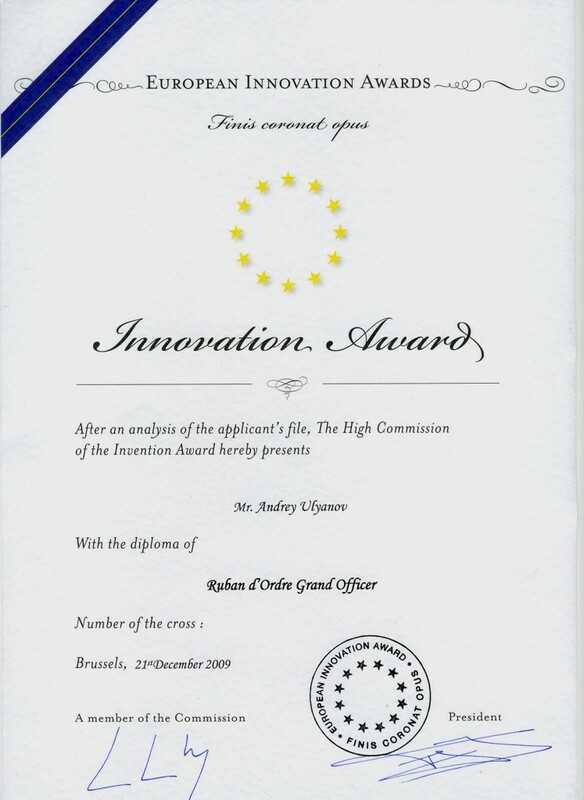 Award delivery was conducted by the official representative of the Russian Federation at the forum “European Innovation Awards” in Brussels , Doctor of Technical Science Fadeev V.V. 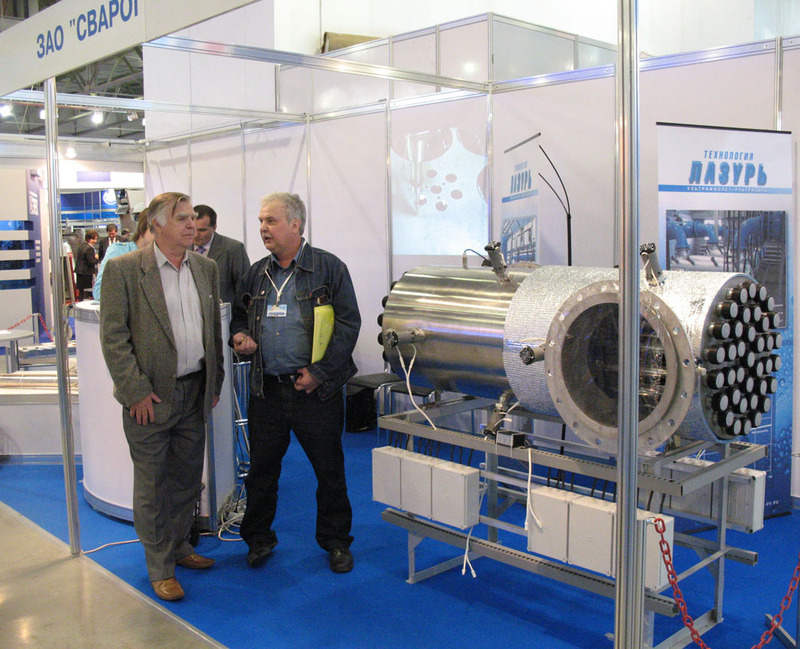 On November, 18-21 in Moscow at “The Crocus Expo” the International forum “Innovations and Technologies 2009” has taken place. 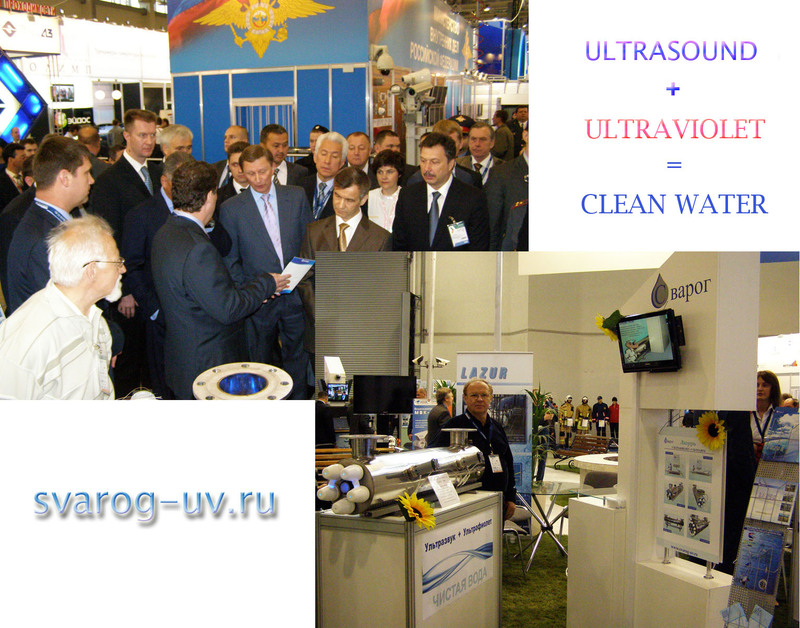 The company “SVAROG” has taken active part in this event where has demonstrated the newest technology for water preparation, water purification and water disinfection by means of UV radiation together with ultrasound action. The president of SVAROG Mr Ul'yanov took part in forum work with the report “Technology “Lazur” - a new step in disinfection of water and sewage”. On November, 24-25th in Moscow at the “World Trade Centre” under patronage of the Russian Federation Government the International forum “Pure Water “devoted to fundamental and practical issues of supplying of the potable water to the population of the Earth as well as to questions regarding the water preparation, the water purification and the water disinfection in development of the Russian water industry has taken place. 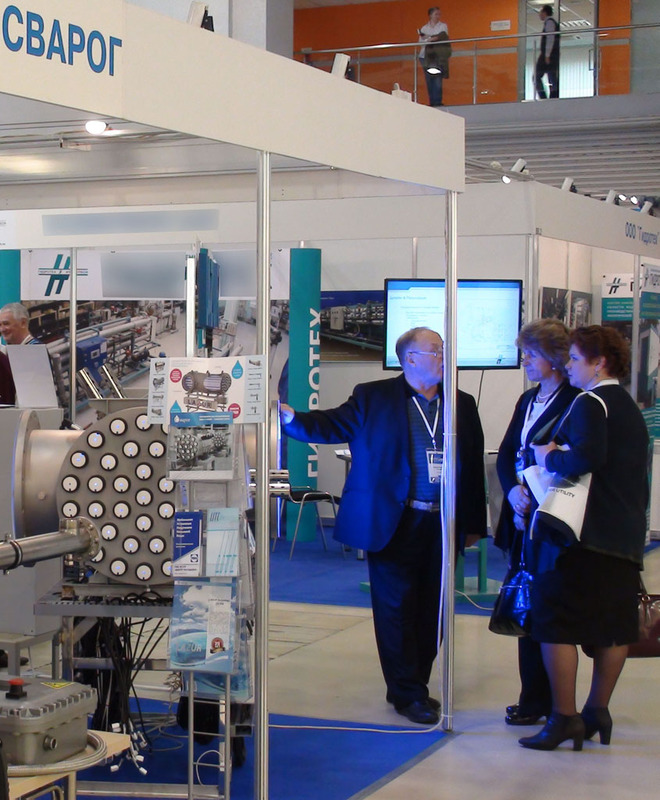 The”SVAROG” exposition exhibiting the bactericidal module (with capacity up to 1000 m3/hr) for disinfection of drinking water and sewage by the UV radiation enhanced by ultrasound action has attracted the great interest of visitors and participants of the forum. On a photo (see below): Saprykin V.V., the President of group of the Companies “METTEM”; Karmazinov F.V., the President of the National union of water canals of Russia; Ul'yanov A.N., the President of Joint-Stock Company “SVAROG” – discussion of the project with overall productivity up to 1 500 000 m3/day for sewage disinfection by the UV radiation together with ultrasound action in Sankt- Petersburg. 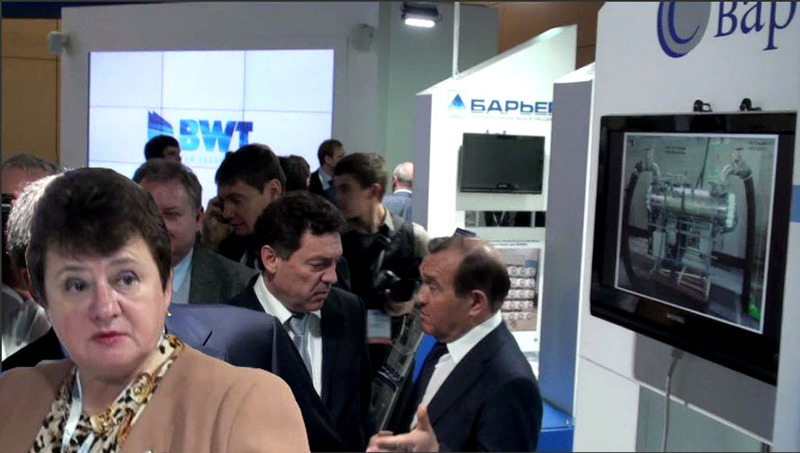 The Chairman of the Moscow municipal Duma Mr Platonov V. M has visited the company stand “METTEM-TECHNOLOGY”, Joint-Stock Company “SVAROG”, where he has been familiarised with technology for water preparation, water purification, and disinfection of water and sewage by the UV radiation together with ultrasound action. At the forum have acted with the joint report- “Technology “Lazur”- a new step in disinfection of water and sewage”, the President of the Joint-Stock Company”SVAROG” Mr Ul'yanov A.N. 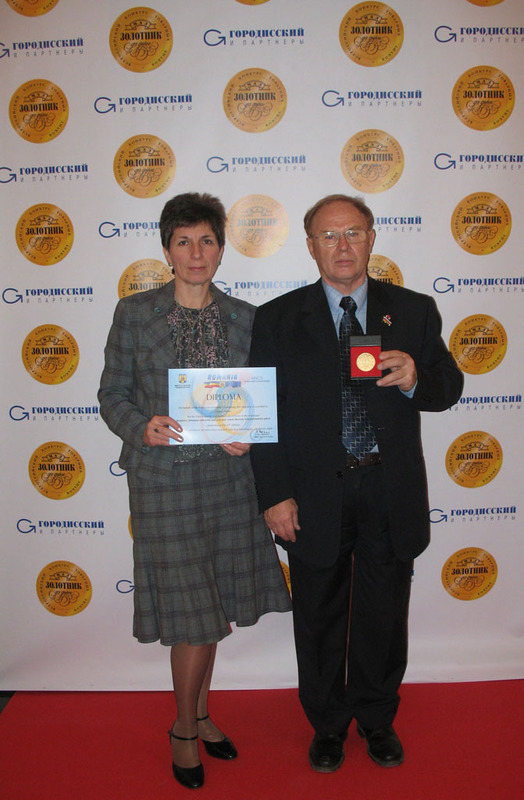 and the Director of Open Company of scientific and technological centre ”FONOVIT” Zhurba M.G. Large stations for water preparation, water purification and disinfection of potable water and sewage by the UV radiation and ultrasound in Perm (“Lukoil-Permnefteorgsintez”), in Kemerovo (mine Southern “Kuzbas Coal”), in Tatarstan Republic (Aznakaevo), in Republic Bashkortostan (Tuimazy) have been commissioned. 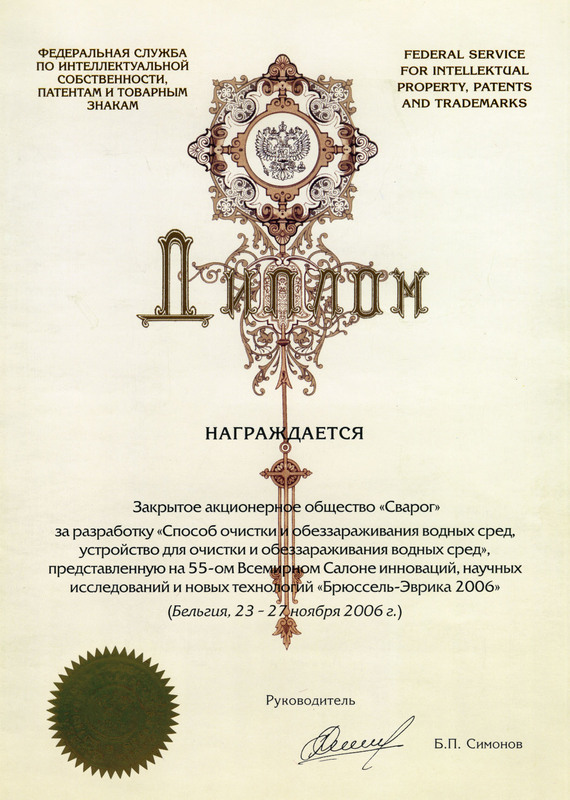 The state contract between the company “SVAROG” and the Ministry of the Industry and Trade of the Russian Federation with aim of carrying out the research and development of new base non-reagent resource-saving technologies, which are focused on disinfecting the natural drinking water and sewage by the combined use of various physical processes such as UV and ultrasonic radiation, electro- impulse influence, magnetic field and acoustic vibrations was signed. It is being planned to continue up to 2016 the multi-stage cooperation regarding R&D of new technologies for water purification, water preparation, disinfection of water and sewage by the UV radiation enhanced by the ultrasound action. 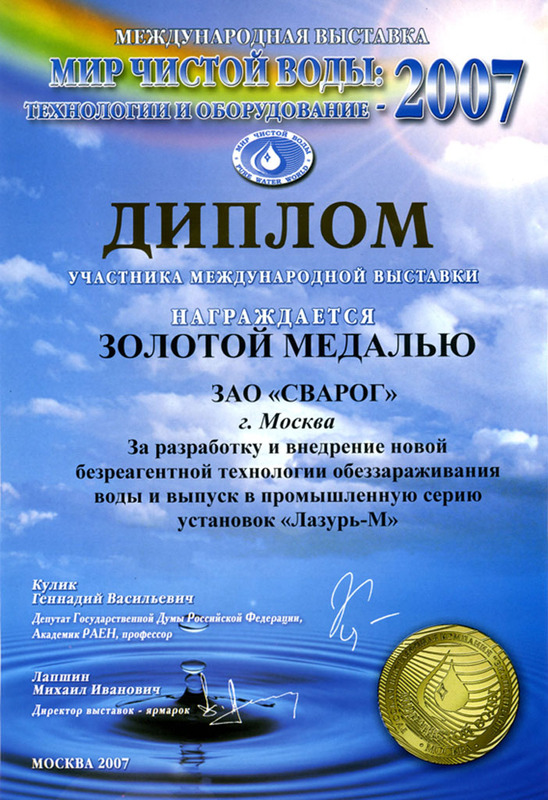 The magnetic water treatment (magnetic water preparation) according to the test program was conducted on open reservoirs of Moscow in September gave steady positive results regarding magnetic influence on water purification and water disinfection. 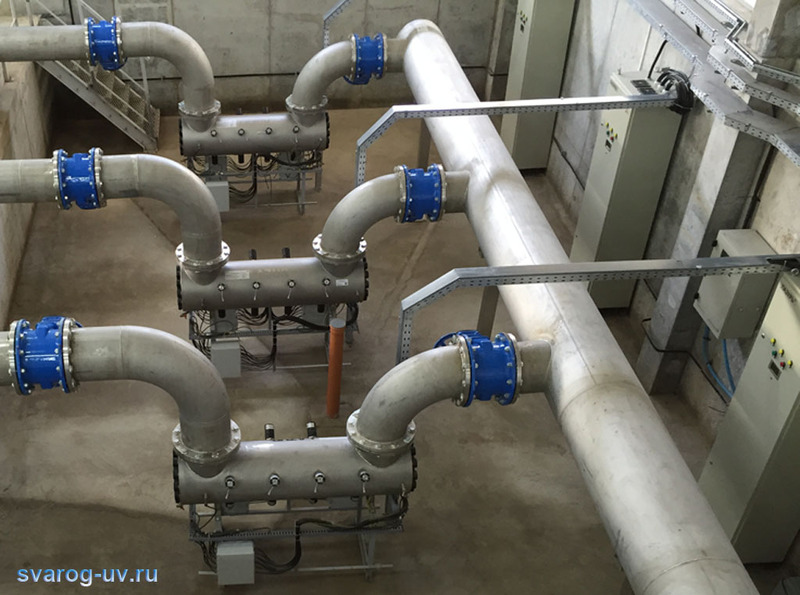 Water in reservoirs became transparent up to depth of 1.5 m.
The designing of a large station for disinfection of sewage by the UV radiation combined with ultrasound action (300 000 m3/day) has begun in one of regions of the Russian Federation . Finalisation of projects is being planned in November 2009. President of Joint-Stock Company “SVAROG” Mr Ul'yanov has made a report on the anniversary session of the STC “Scientific research institute “Project” of the Mosvodokanal”. The report has drawn the general attention. The presented technology based on simultaneous treatment of water by UV radiation and ultrasound together with magnetic processing has received positive estimation of audience. The decision on the report publication is accepted. The program devoted to purification, preparation and disinfection of water in reservoirs of Moscow by means of the magnetic treatment is being preceded. The further increase of demand on large disinfection units “LAZUR” is being noticed in August. The customers prefer the water disinfection equipment produced by “SVAROG” instead of the disinfection systems made by “Lit”, “EGA-XXI CENTURY”, etc. Even already ready projects of stations for disinfection of water and sewage by UV radiation are being altered under “Lazur” technology. Tests of magnetic treatment of water (magnetic water preparation) on Borisovsky ponds of Moscow (see the photo) have been successfully completed. Water after treatment has been disinfected and become clearer. The preliminary test results have been reported to the mayor of Moscow Mr Luzhkovu J.M. The decision regarding further testing of “Lazur” technology not only on reservoirs, but also in various socially-important city objects such as schools, hospitals, kindergartens etc. has been accepted. Within the frame of the project “Pure Water” in accordance to the instructions of the governor in two districts of Tyumen region, the program of water preparation, water purification and water disinfection by the UV radiation in combination with ultrasound action has been developed. Ten settlements with overall population more than 100000 people is being covered by this program. Implementation of the “Lazur” technology in various areas of the industry and a national economy of Russia is being successfully continued. Despite economic recession, the order volume has grown up on 50 % in comparison with the corresponding period of last year. The company ”SVAROG” participates in the State Federal Program “Pure Water to inhabitants of Russia”, where the “Lazur” technology is being employed to disinfect water in the housing complex “3rd pipe” and in the socially-important objects such as schools, kindergartens, hospitals etc. The recultivation program of reservoirs in Moscow by means of magnetic treatment of water (magnetic water preparation) has begun. In end of month the meeting in Ministry of the housing and communal services has taken place. The test program of magnetic treatment of water on concrete reservoirs of a city has been confirmed. Joint-Stock Company “SVAROG” is actively participating in this program. The large-scale station of afterpurification and disinfection of effluent is successfully operated at one of the enterprises of the LUKOIL Public Corporation. The recently built station of waste-water treatment was examined by the group of the authorized officials including (from left to right on the photo below) V. Alikperov, the President of the LUKOIL Public Corporation, A.V. Leifrid, the General Director of the LUKOIL-PERM' Public Corporation, G.A. Rapota, the plenipotentiary of the President in the Privolzhskiy Federal District of the Russian Federation, V.Yu. Zhukov, the General Director of the LUKOIL-Permnefteorgsynthes Public Corporation, O.A. Chirkunov, the Governor of Permskii krai, and V.A. 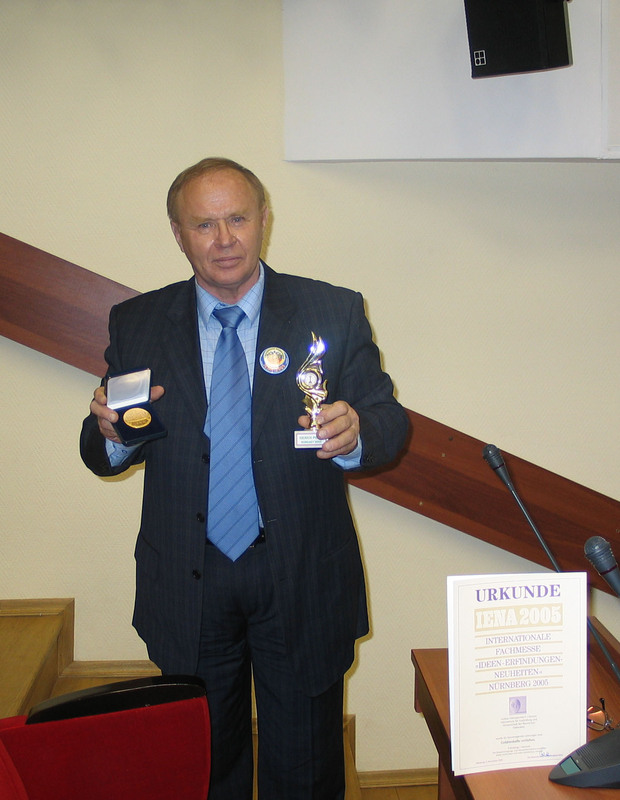 Vrublevskii, the head of UVK and OSV of the LUKOIL-Permnefteorgsynthes Public Corporation. The impressive results of the action of ultrasound and ultraviolet to water under treatment have been demonstrated including the effects in the sewage clarification (see the photo) after the passing of water through “Lazur M-250” disinfecting units. The industrial section of water treatment and water purification – the station of the filtration of sewage at one of the enterprises of the LUKOIL Public Corporation is shown on the photo. The section of the disinfection of sewage - the station of sewage disinfection by means of ultraviolet radiation and ultrasound at one of the enterprises of the LUKOIL Public Corporation is shown on the photo. The large-scale station of the disinfecting of the mine water for the secondary use has been mounted and put into operation at the mine Yuzhnaya (Kuzbass-Ugol' Corporation). The technology is based on combined action of ultraviolet radiation and ultrasound. The station is constructed of module units “Lazur M-250”. The cooperative projects of the JSC SVAROG in the Chinese provinces Beijing, Jiangsu, Shanhai, Guangdong, Sichuan, Anhui, and the Hong Kong Special Administrative Region are actively developing. The cooperative project of JSC “SVAROG” and a number of Russian companies aiming the creation of the up-to-date units for water purification and disinfection and sewage in railway vehicles entered into the finishing stage. This wok is performed in the interests of the Russian Railroad Joint Stock Company. The modified Lazur-M units have successfully passed the performance tests including those in the testing railway vehicle. The performance tests of “Lazur-M” water and sewage disinfecting units at two enterprises in China producing soft drinks and bear have been successfully. These tests were organized by our partner “China Jiangsu Science & Technology Development Co., Ltd” company. The preparation of two high-capacity “Lazur-M” water/sewage disinfecting units for service tests at two large-scale Chinese enterprises on mineral and drinking water bottling is in progress. 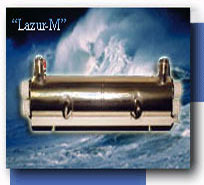 Simultaneously, marketing for “Lazur-M” units in China is performed. Despite negative character in development of the present economic situation in Russia, the demand for the products of JSC SVAROG remains high; no drop was observed in January. 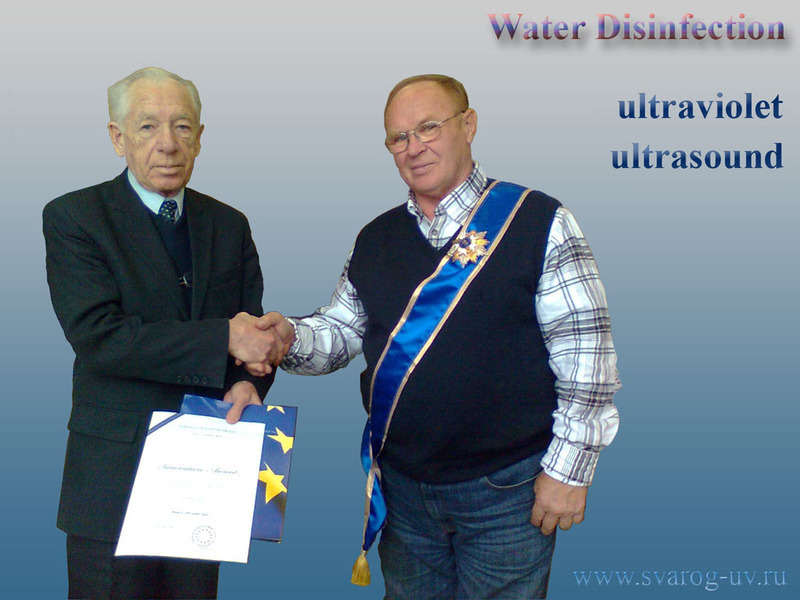 In May 2008, JSC SVAROG has become the collective member of the International Ultraviolet Association (IUVA), specializing in collaboration in the field of UV applications for water and sewage treatment. Earlier (2007), JSC SVAROG entered into the International Water Association (IWA). Despite the total business decline observed in Russia during the IV quarter, the sales volume of SVAROG Company in December 2008 has exceeded that of December 2007 by almost two times. 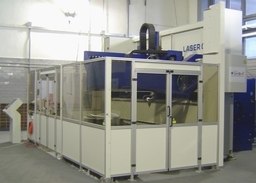 The results of business activity of the company in 2008 reveal the considerable growth in the volume of orders for the modular units of high capacity such as “Lazur M-100, 250, and 500”. The customers running our equipment point to their high performance quality and reliability and comparatively low prices as compared with the products of other home and foreign manufacturers. The company gains ever growing international authority. 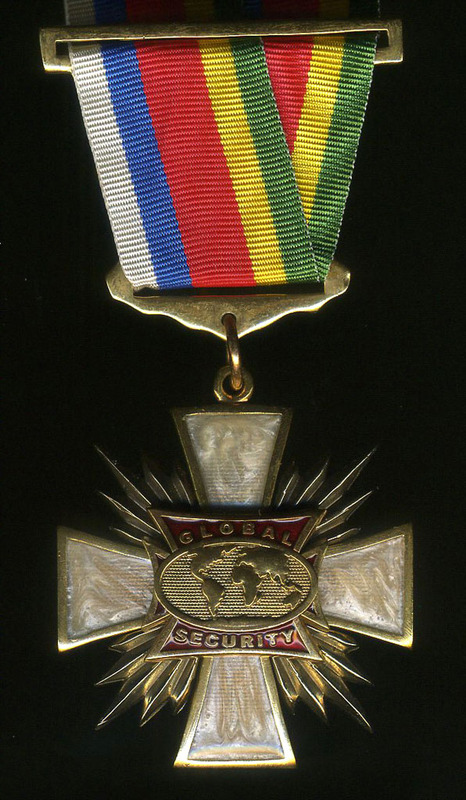 Its products were marked with medals and diploma at a number of exhibitions in Russia and abroad. 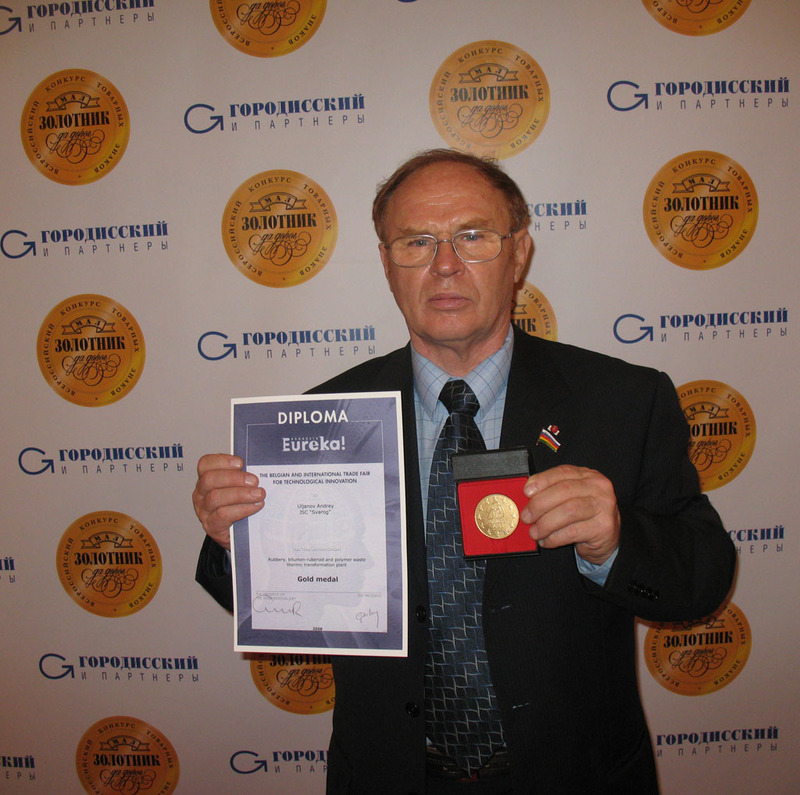 In 2008 at the all-Russia “Zolotnik” competition, the technologies of Russian companies which won the international recognition were nominated. 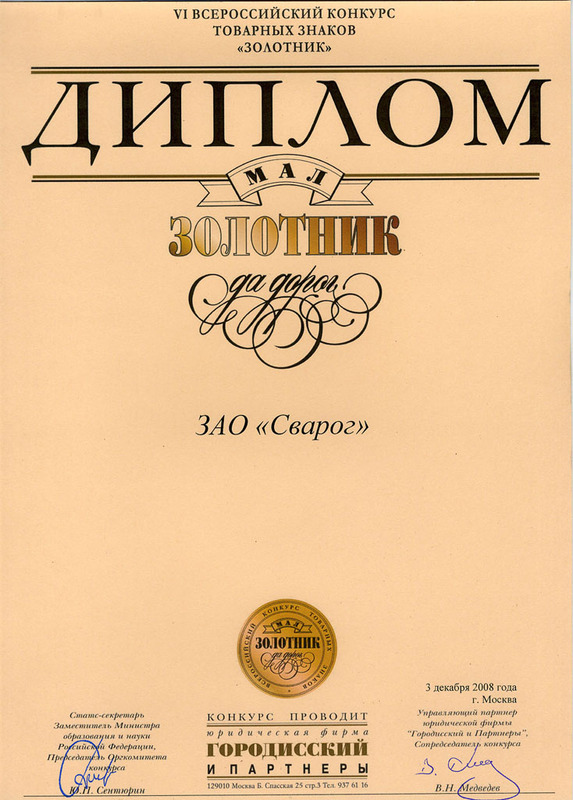 SVAROG Company has become the first laureate in Zolotnik – 2008 competition in this nomination. “Water Expo China” international exhibition in Beijing turned out to be most successful for the presentation of water and sewage disinfection technologies and for signing the agreements with a number of private companies and government institutions of China. The reports at the University of Beijing and at the Beijing Water Channel Institution on the possibilities of “Lazur” technologies for water and sewage disinfection resulted in signing of a number of beneficial agreements. At least five significant Chinese companies made the resolve to apply the technologies and equipment developed by JSC “SVAROG” in their water/sewage treatment systems. 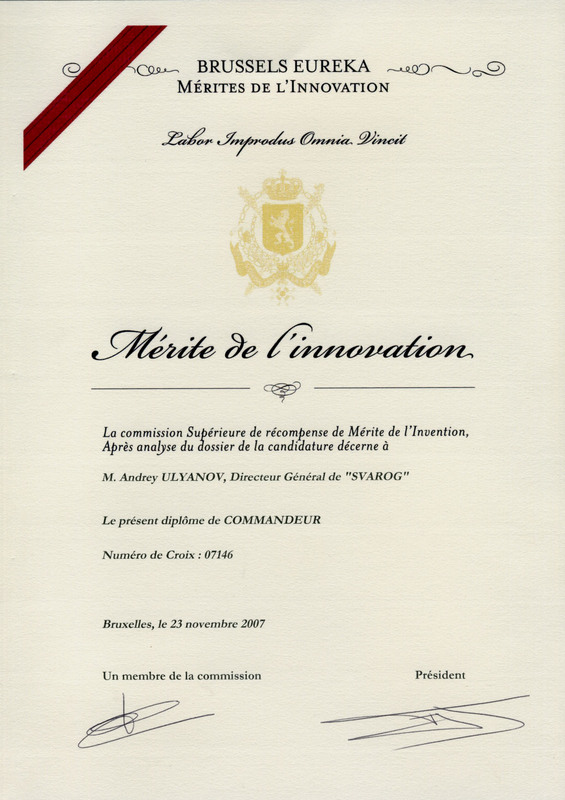 The exposition of JSC “SVAROG” at the annual International Salon “Brussels – Eureka 2008” was marked with the special diploma and Dr. Andrei N. Ul'yanov, the General Director of the company, was awarded with the highest reward – the Order “For the Achievements in Inventions” of the 4-th degree, “Grand Officer”. 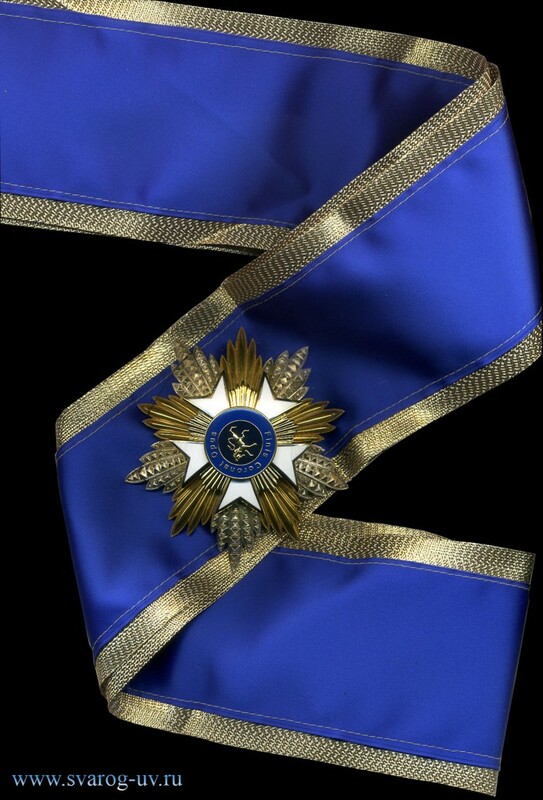 This reward is given only in exceptional cases or to heads of states. 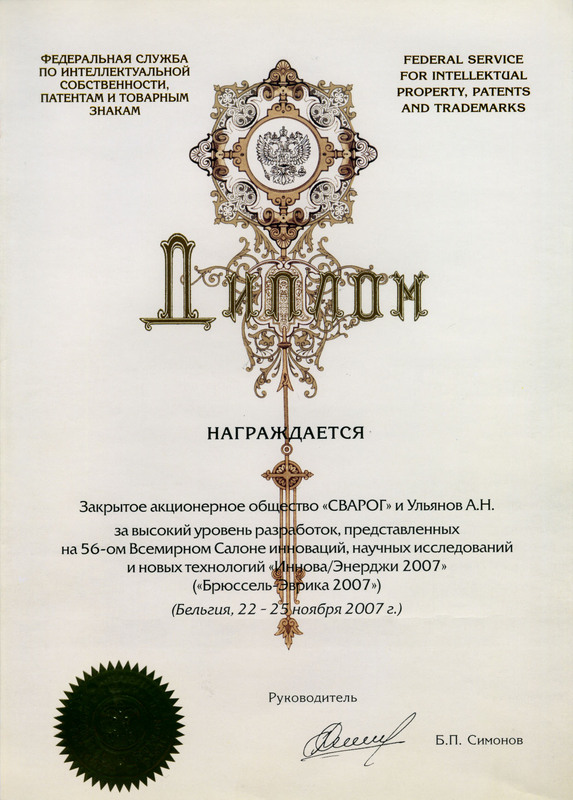 The solemn ceremony of handing of the rewards took place in Moscow at the Russian Academy of Theater Art (GITIS) on December 3, 2008. The official persons from the Supreme Commission on Rewards of Belgium were present at the ceremony. The official negotiations on the bilateral cooperation with the prominent Chinease company “China Jiangsu Science & Technology Development Co., Ltd” took place in Moscow. This company is engaged in the promotion of advanced technologies for water treatment to the South-East regions of China. The negotiations resulted in the joint cooperation agreement and the schedule of SVAROG's equipment supplies for 2009 with the total volume of 1,000,000 Euro. 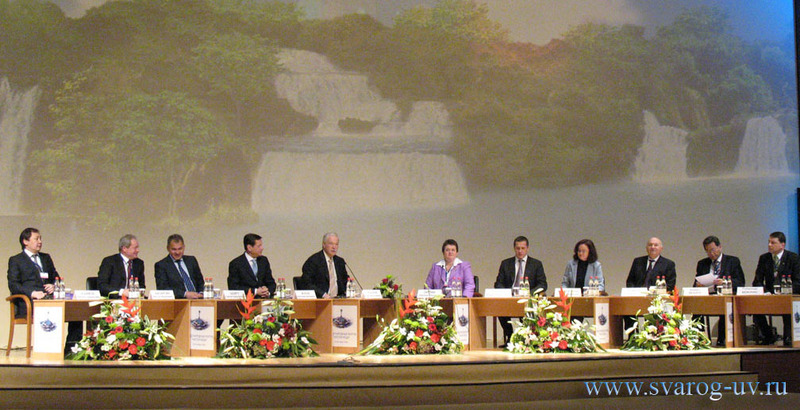 The International Forum “Russia – Canada 2008” took place in Toronto, Canada. A number of high-tech innovations and technologies were presented at this forum. The technologies of water and sewage treatment and of the domestic waste processing proposed by the JSC SVAROG were highly evaluated and marked with the special diploma. In frameworks of this forum, the technical and commercial meetings and negotiations with a number of Canadian and American companies have passed that resulted in bilateral agreements on intentions. JSC SVAROG had entered into several agreements with the regional water-treatment stations and institutions on supply of disinfecting equipment based on “Lazur” technologies with the total capacity of about 2 000 000 m3/day. 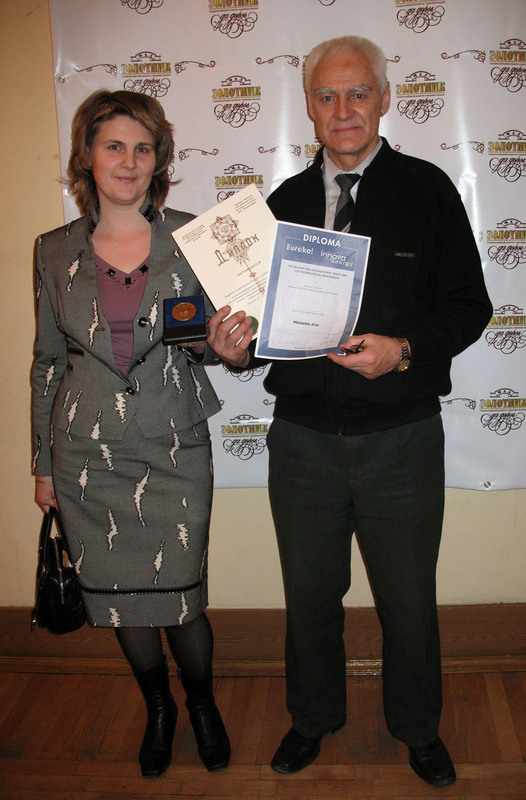 Our participation in the exhibition was marked by the diploma (see the photo below). 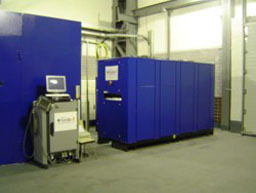 The full-scale tests of Lazur-M series units have been performed. The tests were carried out for different UV transparency levels of media under treatment as well as for different values of capacity. During these tests, the effectiveness of cleaning of protective fused silica glass casings and inner walls of photochemical reactors (PCR) with regard to precipitates from a treated media were estimated. The results of these tests referred to Lazur-M units satisfied to the requirements of SanPin (sanitary norms and regulations of the Russian Federation). The surfaces of protective casings and PCR body walls in Lazur-M units were completely cleanable in the range of turbidity levels of up to 100 mg/l. 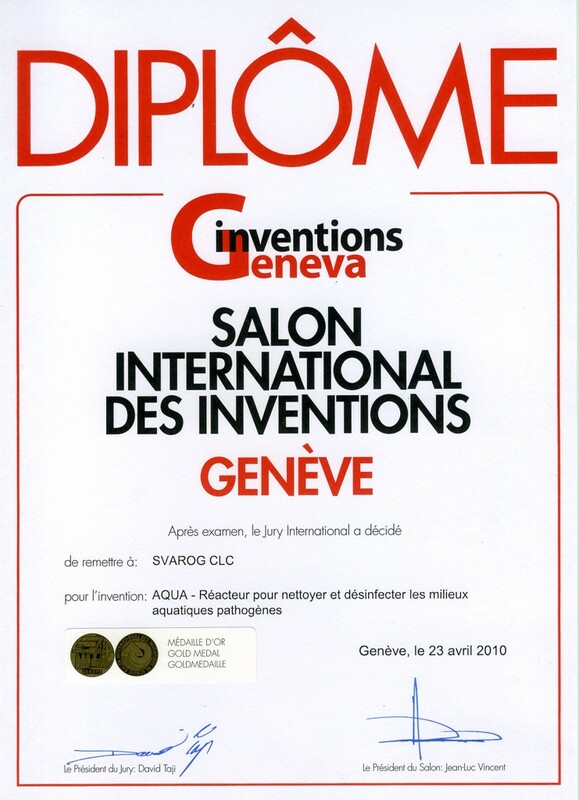 The products and technological elaborations of JSC SVAROG have been demonstrated at the 36-th International Salon of New Techniques and Goods “Geneva - 2008” (Geneva, Switzerland) and were awarded with the golden medal and diploma. 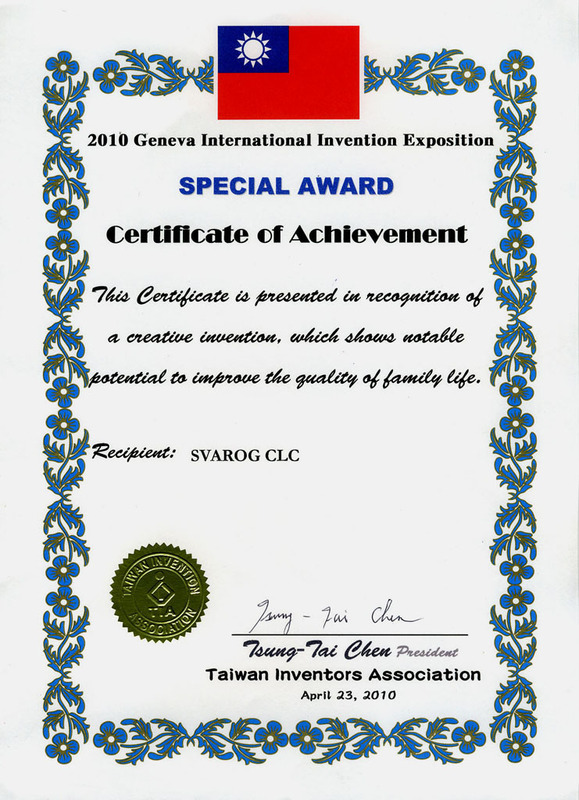 The “Lazur-M” technology won the Prize ob the Geneva canton “For Outstanding Contribution into Technical Development”. JSC SVAROG actively participates in the specialized international exhibitions and congresses on water treatment and sewage purification and disinfection technologies.  the International Exhibition “WATER-EXPO-CHINA” (China, November 2008). Our company carries out the intense preparation to these important professional events and disseminates beforehand the corresponding information among its partners and customers with invitations to visit our expositions. 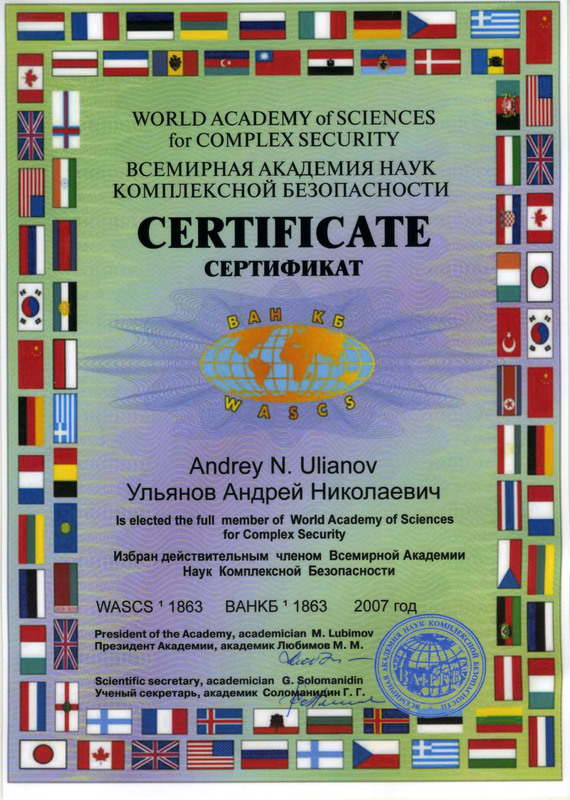 Dr. Andrey N. Ul'uanov, the president of JSC “SVAROG”, was elected the full member of the World Academy of Sciences of the Integral Safety, the Department of Environmental Safety and was also marked by decorating with the order “For Services in the Interests of Russia”. Thus, highly effective long-term activity of personally Dr. A. Ul'yanov as well as of the whole team of the company on development and putting into operation of water and sewage disinfection technologies in direct interests of environmental safety were recognized and marked. Full-scale certification tests of Lazur-M-type units for the disinfecting of potable water and sewages with respect to pathogenic microflora have been completed. The microbiological and parasitological tests and relevant studies were performed at the Australian Water Quality Center (Adelaida city, Australia) and at the Martsynovskii Institute of Medical Parasitology and Tropic Medicines (Moscow). The data of the above tests detailed in the corresponding final reports testify that Lazur-M technology allows us to disinfect the pathogenic microflora at the level (1 3 Lg) significantly exceeding the requirements of all international standards. The application of recently supplied Lazur-M30 water disinfecting unit in the children's swimming pool in Birmingham city (Great Britain) made it possible to reduce at least by a factor of 10 the amount of consumed disinfectants and coagulants. JCS SVAROG has received the letter from the institution running the swimming pool for the significant improvement of the ecological and epidemiological state of the swimming pool. 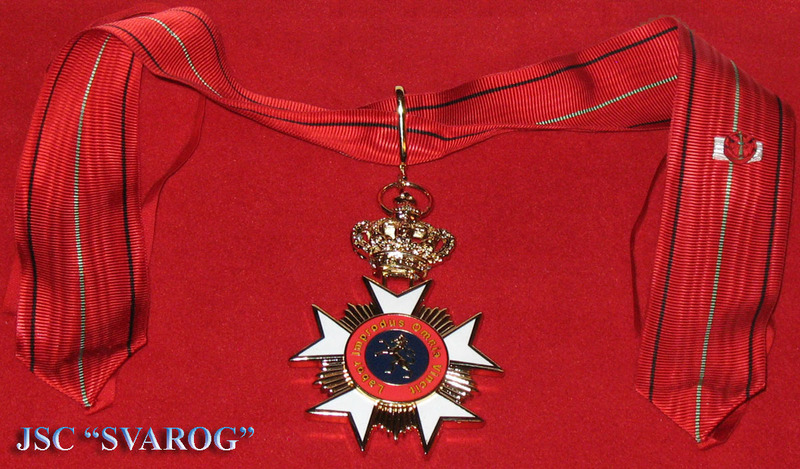 On December 12, 2007 in the building of HELICON Opera, the solemn ceremony of decorating of Russian scientist with the Belgian orders took place. The awards were presented by Mr. Florent Godin, the Chairmen of Organization Committee of the Belgian and International Trade Fair for Technological Innovation. 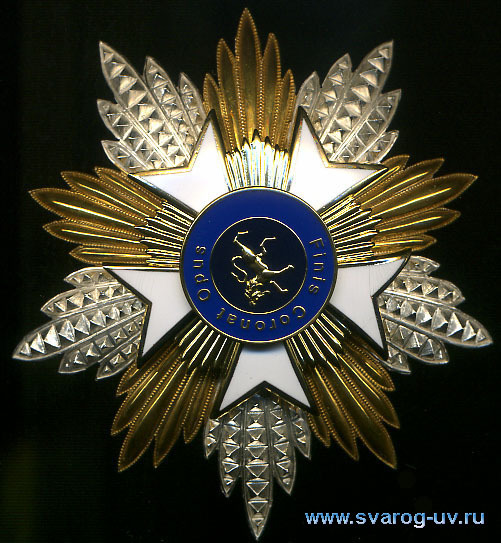 Based on the decision of the Supreme Commission on the Awards of Belgium and with due account of the extraordinary input in the field of innovations and their manufacturing applications, the General Director of JSC “SVAROG” Mr. Andrey N. Ulyanov was awarded with the grade of “Commandeur” and with the order “For the Services in the Field of Innovations”. 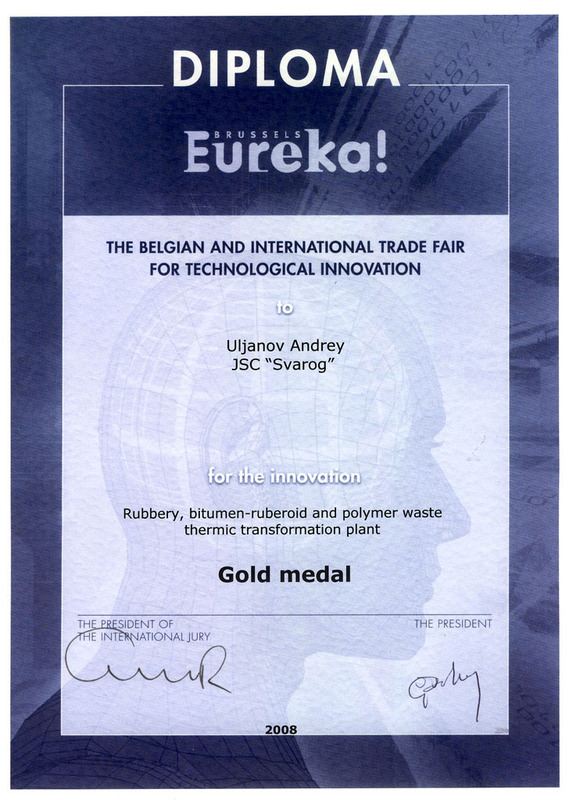 At the International Exhibition of Innovations and New Technologies in Brussels (November 16 – 20, 2007), the products of JSC “SVAROG” – the new method of purification and disinfection of aqueous media including the corresponding technologies and equipment - were marked with the Large Golden Medal. 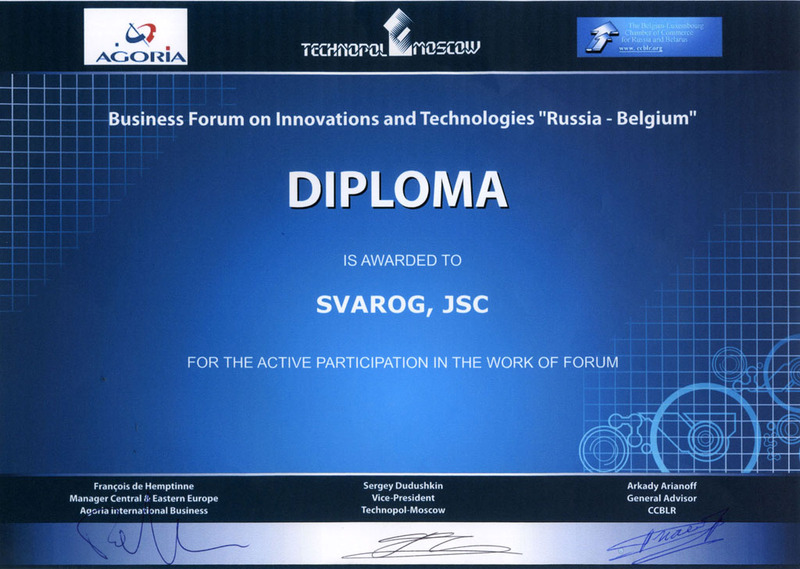 The Federal Agency on Intellectual Property, Patents, and Trade Marks of the Russian Federation has awarded JSC “SVAROG” with the Diploma of the I-st degree for the high level of developments presented at the 56th World Salon of Innovations, Scientific Investigations, and New Technologies “Brussels - Eureka – 2007”. 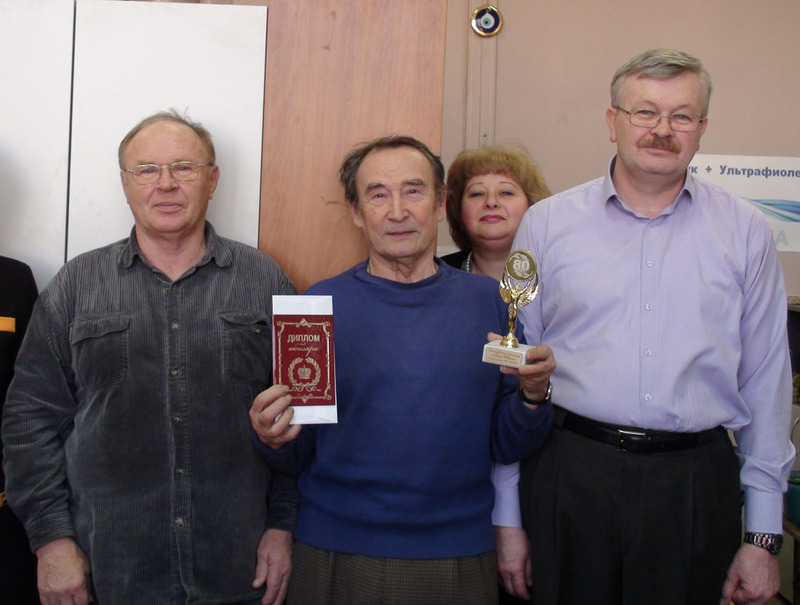 On the photos: the leading specialists of JSC “SVAROG” with the presented awards. 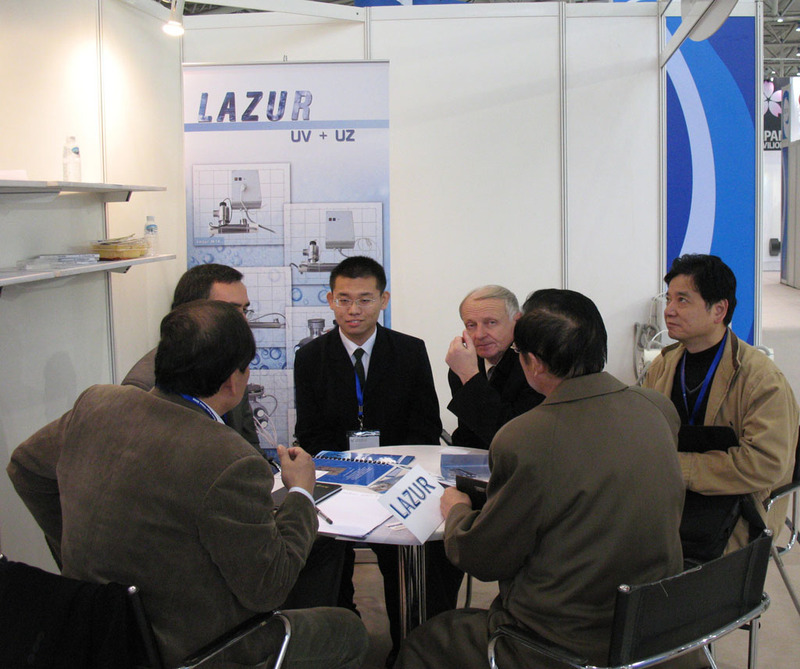 The specialized international exhibitions that took place in Shanghai (29th October – 3rd November) and in Johannesburg (18th– 22nd November) have confirmed the increasing interest to the Lazur-M technologies among the specialists in water and sewage treatment. In the course of these exhibitions, numerous negotiations with government and major private companies of China, Korea, the Republic of South Africa, and Venezuela were carried on. The series of agreements was signed on promotion of the technology for the disinfection of water and sewages and on supplies of the test units (the bactericidal equipment of JSC “SVAROG”) aiming the performance of certification and operation tests and subsequent applications. JSC SVAROG and the Institute of Cybernetic Medicine (Moscow, Russia) have performed the first stage of joint experimental studies on the possibility of improvement of medical products via their treatment by the devices from the complete set of Lazur-M units. Over the period from October 29 to November 3, JSC SVAROG is participating the work of the International Exhibition “WATER EXPO CHINA 2007” on water treatment technologies and equipment in Suzhou city, China (PRC). JSC SVAROG took part in the work of the ecological summit in Sydney (Australia) that proceeded over the period of September 3 – 10, 2007. We received the practicable proposals on the application of “Lazur” technology. In frameworks of the international program, our company is preparing the presentation of products and technologies for the coming International Exhibitions on water treatment technologies and equipment in Suzhou (P.R. China) and in Johannesburg city (the South African Republic). The intense works on development of new compact units of “Lazur” series for the capacity of a single unit from 500 to 1000 m3/h are in progress. This new model is created on a basis of ultrasonic and ultraviolet radiators of new generation. The warranty assurance for key components will be of up to 3 years. The tests of the experimental models of component part have been performed successfully. The international recognition of “Lazur” technology is steadily growing. During July 2007, the technical and commercial contacts have been established and the corresponding agreements signed with several African countries through our partner in the UAE – Magnetic Technology, Ltd. Company. These agreements foresee the supplies of our bactericidal units for the disinfecting of water and sewages and participation in large projects connected with the irrigation systems in the countries in the region of Horn of Africa. A series of companies in Great Britain have also shown keen interest in our products for the use of “Lasur” technologies in water treatment systems for large flat constructions and for the disinfecting of sewages in inhabited localities. In June 2007, the successive stage of trials of our units of Lazur-M series designed for water and sewage disinfection has been completed in Australia. The tests were carried out at the Australian Water Quality Center in Adelaida city. The excellent results have been obtained with regard to all kinds of microflora (of the order of 4 – 5 logarithms for the inactivation degree) and for E – Colli – of the order of 9 logarithms for the inactivation degree. These trials once more testified the advantages of Ultraviolet + Ultrasound technology compared with the conventional UV technology. The international fame of JSC “SVAROG is ever growing. This fact is proved by recently established contacts with the users of our products and technology “Ultraviolet + Ultrasound” from China, Japan, Columbia, Peru, Tuvalu, and Samoa. The demand for our “Lazur-M” disinfecting units has also sharply increased in NIS countries. In the course of the Congress work, Dr. A.N. Ul'yanov, the President of JSC “SVAROG”, made the topical report “Ultraviolet + Utrasound” on up-to-date water treatment technologies. The report evoked keen interest and was positively evaluated by the leading specialists of the Innovation Center in Water Supply and Export of GUP “MosvodokanalNIIproekt” (SUE “Moscow Water Channel Research and Project Institute”) and from FGUP “NII VODGEO” and OAO “NII KVOV” (Research Institute for Public Water Supply and Water Purification). The exhibits and activity of JSC “SVAROG” at the Exhibition were marked by diploma and golden and silver medals (see photos below). The station for the disinfection of effluents in the city of Surgut recently manufactured and supplied by JSC SVAROG operates successfully. 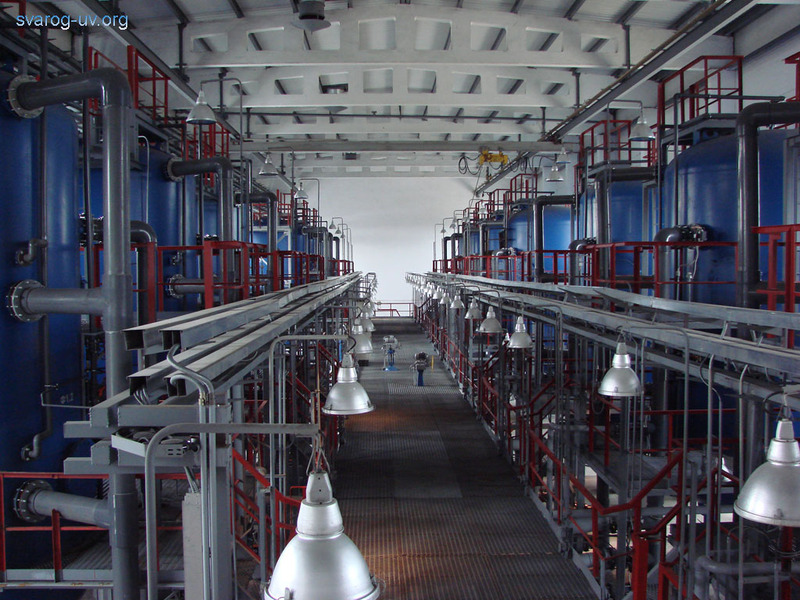 The effluents under treatment are complex with respect to their composition and transparence. The steady growth of demand for “Lazur” series units was observed during February both from the housing and communal services (for the stations of water and waste disinfecting) and industrial enterprises. 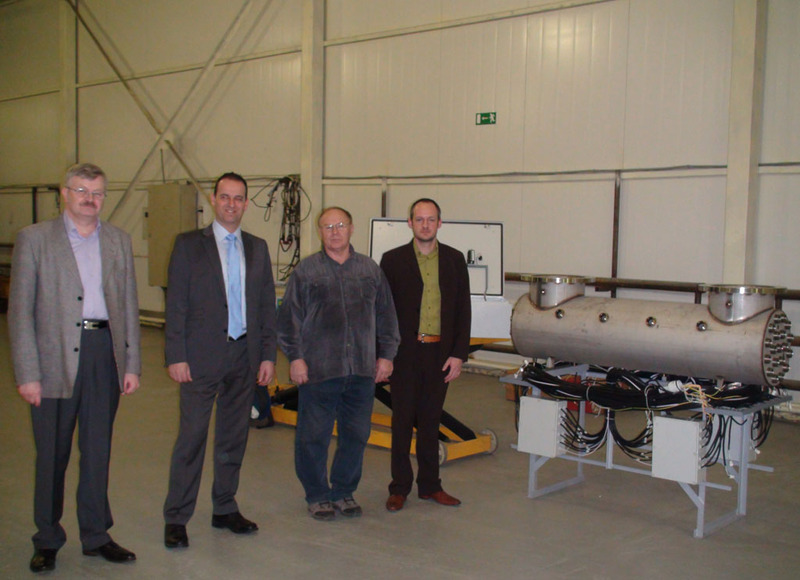 To provide further fabrication of “Lazur” unit bodies by laser technologies at the Laser Innovation Center (LIC), Moscow, JSC “SVAROG” has acquired the technological equipment for a total sum of over 100000 Euro. The test trials of water treatment units equipped with mercury amalgam UV lamps of 1, 3, 5, and 10 m3/h capacity have been successfully completed. This innovation allows one to rise the effectiveness of aqueous media treatment (particularly, of waste water) at least by two times. This is of particular importance for treatment of media possessing poor characteristics with respect to transparence and chromaticity. In January 2007, our company has successfully completed the starting-up and adjustment works on the large station for sewage water disinfecting in Surgut (see the photos below). The results of the tests have given grounds to make the decision with the Customer on the further application of the “Lazur” technology on several other objects of this region. 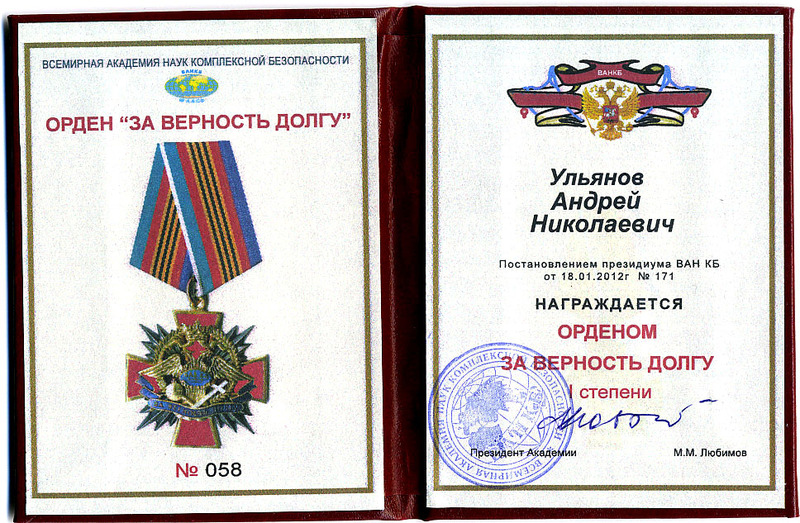 December finishes the year 2006 that has actually become the year of obvious successes for JSC “SVAROG”. The multifold growth of sales volume has demanded to increase substantially the volume of output of the equipment for water and sewage disinfecting. This was also the reason for JSC “SVAROG” and “Moscow Laser Innovation Technological Center” to initiate and carry out during 2006 the cooperative program directed on fabrication of the basic parts of “Lazur” series units using laser cutting and welding technologies. The technologies of fabricating the face flanges and of cutting the stainless steel plates for details of the unit bodies are already worked out. 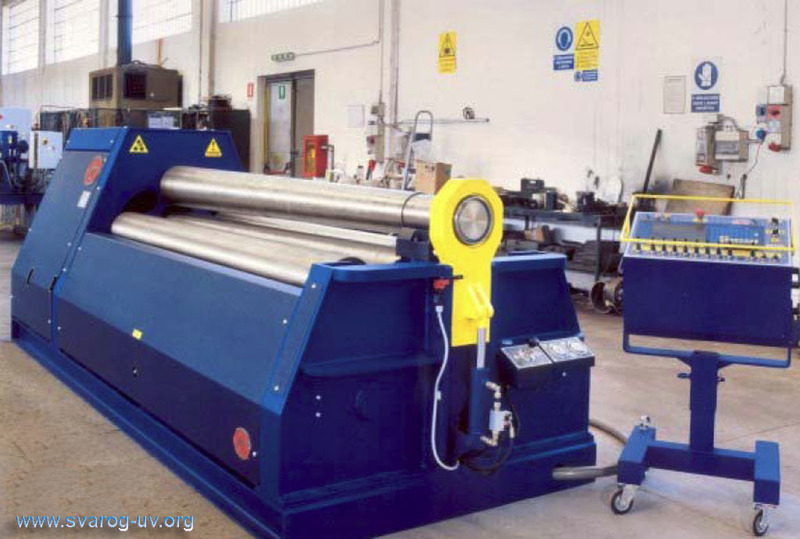 During the next 2007 year, we are planning to transfer the manufacturing technology of fabricating the bodies of “Lazur' units completely to the laser-based processes. Alongside with the highest quality, this will allow us to reduce drastically the time of executing the orders to 2 – 4 weeks after receiving an order. 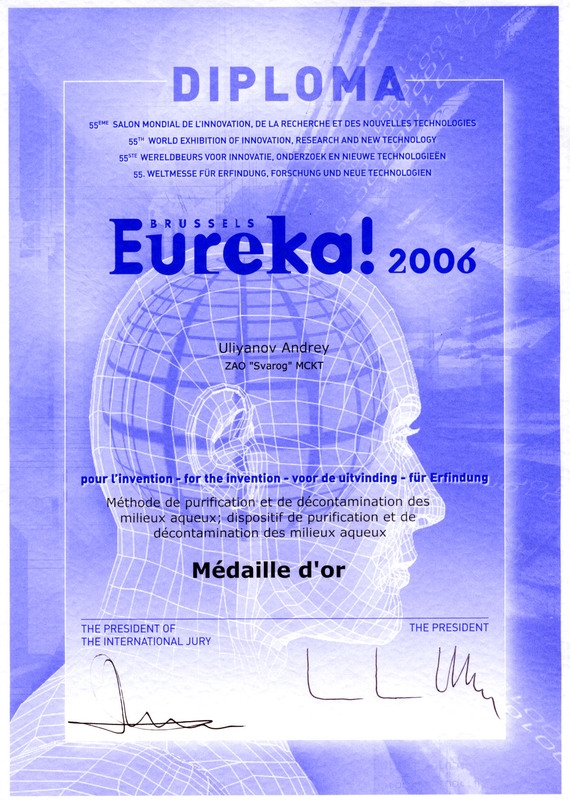 The 55 th World Salon on Innivations, Scientific Investigations, and New Technologies “Brussels – Eureka – 2006” took place in Brussels, Belgium, from 23 to 27 November, 2006. Our company demonstrated its new products, scientific achievements, and applications of “Lazur” technology in various areas. 1. 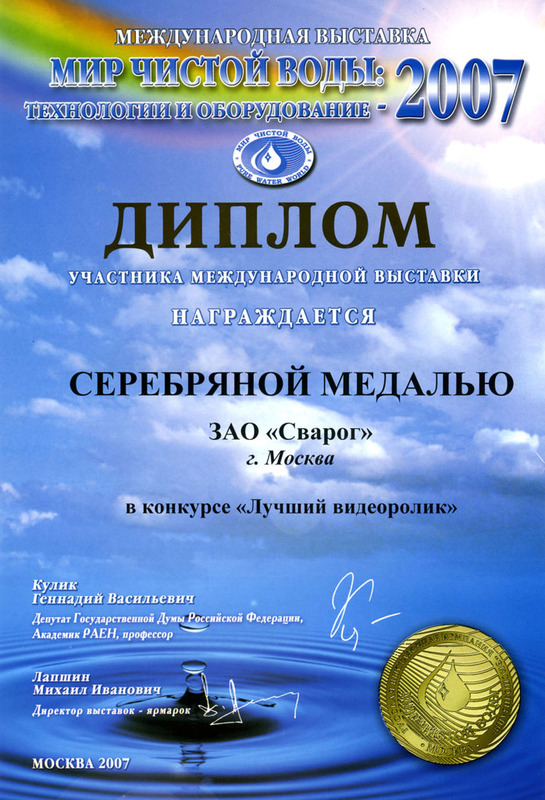 From the results of this international exhibition, JSC “SVAROG” was awarded by the large golden medal for the implementation of novel method of purification and disinfecting of aqueous media. 2. 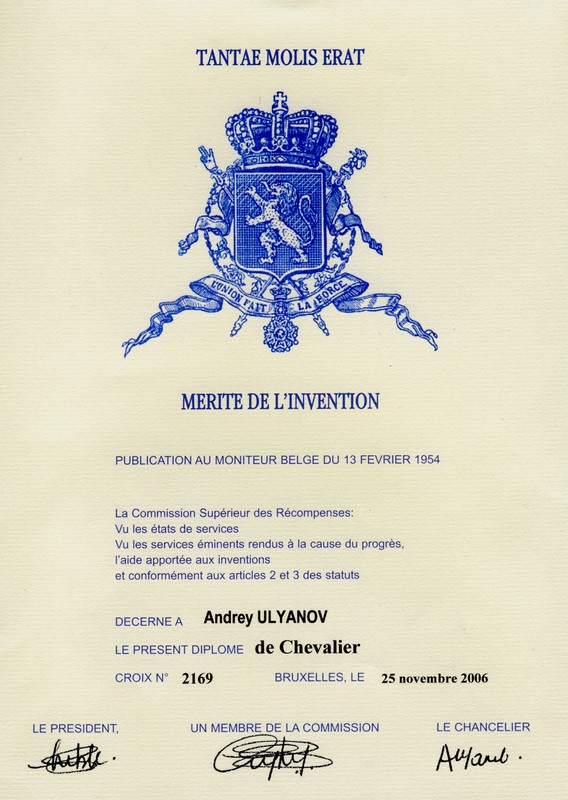 For the great contribution in the field of implementation of new technologies, the Belgian Government has conferred the title “de Chevalier” to Andrey N. Ul'yanov, the President of JSC “SVAROG”, and awarded him with the Belgian order “FOR THE SERVICES IN THE FIELD OF INVENTIONS” of the 4 th degree. 3. 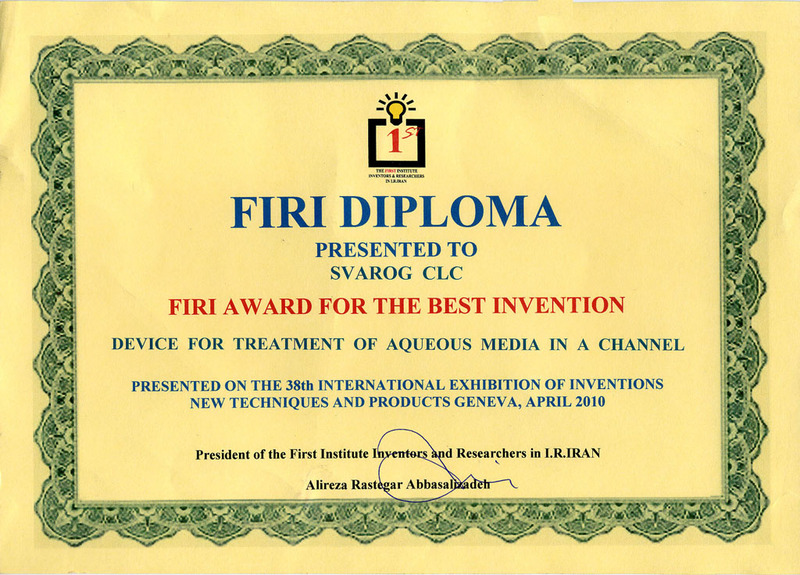 The Federal Agency on Intellectual Property, Patents, and Trade Marks of the Russian Federation has awarded JSC “SVAROG” with the Diploma of the I degree for the development of “The Method of Purification and Disinfection of Aqueous Media, the Device for Purification and Disinfection of Aqueous Media” presented at the 55 th World Salon of Innovations< Scientific Investigations, and New Technologies “Brussels - Eureka – 2006”. For our company, October was marked by the further appreciable growth of demand on “Lazur” products. The sales volume has increased by more than 6 times as compared with that of 2005. A series of new supply agreements has been signed with NIS and other foreign companies for water and sewage disinfecting equipment. During the period of August – September, “Lazur” units passed the performance trials at the Elizabeth Macarthur Agricultural Institute (Australia). The units have demonstrated high effectiveness in disinfecting water and effluent in hothouse market gardening. It is planned to supply up to 1000 agricultural farms and water recycling systems with “Lazur” units. The remarkable event has recently taken place in the activity of our enterprise: the manufacturing department and the production of JSC “Svarog” have got the Sanitary-epidemiological Conclusion №77.01.16.000.М.7794.05.06 and the Conformity Certification GOST R ISO 9001-2001 (ISO 9001:2000). 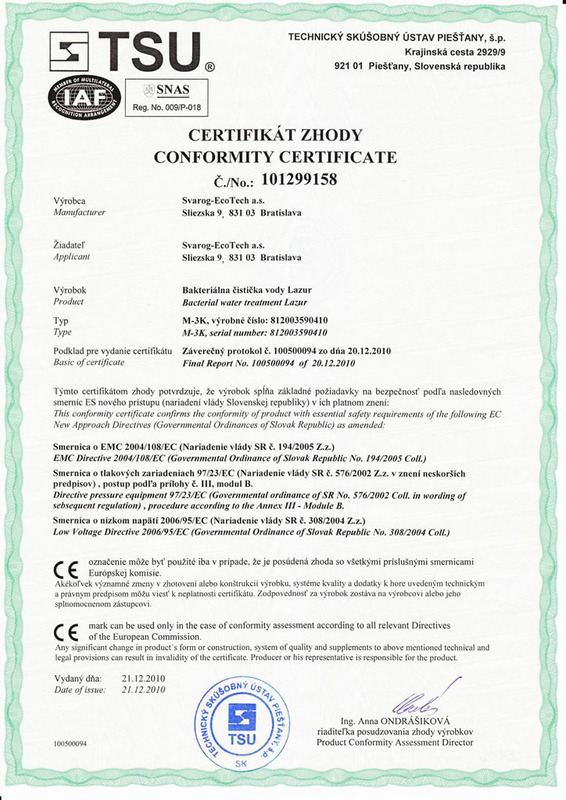 These documents officially attest the system of management quality with regard to the designing, development, manufacturing, application, technical, warranty and current service of the disinfecting units (of the “Lazur-M” series) that are employed in the systems of economy potable water supply and water recycling, as well in swimming pools, disinfection of effluent and sea water by means of ultraviolet radiation and ultrasound. Over the period of 8 months (2006) the sales volume of the bactericidal units of “Lazur-M” series for disinfecting water and sewage has increase by 4 times compared with the corresponding value of 2005. This growth does not take into account the sales of units of higher capacities of 250 and 500 m3/h. Therefore, the company is putting into operation new working areas and increasing its personnel by more than 30%. “Lazur-M” bactericidal units have successfully passed the comprehensive certification tests on water and sewage disinfection at the A.N.Sysin Research Institute of Human Ecology and Environment Hygiene of the Russian Academy of medical Sciences. The 7th International Trade Fair "ECWATECH-2006" and the Congress "Water: ecology and technology" have completed in Moscow KROKUS Exhibition Center. 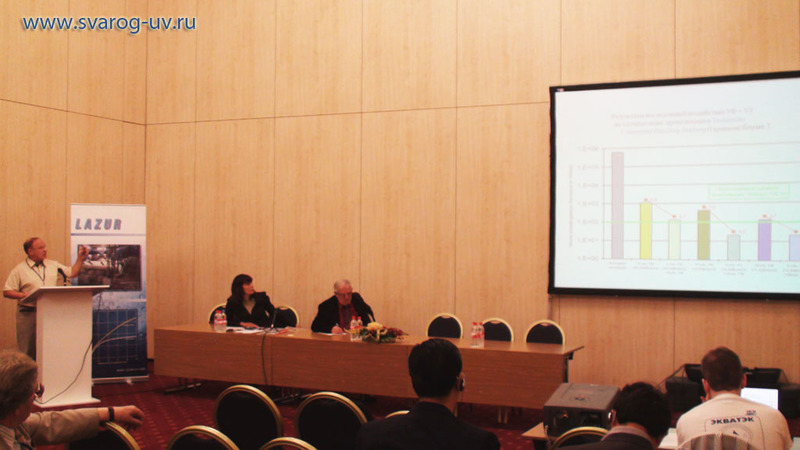 JSC “SVAROG” has successfully performed presentation of the novel equipment and took part in the work of the Congress. During the work of the Trade Fair, a series of contracts has been signed on supplies of equipment based on “Lazur' technology for disinfecting of residential and industrial wastes and potable water for total capacity of 835000 m3/day. The agreement with the “ARBAT” Co. was signed on cooperation in delivery of “Lazur'- based equipment to Czechia. IN SEVERAL PROJECTS THE CUSTOMER HAD REFUSED FROM THE USE OF TECHNOLOGY AND EQUIPMENT OF SPA “LIT' (Moscow) in favor of the alternative “LAZUR” technology. The “LAZUR” technology is distinguished by appreciably higher technical and operational characteristics, as well as by application of amalgam UV lamps with the service life of no less than 2 years and lower prices. The products of JSC “SVAROG” are successfully demonstrated in Moscow, Russia at the exhibition "ECWATECH-2006" - 7 th International Trade Fair and Congress "Water: ecology and technology". The program of trials of “Lazur-M” units for disinfecting water and sewage is successfully accomplished at several Australian universities. These trials aim the widening of application areas of “Lazur” technology. The tests of “Lazur M-250” unit have demonstrated good results in disinfecting water by ultraviolet radiation and ultrasound under the conditions of high water temperatures and pressures close to those used in water recirculation systems of industrial enterprises and power stations. The company has formed the preliminary stock of orders on 2 - 4 quarter 2006. The total volume of orders is estimated as 12,000,000 Euro. To the most part, it includes the supplies of equipment for ultraviolet and ultrasonic disinfection of potable water and treatment of industrial and residential waste waters with a total capacity of over 1000000 m3/h. In frameworks of the Australian Government program (AUS TRADE) of humanitarian activity in Africa, the supply of bactericidal water treatment “Lazur-M” units developed and fabricated by JSC “SVAROG” to the Republic of South Africa has been proposed. It is preliminary planned that the Joint Russian-Australian Venture, “"Omni Environmental Group Pty Ltd" will perform the delivery of “Lazur-M” units. The participants of this initiative are convinced in wide prospects of effective large-scale applications of “Lazur-M” units in the countries of Africa where the problem of pure water supply is extremely urgent. The preproduction of “Lazur” series units is completed at Tushinskiy Engineering Plant, Moscow. The production space comprises 3000 square meters. The research an experimental basis of the company is expanding. The additional 300 square meter areas at SUE “Geophysics – TNV” (Moscow) are prepared for arranging test benches of water-purifying equipment. JSC "Svarog" has delivered the large party of Lazur-M units to Australia. Preliminary agreement with the Iranian company "Tabeshe Noore Derakhshan" was signed on participation of JSC "Svarog" in a series of government programs for water treatment in various regions of Iran. 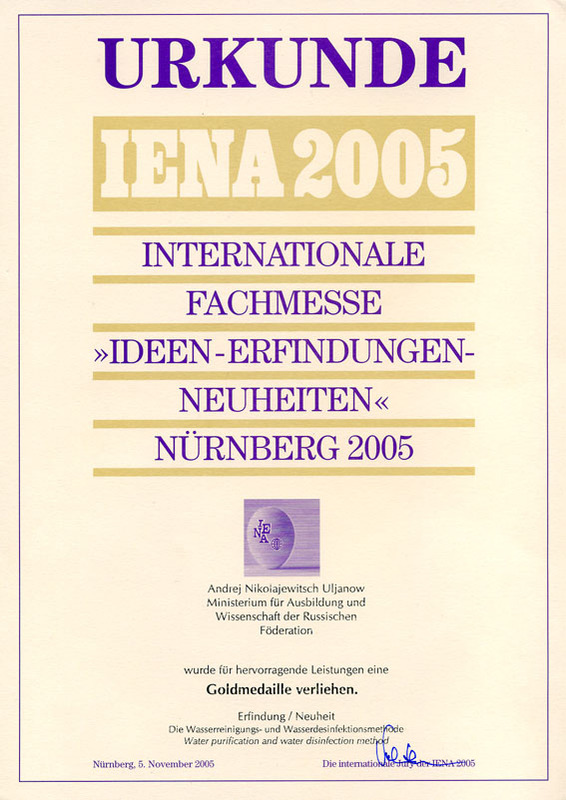 The products of the company have received the highest reward at the International Exhibition “Ideas – Inventions – Novelties” (“Ideen - Erfindungen - Neuheiten” (IENA 2005)) in Nuernberg, Germany. JSC “SVAROG” has carried on constructive negotiations with the Australian government authorities on cooperative activities in supplies and applications of “Lazur” equipment for solving urgent problems of water supply for various objects of housing and communal services. Special seminar on state-of-the-art methods of water treatment based on application of ultraviolet and ultrasound for water and/or sewage disinfection took place in Kazan, the capital of Tatarstan republic. This seminar was organized for head managers of housing and communal services and water industry from all the regions of Tatarstan. Dr. Andrey N. Ul'yanov and top managers of the republican Ministry of construction and housing and communal services guided the work of the seminar. Several contracts and agreements on cooperative works and supplies of water treatment equipment between JSC “SVAROG” and organizations of Tatarstan housing and communal services have been signed. 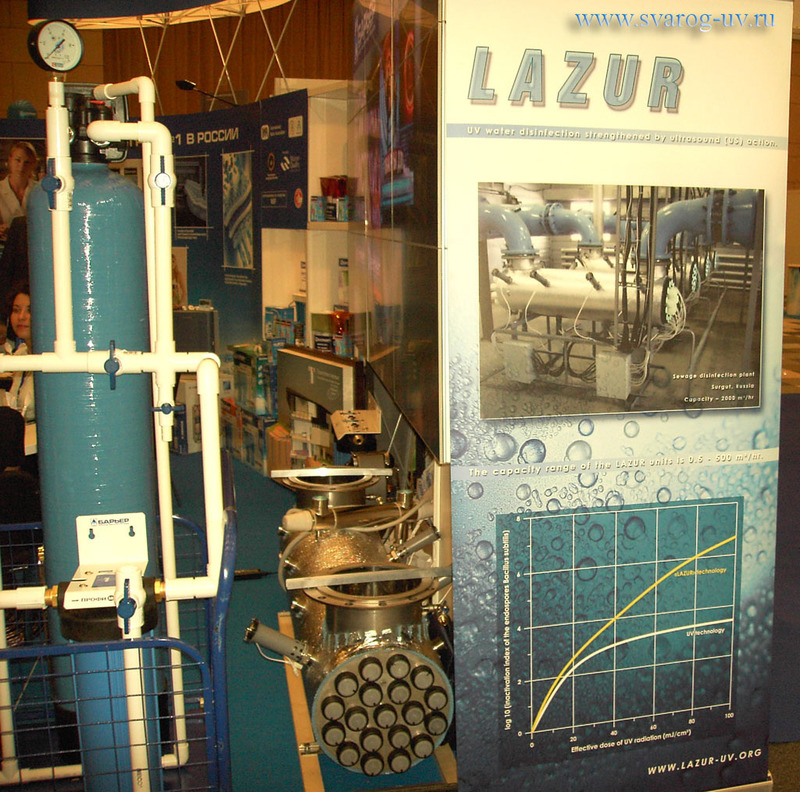 The integrated setup for water purification and disinfection based on “Lazur- M 0.5” ultraviolet and ultrasonic unit was demonstrated at the Second Specialized Exhibition “Business Undertakings in Housing and Communal service of Moscow City” (September, 19-21, 2005). Our exhibit was widely lighted by periodical press and TV. The development of the new series of “Lazur-M” units of 100, 250, and 500 m3/h capacities is completed. The certification of these units shall be finished in September. Already now JSC “SVAROG” has got appreciable orders for these modules for subsequent applications in the stations of capacity from 30,000 to 7000,000 m3/h. JSC “SVAROG” has put in operation the new assembly shop in Moscow. The working area of the shop is 300 m2. The assembly shop has passed the corresponding hygiene and sanitary certification. The ever-growing interest to the products of our company is observed in Australia where sales go of our units are accompanied by testing and certification procedures in several states. The comprehensive certification tests of the “Lazur-USV” field unit for designed purification and disinfection of water (up to 1000 l/h) have been successfully completed in Russia. “Lazur-USV” unit has passed demonstration trials in Australia. The products of JSC “SVAROG” were presented in the state of New South Wales, Australia. The corresponding agreements on product supplies have been negotiated. The Joint Venture with the Omni Environmental Group Pty Ltd. was established. The activity of this Joint Venture will be directed to organization of joint manufacturing of equipment, marketing, and promotion of the products to the markets of South East Asia region. Preliminary evaluated volume of supplies and sales of the water treatment equipment is to be at a level from 20 to 30 million US dollars per year. 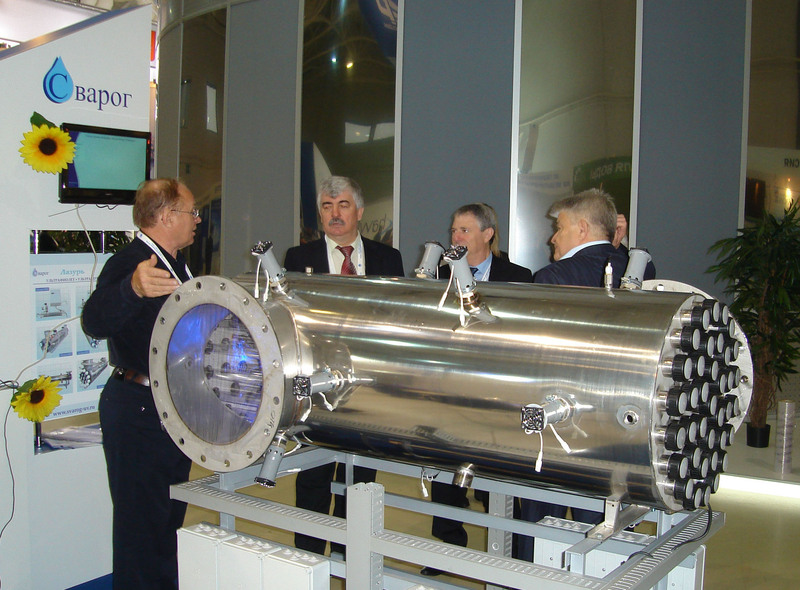 The products of JSC “SVAROG” are successfully demonstrated in Japan at the exhibition “EXPO-2005”. 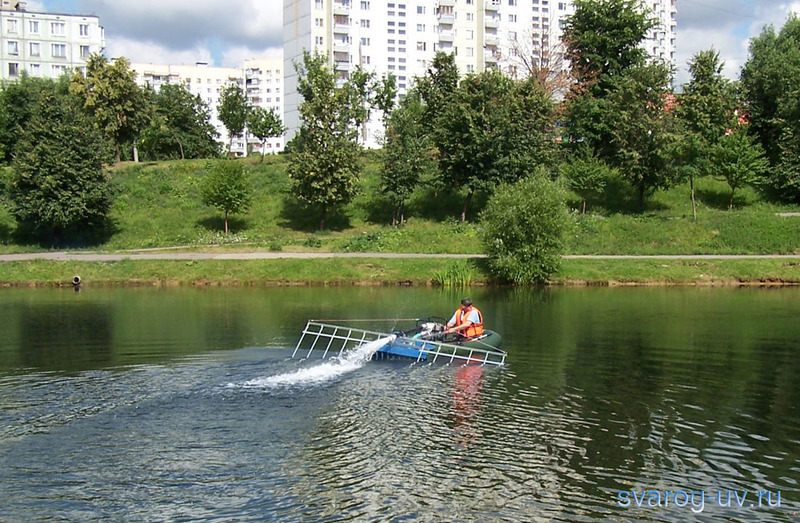 “Lazur-USV” units are passing test and field trials for integrated purification and disinfection of surface water. The creation of joint Russian-Australian company for performing large government orders is expected within May-June period. Waters disinfection units of “Lazur” series have passed microbiological tests in the Sysin Institute of Human Hygiene. The achieved effectiveness of “Ultraviolet + Ultrasound” action with respect to the main microflora types no worse than 4LgNinput./Noutput. This result demonstrates very good effectiveness with regard to the international standards and confirms the data of test measurements, which had been performed earlier in the South African Republic, New Zealand, Israel, and South Korea. JSC "SVAROG" and the group of Israel companies have signed the agreements on cooperation and contracts for delivery of equipment. The negotiations with Slovak, German, and Russian companies have been conducted followed by working out the program of cooperation and organization of Technopark on the territory of the European Community (Slovakia). 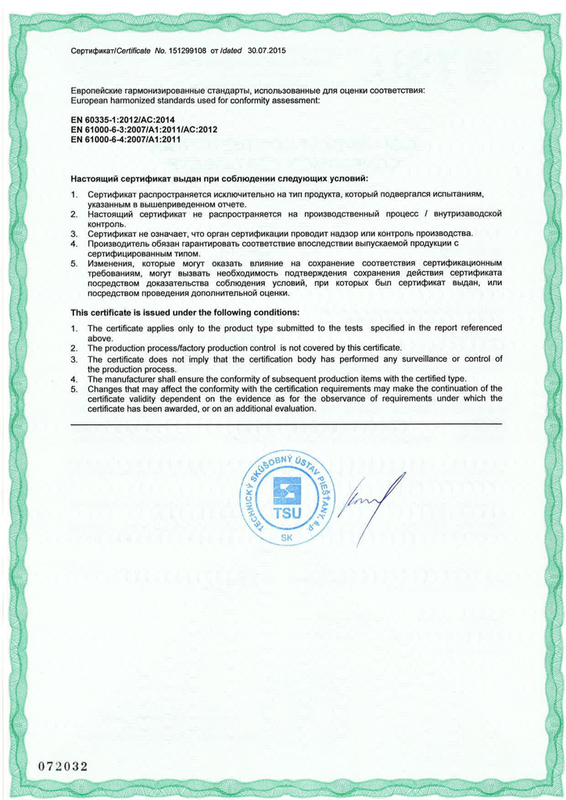 The new assembly shop was certified by the Gosstandard Federal Agency. The shop will produce the series of Lazur units. 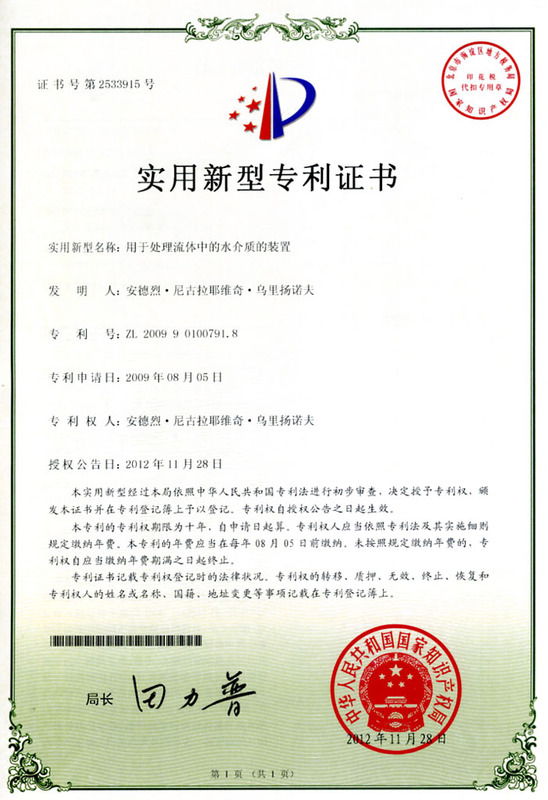 The corresponding Gosstandard certificate was issued. The meeting in the Ministry of Housing and Communal Services was conducted. 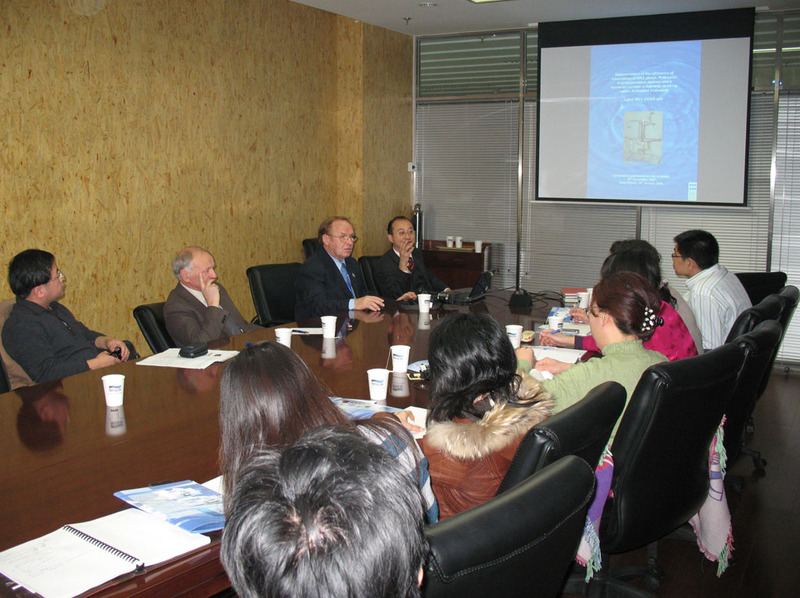 The program of application of “Ultraviolet + Ultrasound” technology in a series of regions was laid down. JSC “SVAROG” has carried on negotiations with the KAL BINYAN TARMAC Ltd. company (Israel) on cooperative programs in the field of purification of municipal effluents in large settlements. The contracts on delivery of water treatment equipment have been signed with oil-and gas refining companies of Byelorussia. The certification of the “Lazur-UVS” bactericidal water treatment units employed in the field conditions by the Ministry of Extraordinary Situations and armed forces has been completed. “LAZUR” units have successfully passed experimental tests in Dubai (the United Arab Emirates) at the station of effluent purification. The negotiations with the government of the Republic of South Africa have been completed successfully. The vast program of cooperative works was accepted. The representative office of JSC “SVAROG” was opened in Pretoria city. 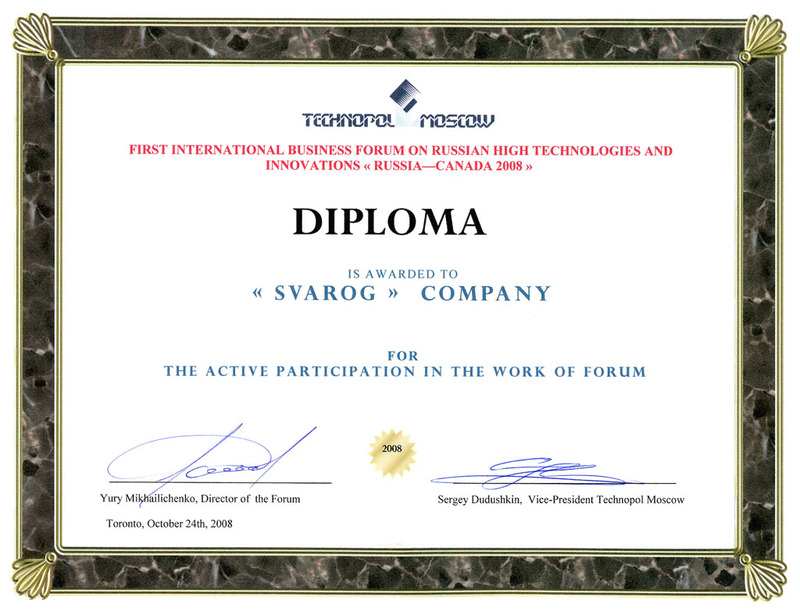 JSC “SVAROG” was officially included in the list of the exhibitors of the World Exhibition EXPO-2005 in Japan (Tokyo, February 2005). The promising visit to the Republic of India was performed. During this visit, the programs of cooperative activities with the authorized Indian government officials have been discussed. The contractual relationships with "Magnetic Technologies" Company (L.L.C.) (Dubai) have been established, which foresee the delivery of equipment to the region and participation in a series of Government programs in Australia and New Zealand.The hearing on the problems of water supply for the population of Russia and elaboration of corresponding standard acts was held in the State Duma (Parliament of the Russian federation) with participation of the Duma Committee on ecology. Mr. A.N. Ul'yanov, the President of JSC “SVAROG” gave the report at this hearing. Direct negotiations were carried with a group of companies from the Republic of South Africa and Holland. The established contractual relationships foresee realization of large-scale projects on water supply for population on the territory of the Republic of South Africa and on purification of industrial wastewater in some provinces in frameworks of the government programs. The first production samples of amalgam lamps of new generation were put on the market. These new lamps are characterized by much longer service life (up to 16000 h) and slow decay in the radiation flux power. For this model line, the lamp rating varies as 60 W, 150W, 200 W, and 400 W, the fraction Ultraviolet radiation being 35%. By the end of service life, the decay in radiation power is no more than 20%. The important meeting was held in the system of the Ministry of Foreign Affairs of Russia. This meeting aimed the realization of the new tasks issued by the President of the Russian Federation for the Ministry, in particular, for promotion of new prospective technologies abroad. The meeting resulted in working out the program of cooperative activities and signing corresponding agreements with the ministry departments. The specialized exhibition on application of ecologically clean technologies took place in the State Duma (Parliament) of the Russian Federation. 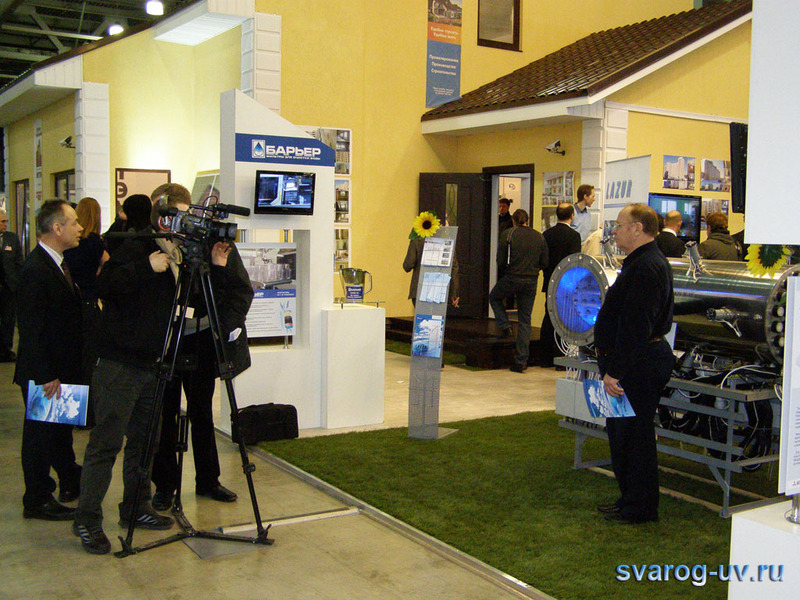 JSC “SVAROG” jointly with its strategic partner, “MAXMIR” company has participated in the exhibition. The leaders and experts of the major Duma committees have got acquainted with the presented technologies. A series of important decisions on application of the advanced “Ultrasound + Ultraviolet” technology in Russia was adopted. Compact “Lazur-UVS” units intended for purification and disinfection of water under field conditions (up to 500 l/h) have successfully passed certification tests. We have already orders for delivery of these units from the Ministry of Defense and Ministry of Extraordinary Situations of Russia and from the enterprises of oil and gas-and-oil producing industry as well as from the regional organizations of the extreme Northern territories of Russia. In 2003 the Company had registered extraordinary success for more than 10 year of its activities. Ultrasound and ultraviolet simultaneous impact technology is widely used in drinking water and waste treatment disinfection stations practically in all Russian regions and in CIS. Our product is in stable demand in some countries in Asia, Africa and Europe. Our specialists' reports caused great interest at the International Congress on Ultraviolet technologies in Vienna, July 2003. Some leading firms (Trojan, Wedeco, etc.) expressed willingness to buy the license for “Lazur–M” units production in Canada, Germany, Republic of South Africa and India. The total volume of produced and sold equipment amounted in terms of productivity per day – 300000 m3. The company is the Russian leader in sales of disinfection units for swimming- pools and aqua parks. The sales volume of waste disinfecion units has increased in more than12 times. Last year “Ametist –UV3” compact unit (productivity - 500 l/h) for water purification in emergencies started to be successfully produced. This unit is in great demand in villages and small settlements. It is used for treatment of bog water and water containing oil products . The ultrasound units are constantly being improved and it allows to broaden the technology covering area, and use it in meat and milk processing industries.